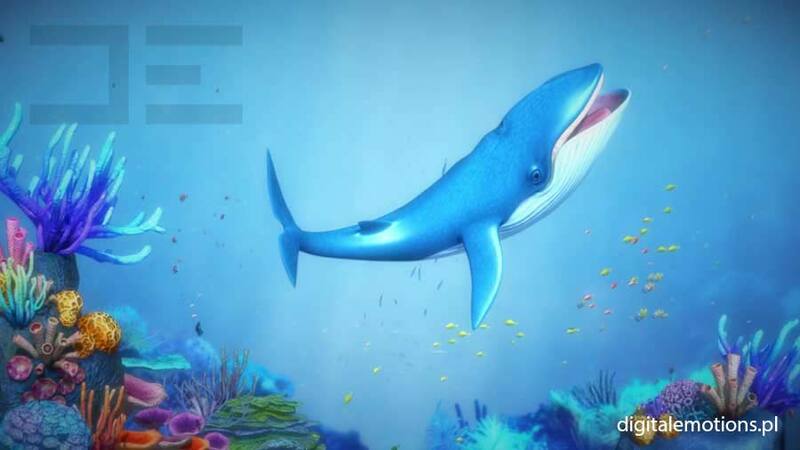 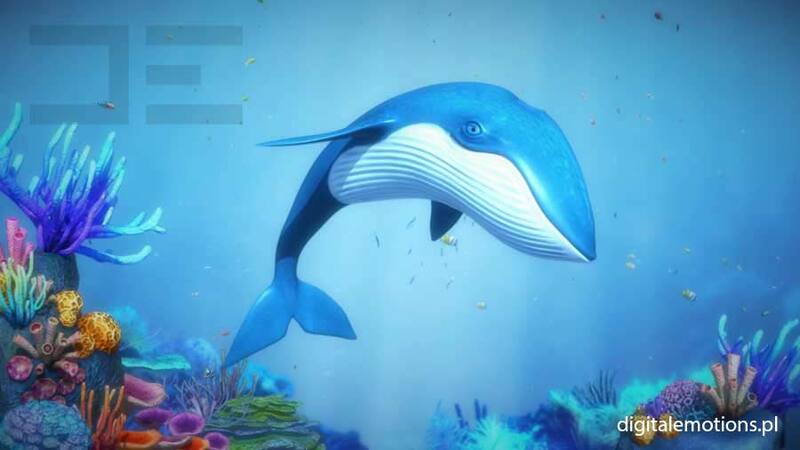 Bluey the Whale is a unique, interactive, one-of-a-kind Whale, which you can talk to just about anything. 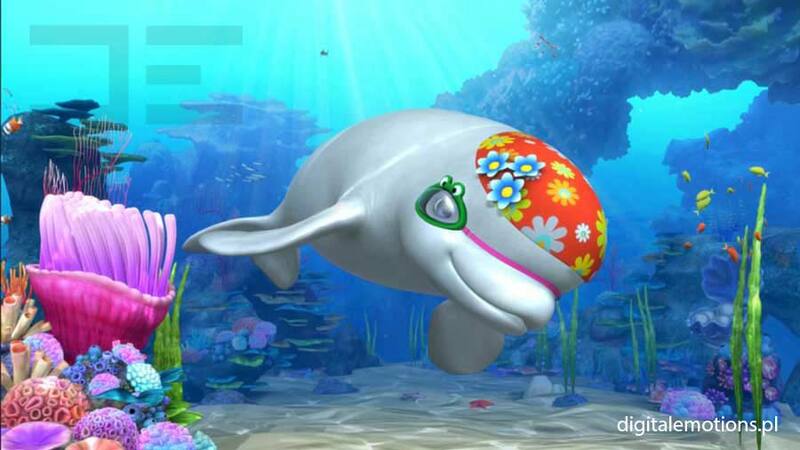 Bluey the Whale is a unique, interactive, one-of-a-kind Whale, which you can talk to just about anything. 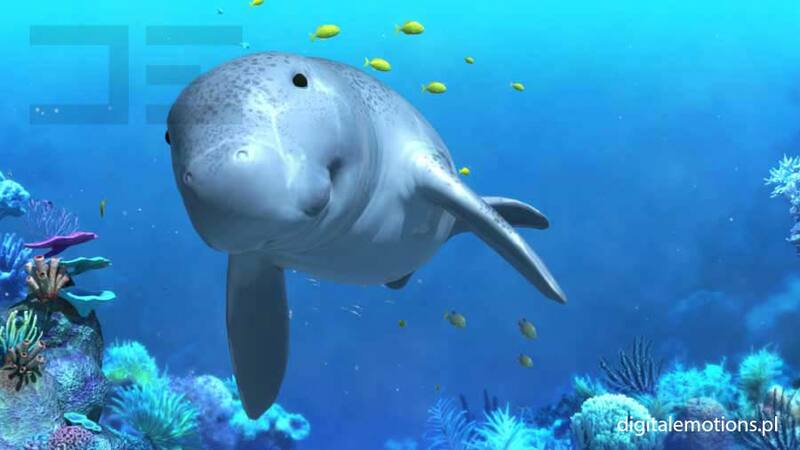 This mammal of outstanding intelligence can surprise with its knowledge and eloquence. 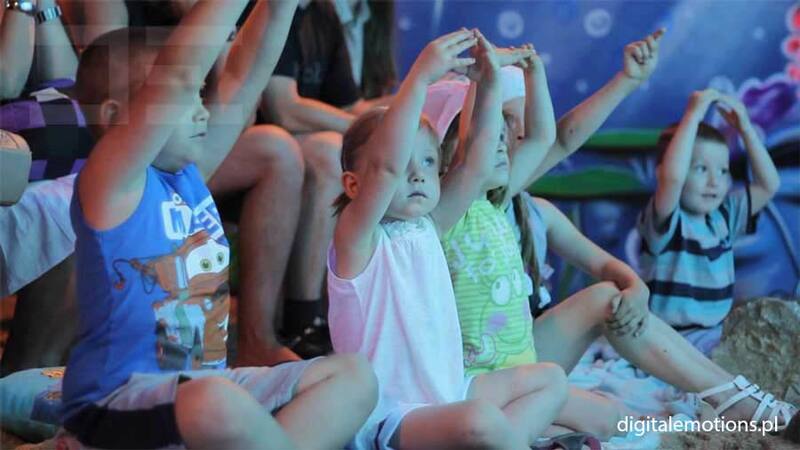 It entertains through teaching, teaches through entertainment, and it does it with great sense of humor. 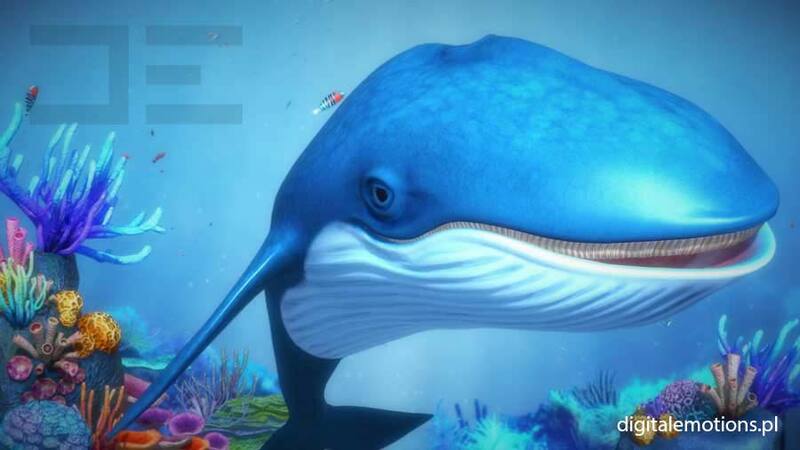 You will explore the secrets of deep ocean in an original, compelling way. Bluey the Whale is a big friend of all children – not only the younger ones, but older as well. 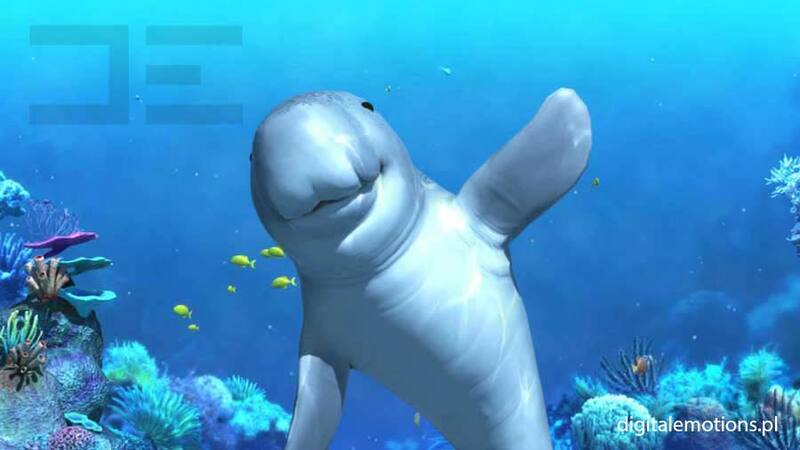 He’s a great discussion companion that will stay in their memory forever. 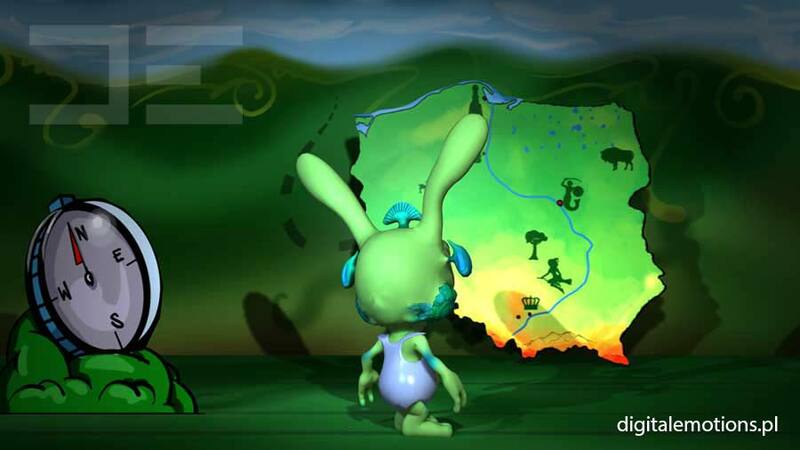 He’s a character that reaches to imagination and evokes emotions in an incredible way. 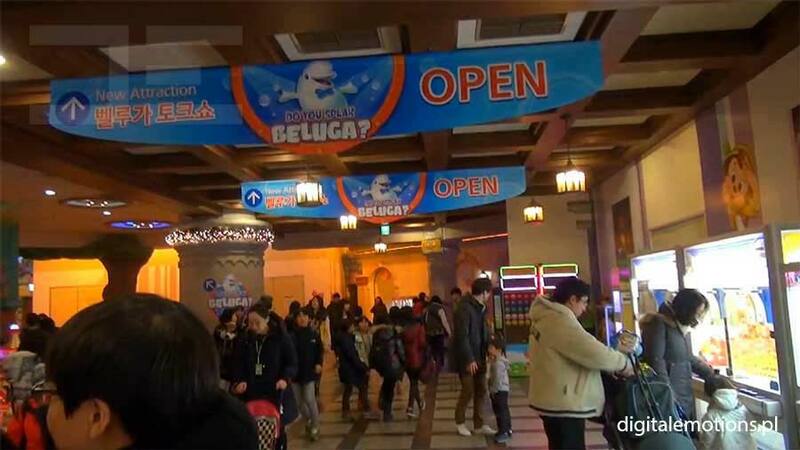 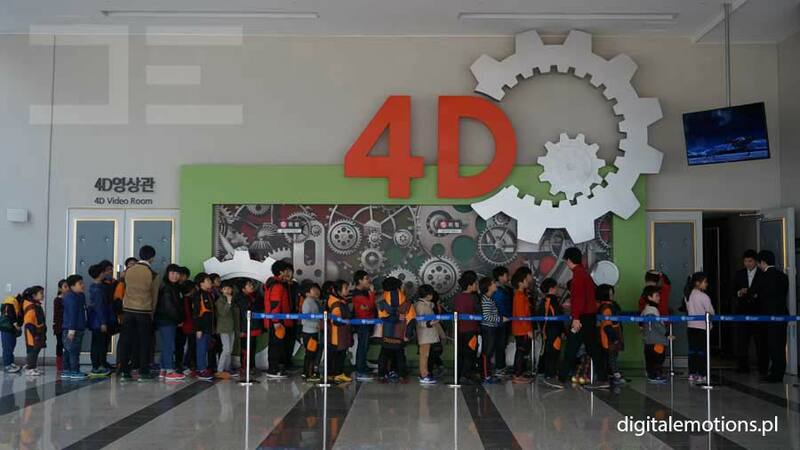 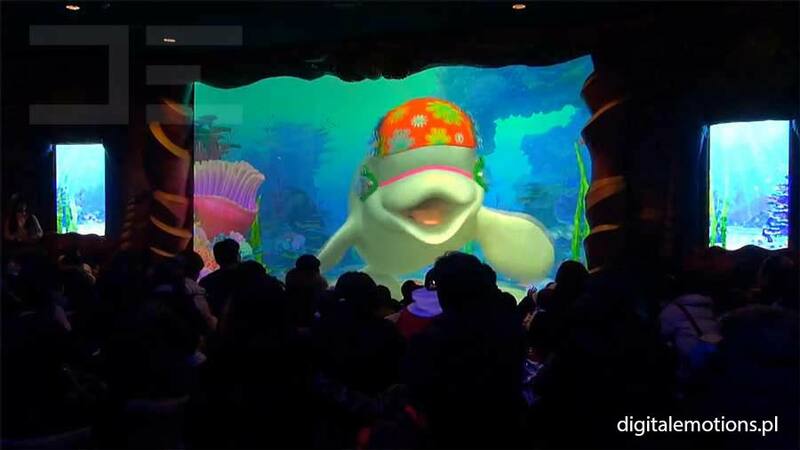 Created by Digital Emotions, a system of live interactive character animation is the pride of one of the largest amusement parks in the world Lotte World in South Korea. 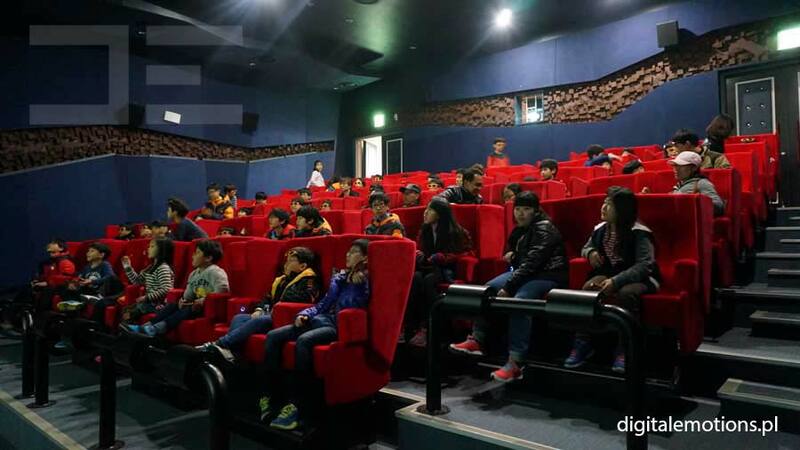 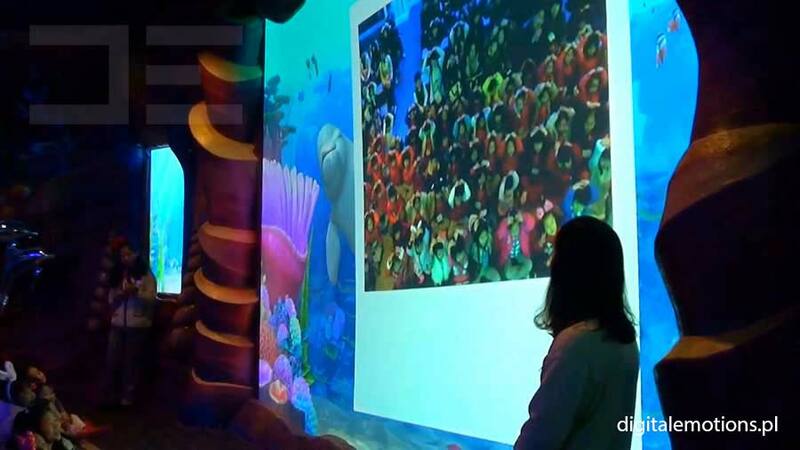 Created by Digital Emotions, the system of live interactive character animation is the pride of one of the largest amusement parks in the world Lotte World in South Korea. 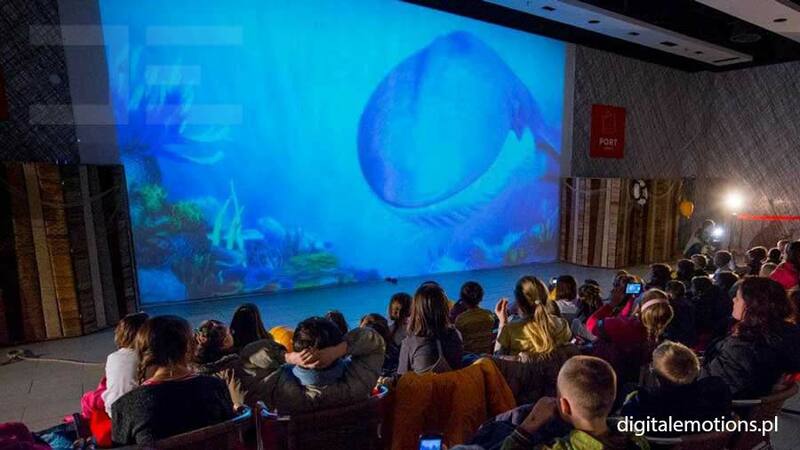 New projection room was constructed specially for the show. 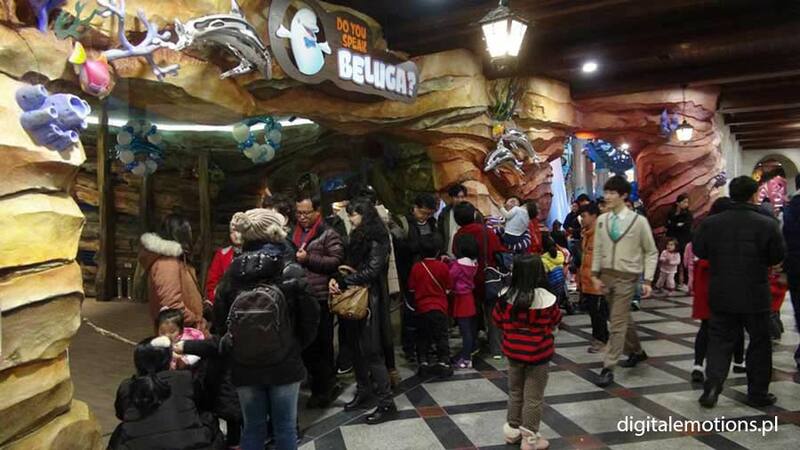 Thousands of thrilled park guests walk through it every day. 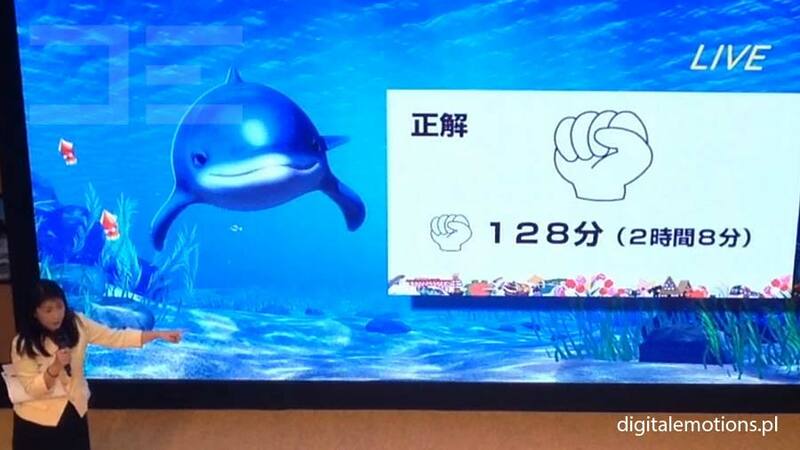 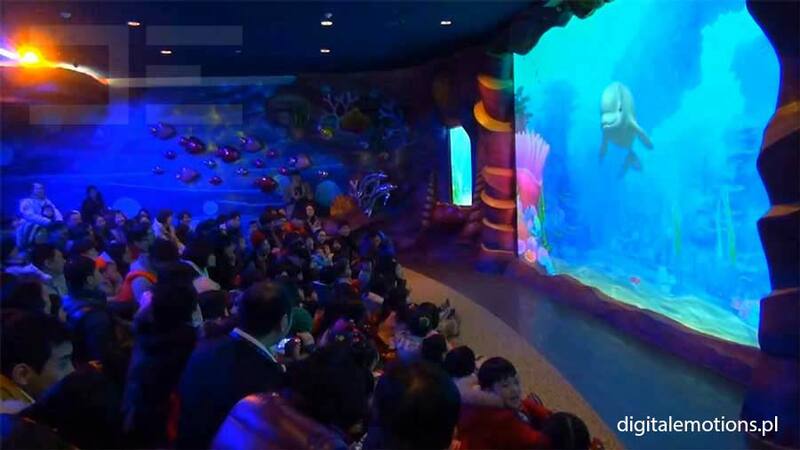 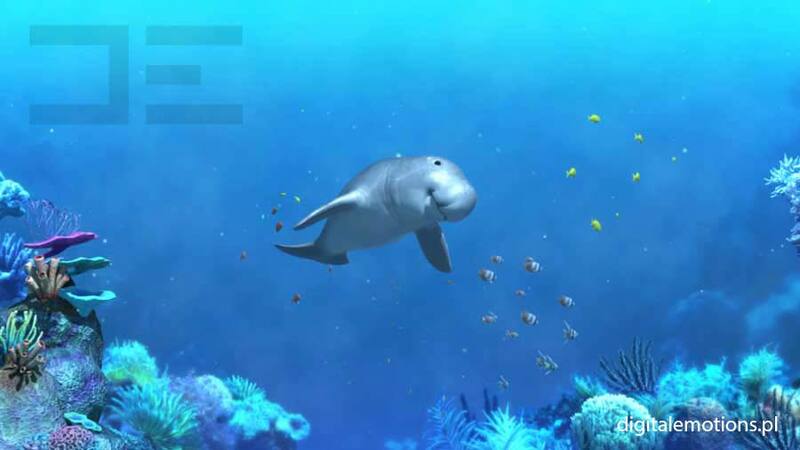 They are impressed not only by the dolphin called Beluga teaching tourists its language, but also by an interactive background packed with shoals, sea plants and animals. 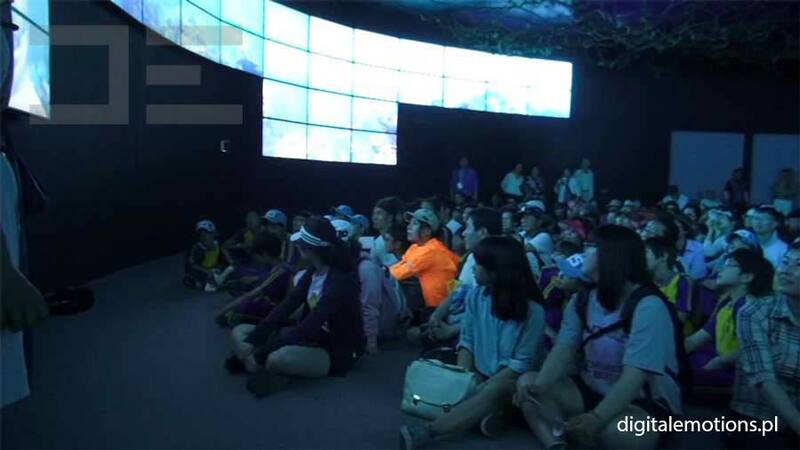 During YeoSu Expo in South Korea out character was telling stories to millions of visitors about the dangers seas and oceans face today. 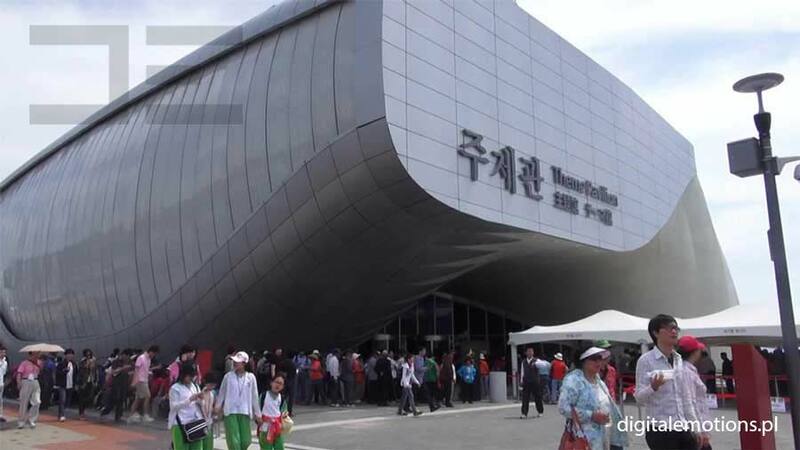 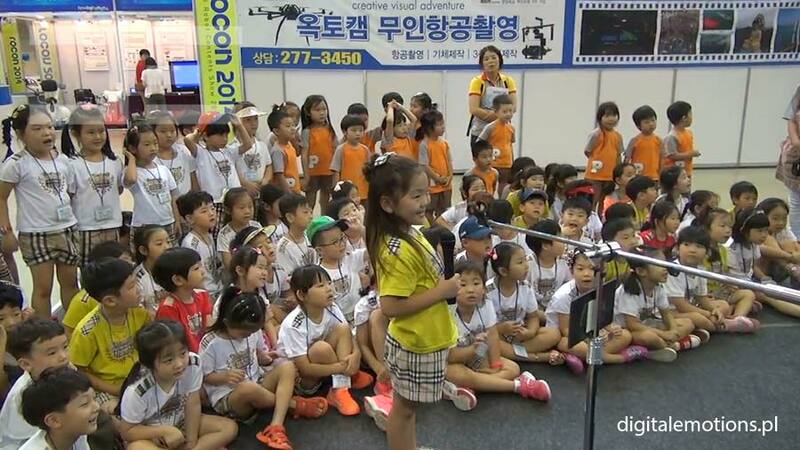 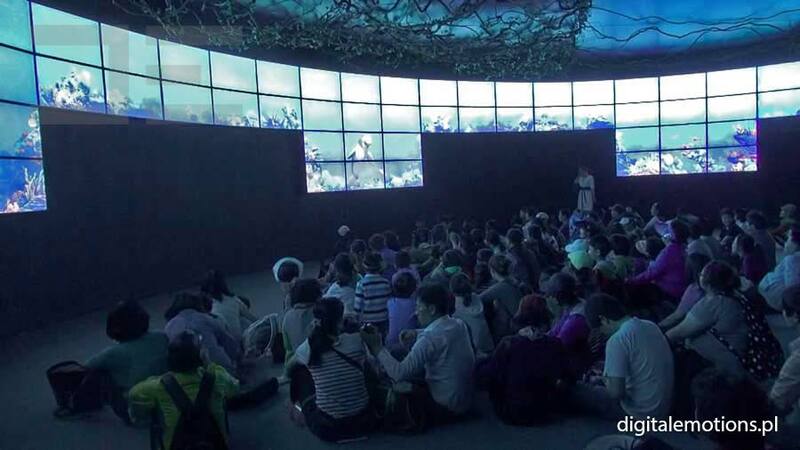 During YeoSu Expo in South Korea millions of visitors listened to our character telling stories about the dangers seas and oceans face today. 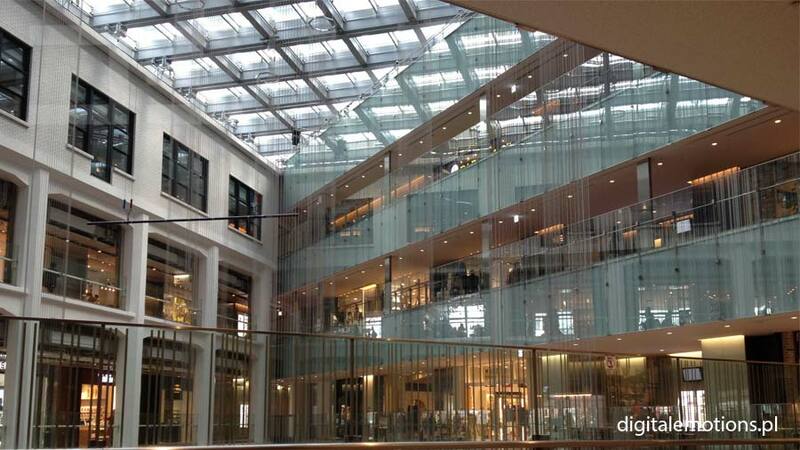 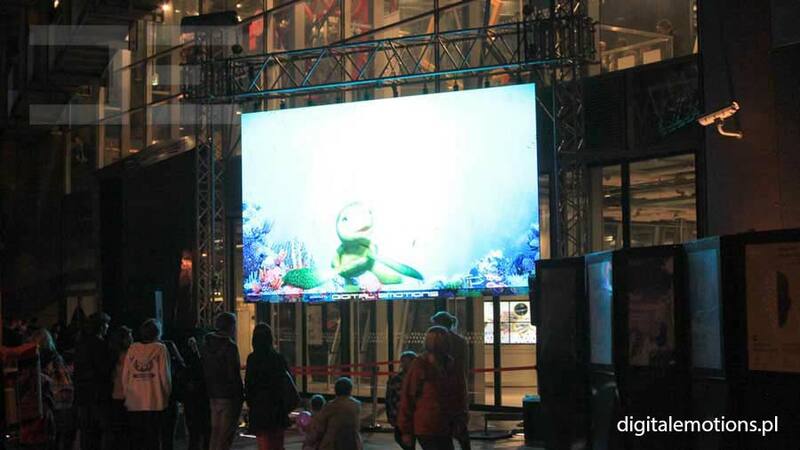 We have constructed a large installation on 72 high resolution screens. 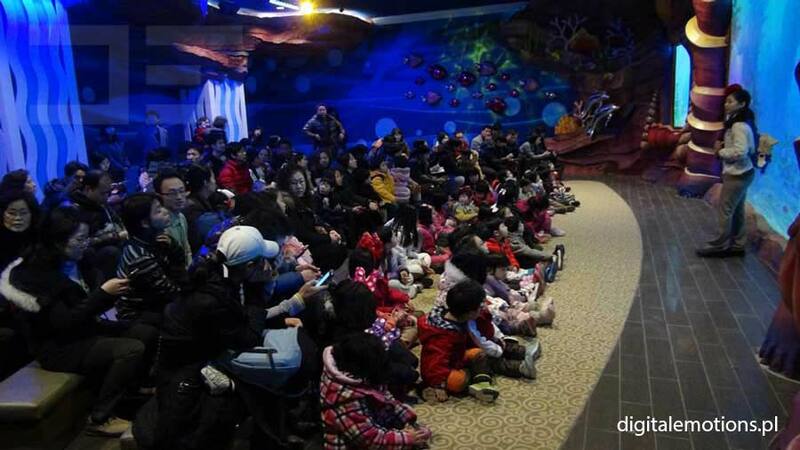 We have performed 65 shows everyday, each time for about 350 guests. 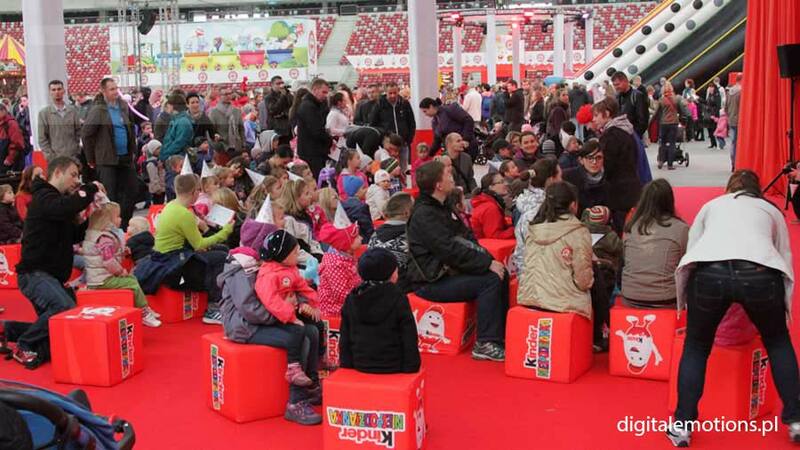 The Fairs were a spectacular success for us. 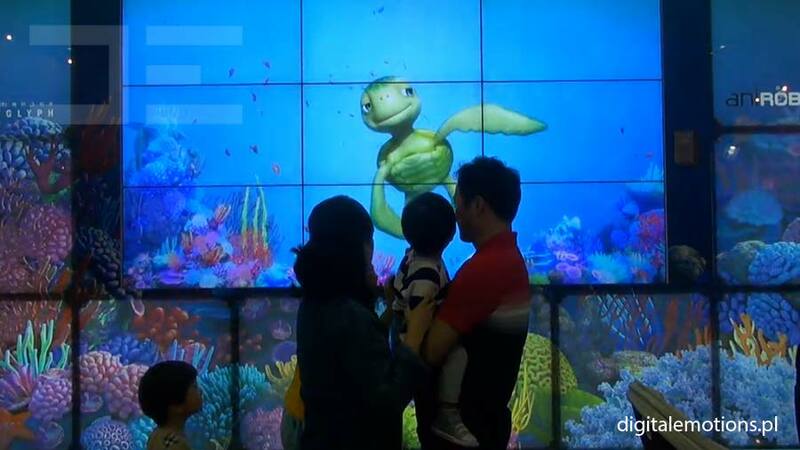 A delighted visitor was what mattered to us the most. 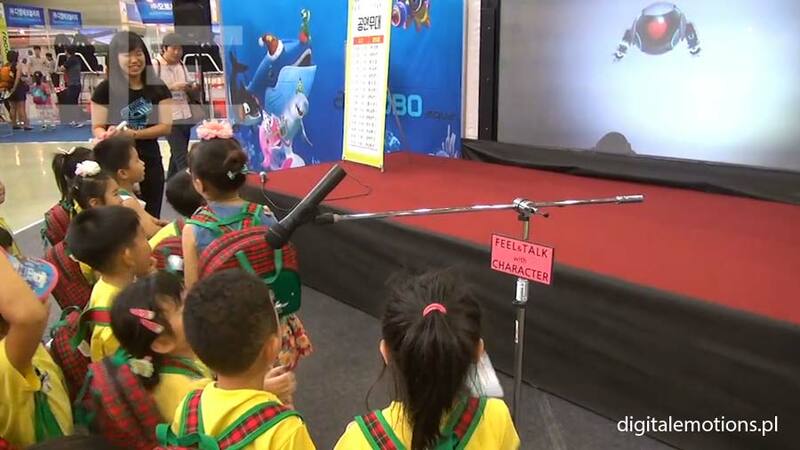 Joy is an example of a character specializing in giving lesson- or quiz-based shows for children. 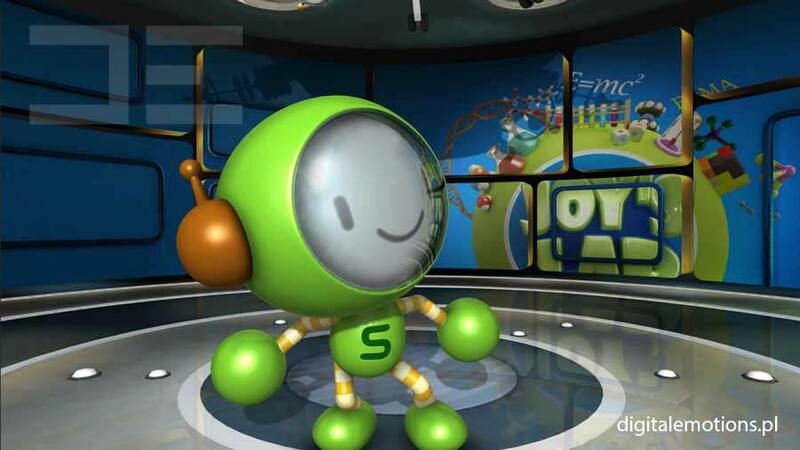 Joy is an example of a character specializing in giving lesson- or quiz-based shows for children. 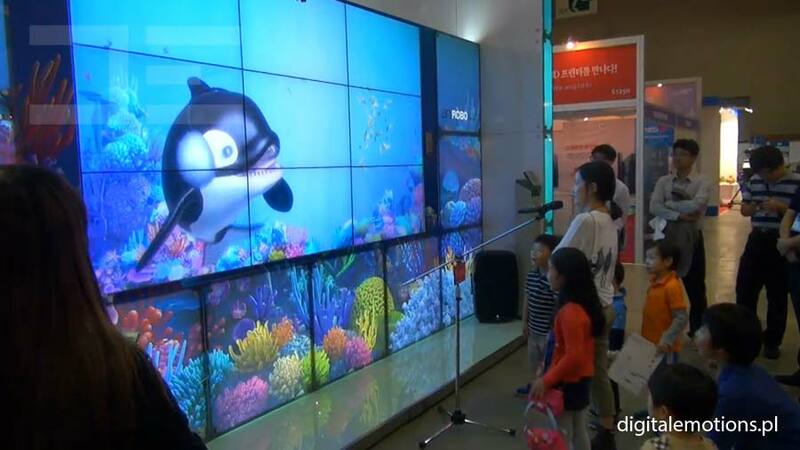 It uses movable panels for displaying charts, problems, questions, math tasks or pictorial tasks. 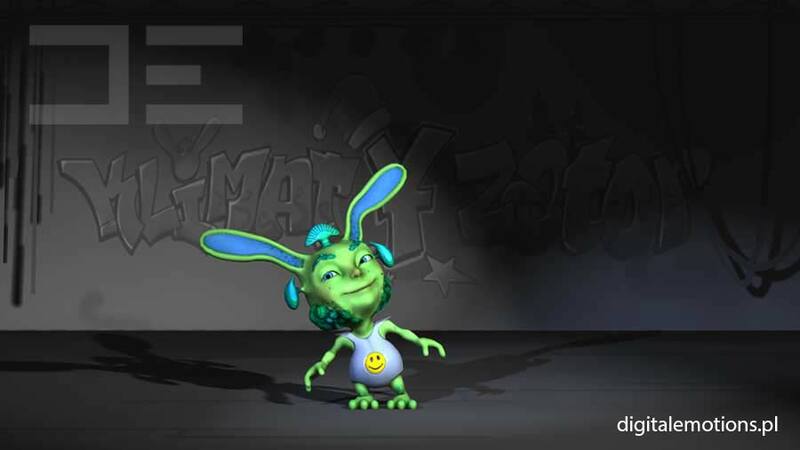 Learning with an interactive character is done in the form of an attracting quiz – it yields wonderful educational results. 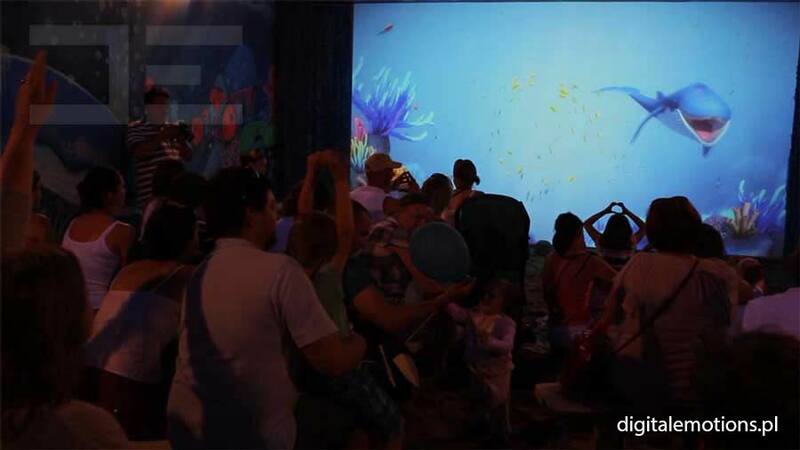 Of course our hero isn’t devoid of emotions and does everything to make children love it. 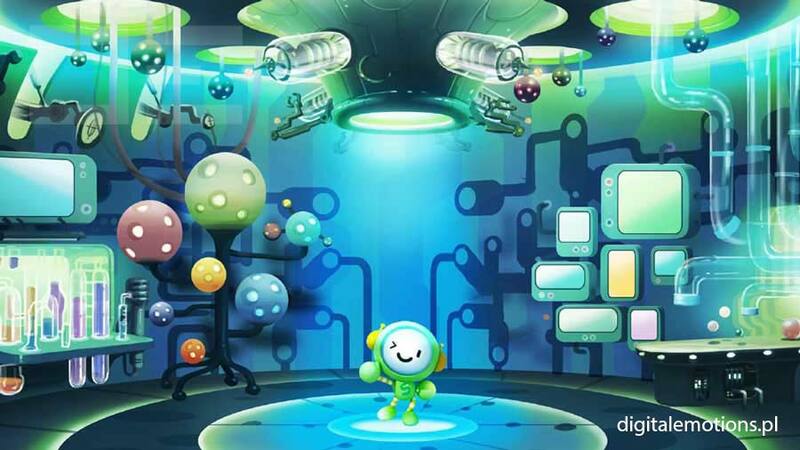 A visit to the Joy laboratory is an education combined with great fun. 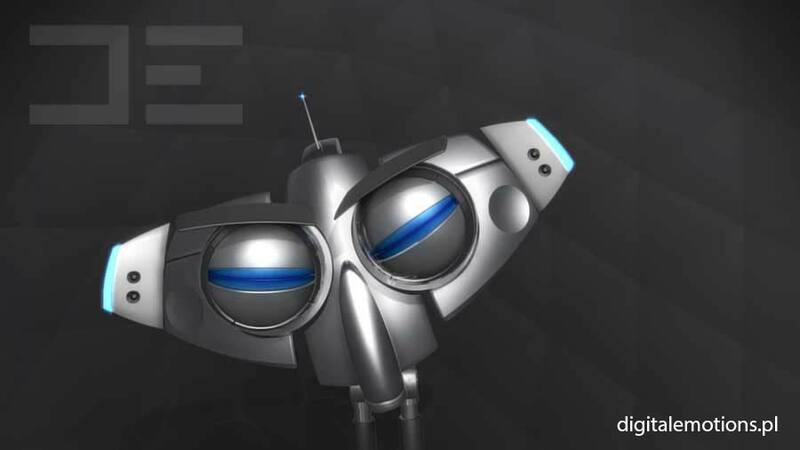 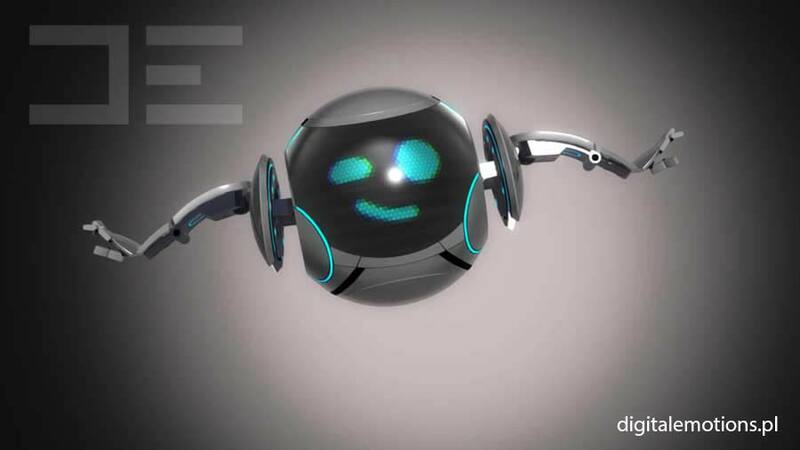 iRo is an advanced robot that can transform and adapt in various ways. 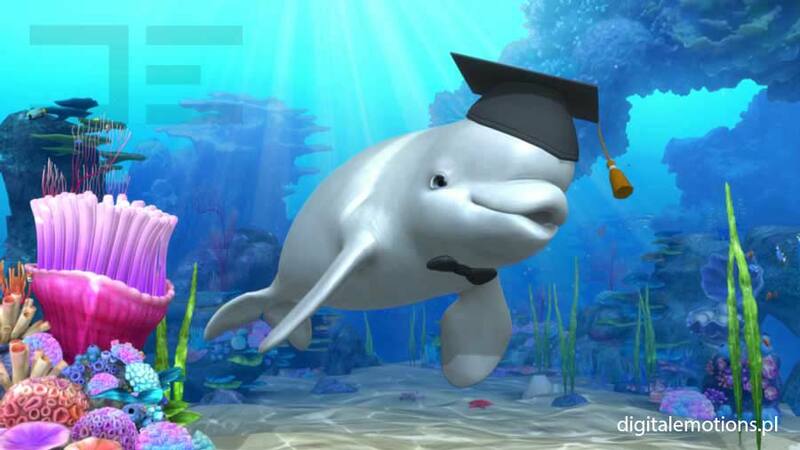 An expert in many different fields of knowledge. 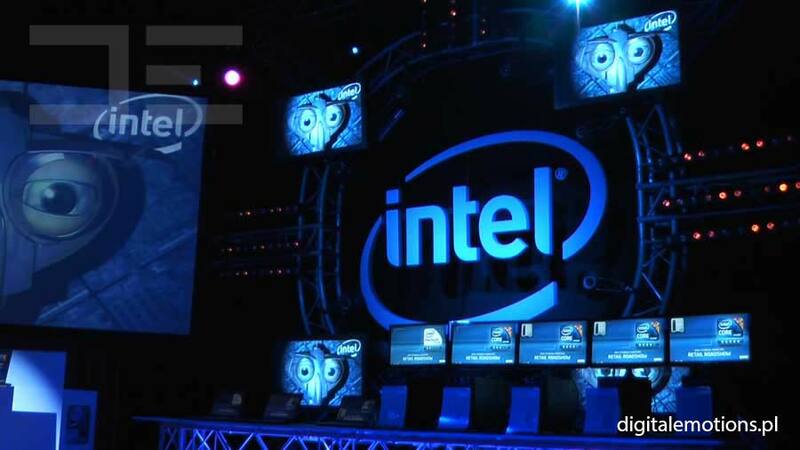 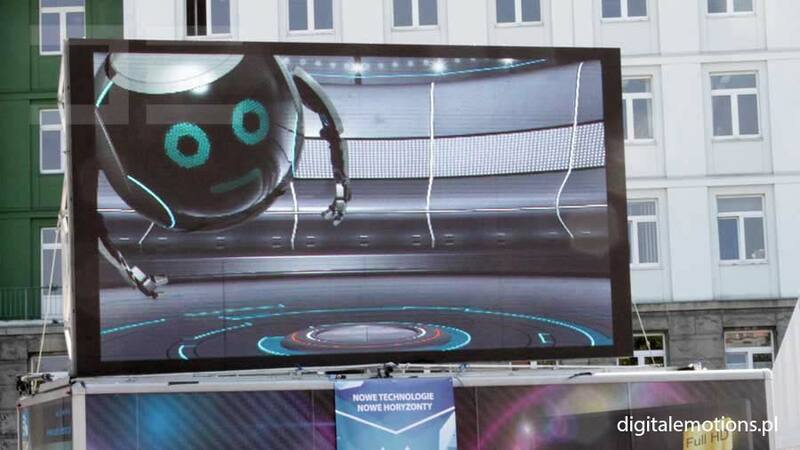 It is an indispensible assistant during technology-related events. 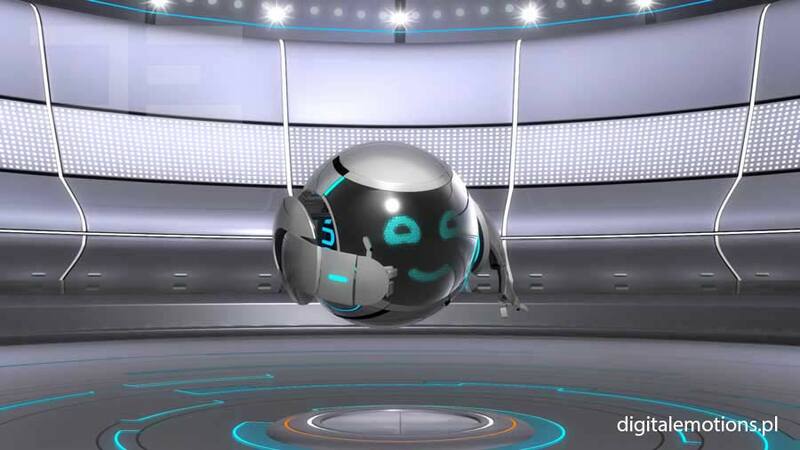 It is a flying character, a master of air acrobatics. 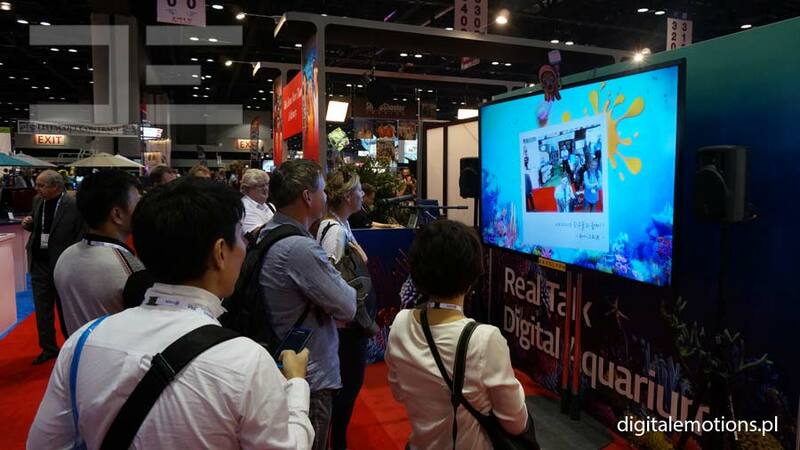 It has built-in elements such as photo camera taking pictures of the crowd, or a projector allowing to display some educational materials. 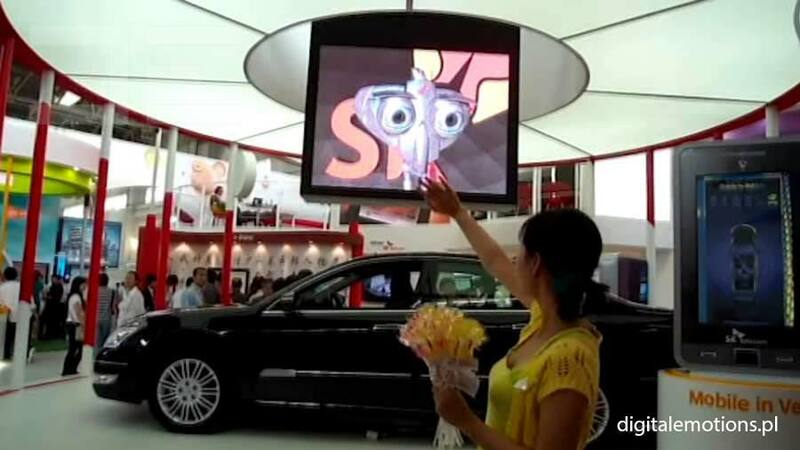 It is a wonderful promoter of new technologies and a marketer advertising products. 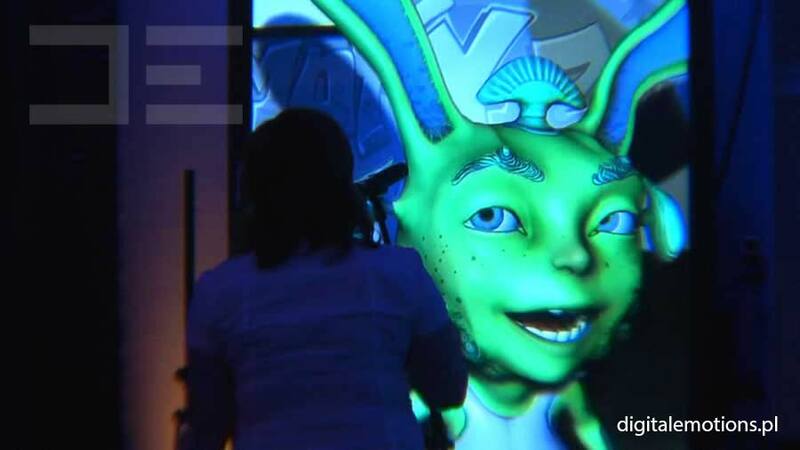 It is a character from the future, it brings up images of the science-fiction world and takes the viewer into the world of modern technology at highest levels of advancements. 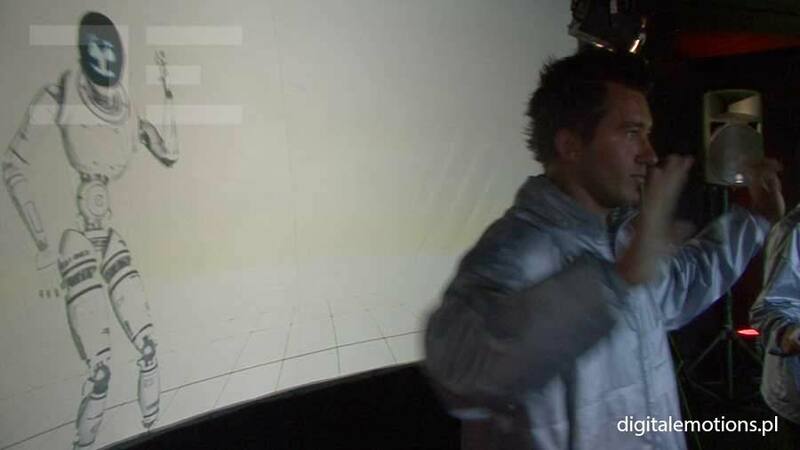 A great example of advanced line of avatars controlled by two actors using a system of controls and full motion capture that transforms human movements onto a virtual character. 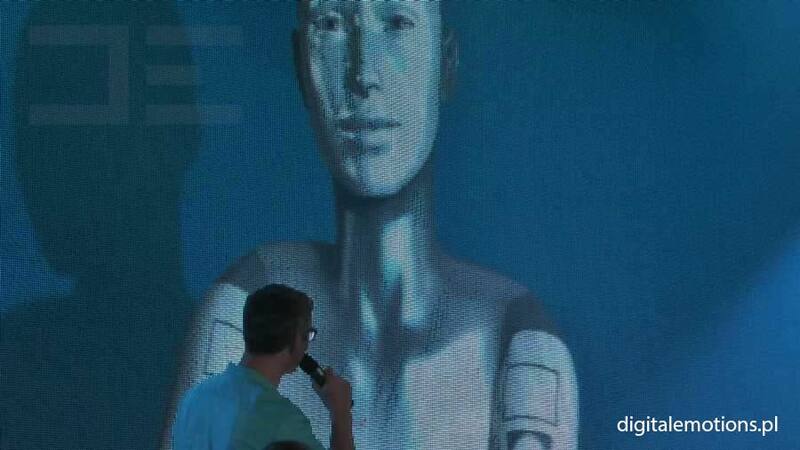 NOVIA is displayed in a 1:1 scale, which gives a realistic impression of a real talk with another human being. 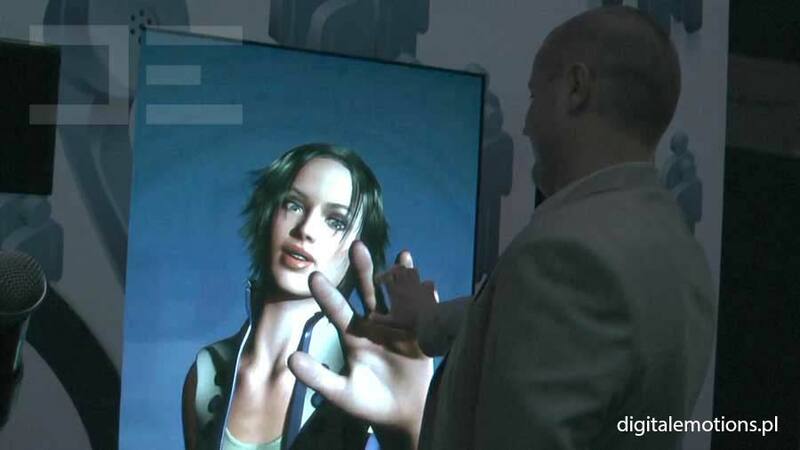 An attractive woman grabs and focuses attention on a client’s product and brand. 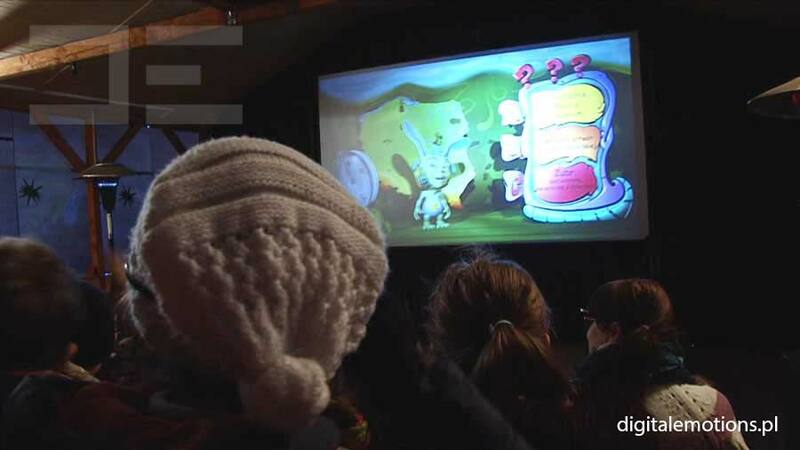 The audience joins the fun which effaces the boarder between the real and digital worlds. 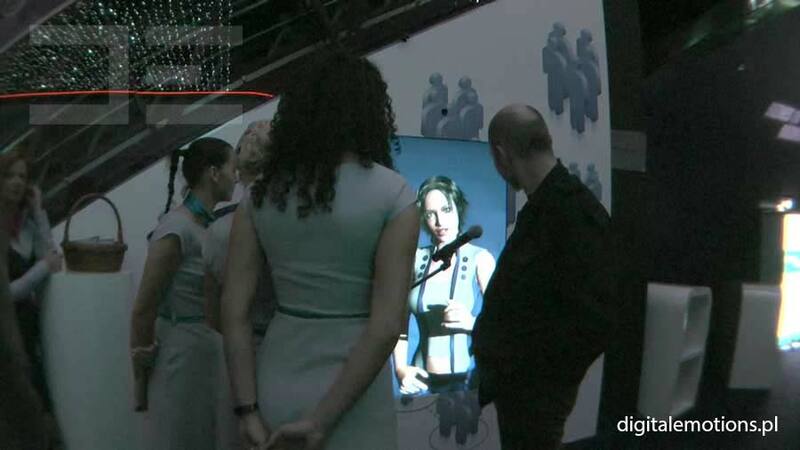 Our virtual character base holds dozens of characters. 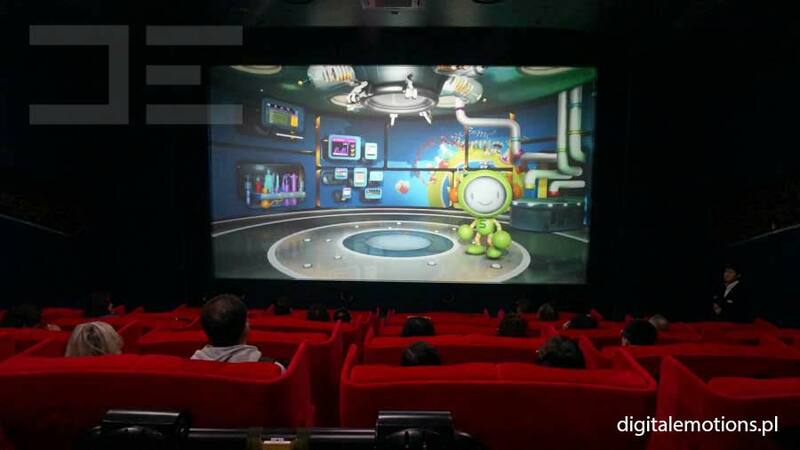 Film premiere. 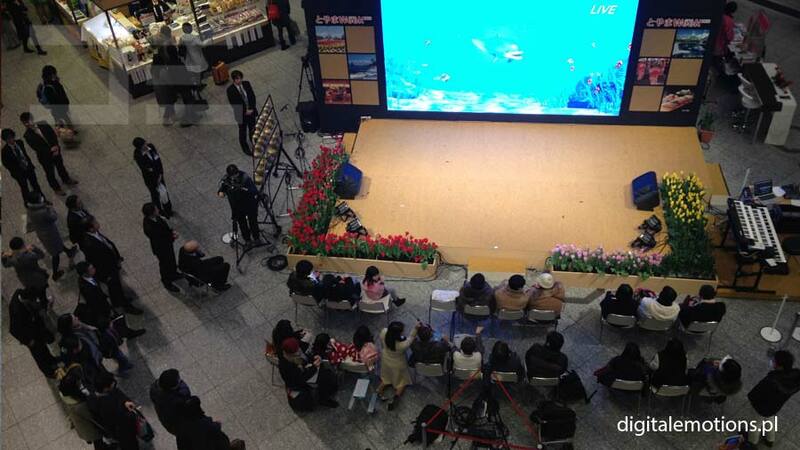 Traditionally there are guests, lectures, marketing materials, and the film. 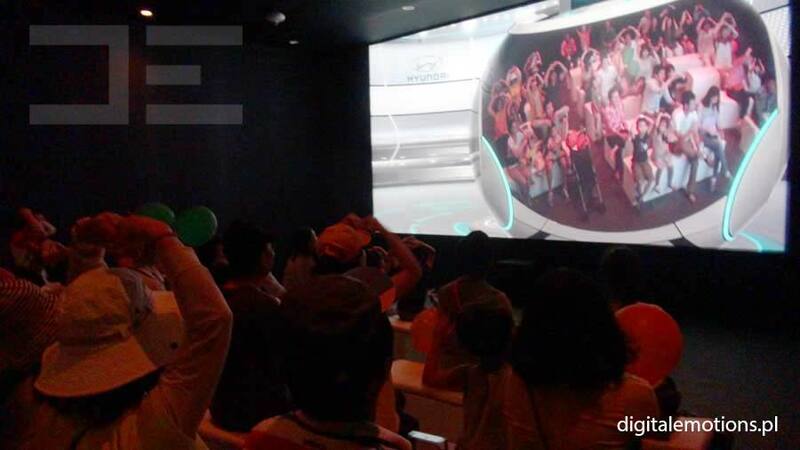 But what will happen if the film hero addresses the audience and starts talking to them? 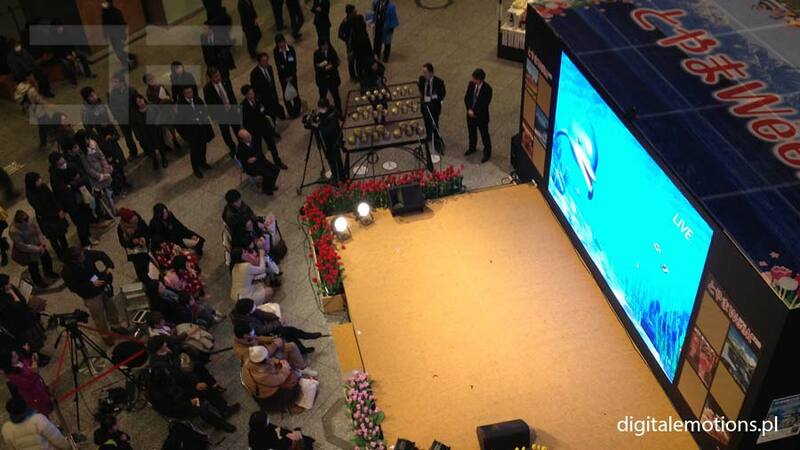 People are thrilled. 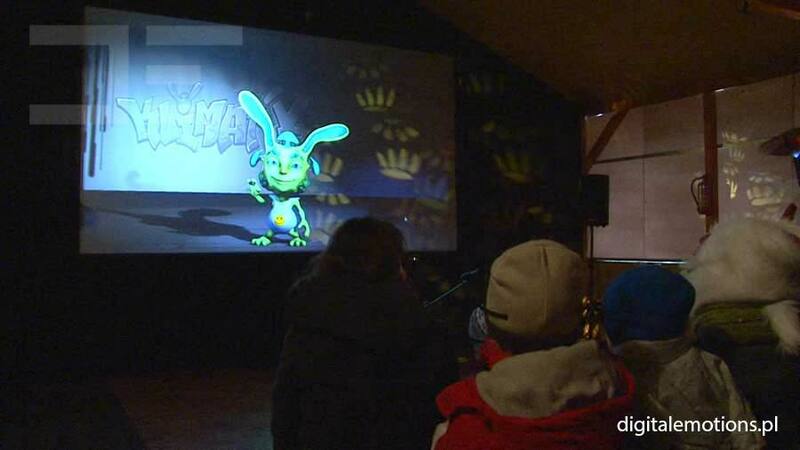 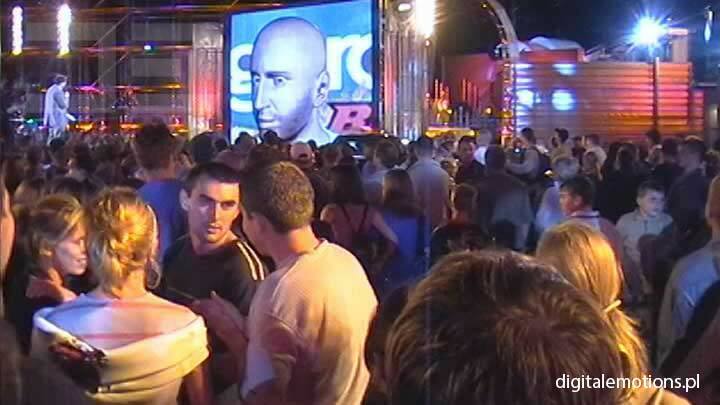 An improvised talk with a character from the cinema screen makes an enormous impression on guests. 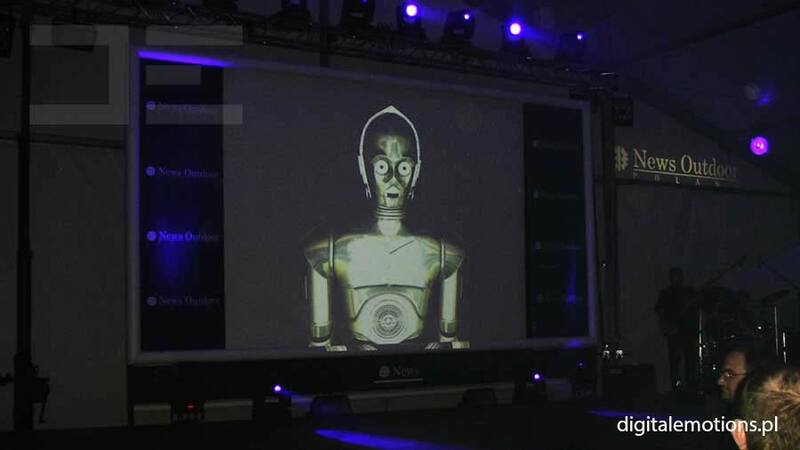 The premiere of Star Wars, Episode I: The Phantom Menace, was supported by our virtual robot C-3PO, a well-known character who appears in all parts of the famous space saga. 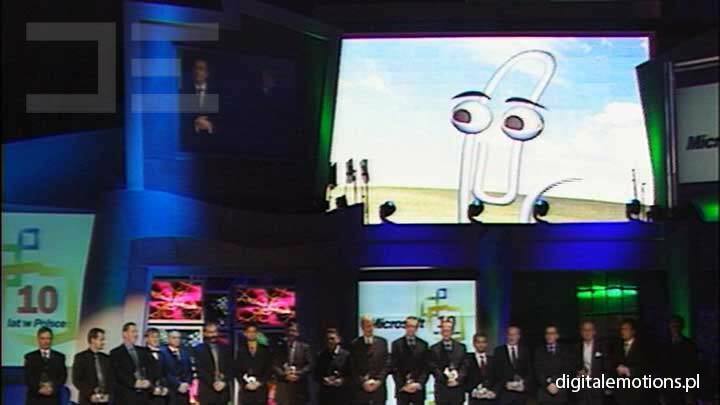 You couldn’t imagine a better host. 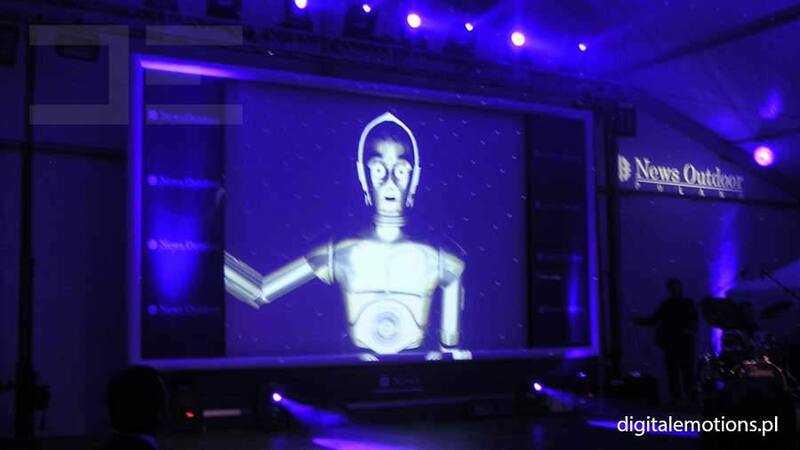 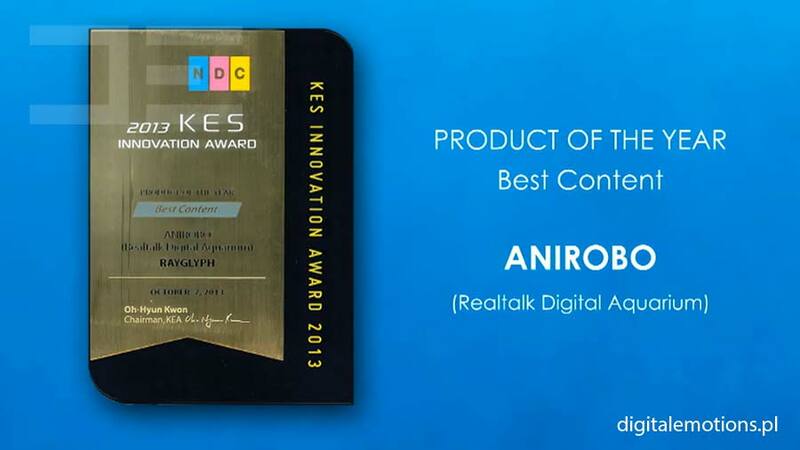 The presence of our technology helped to raise the prestige of the whole event. 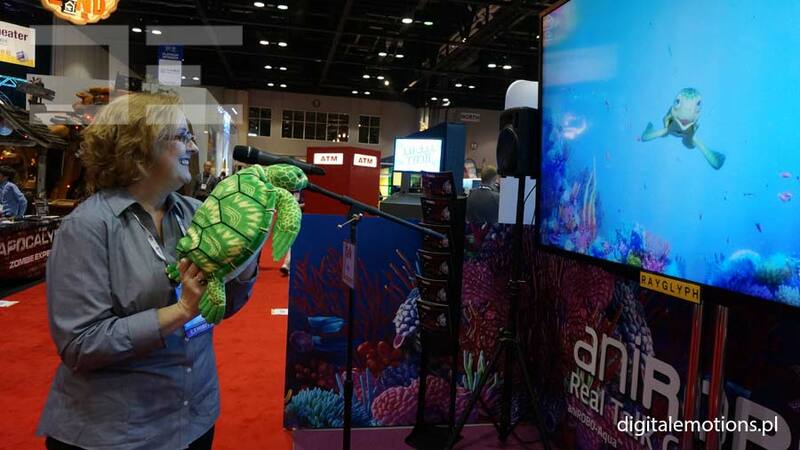 No more clichéd lectures and presentations! 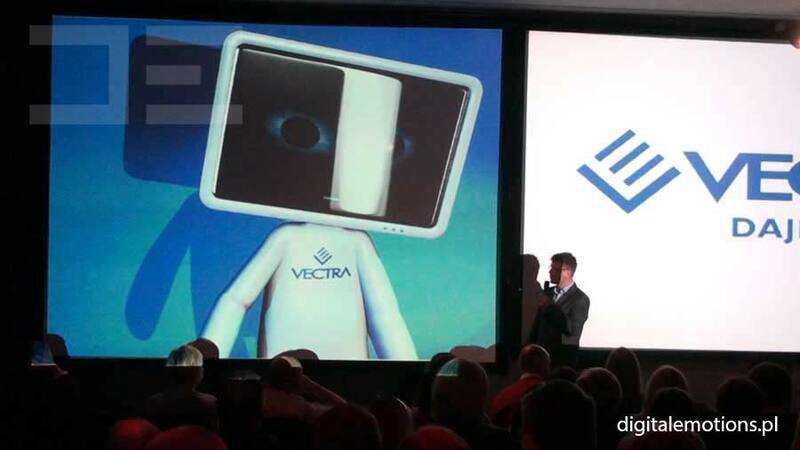 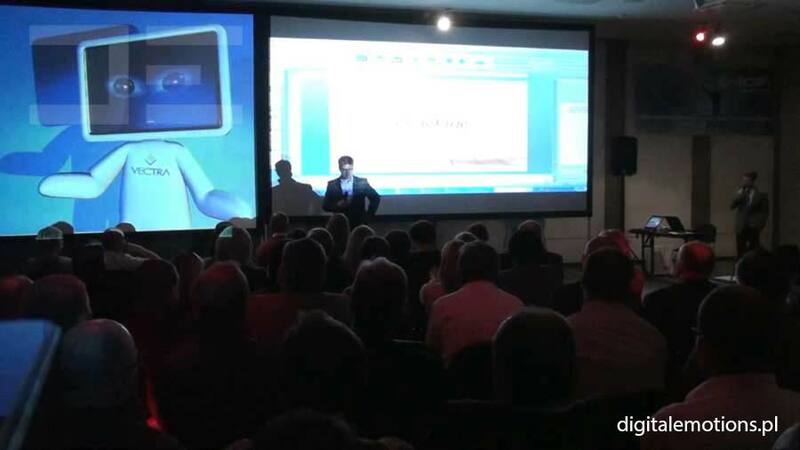 Our virtual presenter will bring a hint of future to every event he is invited to. 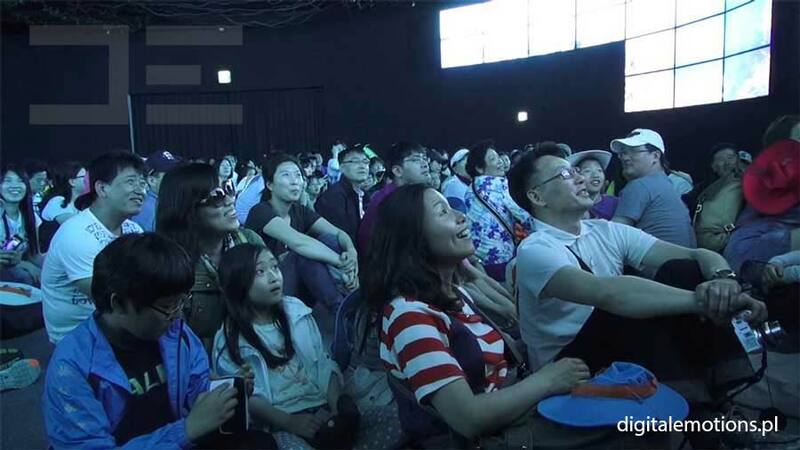 It is a great way to raise the splendor of every meeting of such type, because it allows to introduce elements of dialogue, discussion, and interaction with the audience. 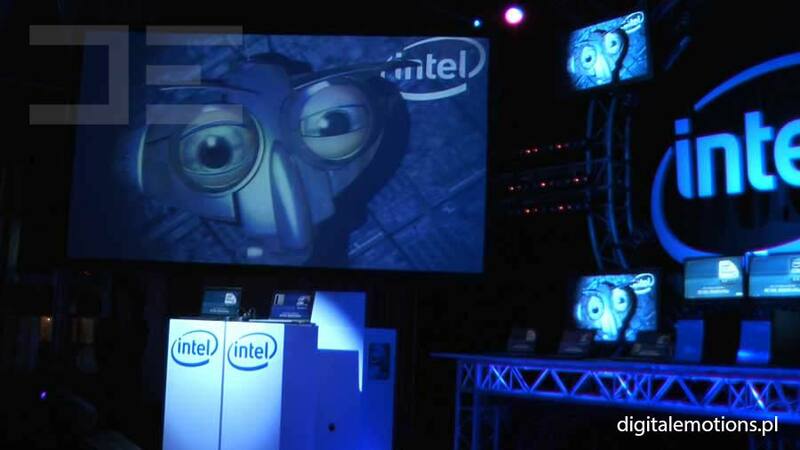 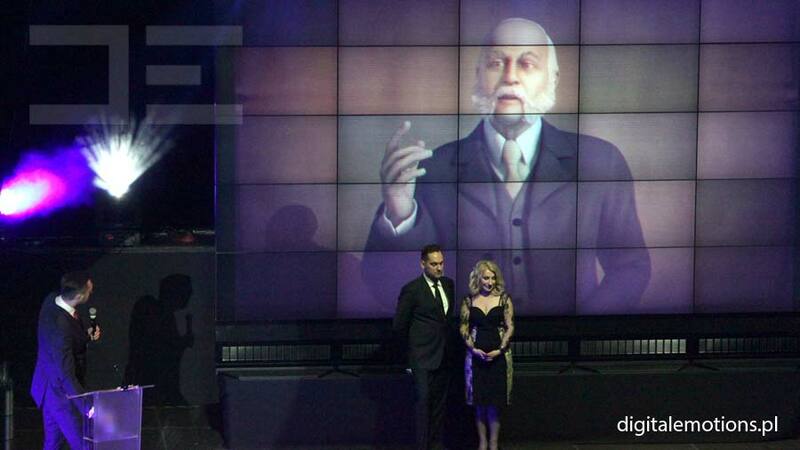 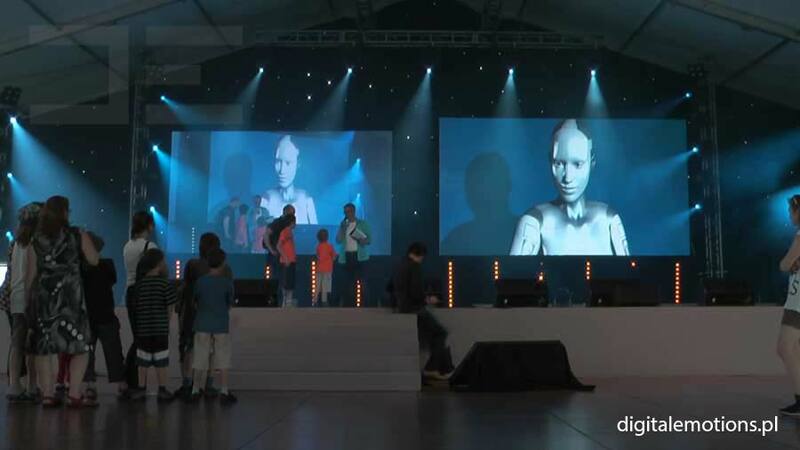 Dozens of successfully performed projects prove the attractiveness of an event that offers an interactive virtual presenter. 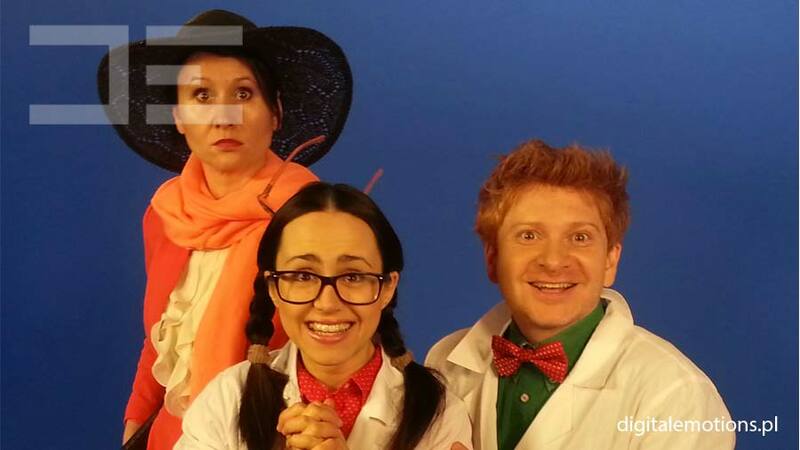 Such character quickly gains sympathy and thanks to the professional actors it doesn’t lack sense of humor. 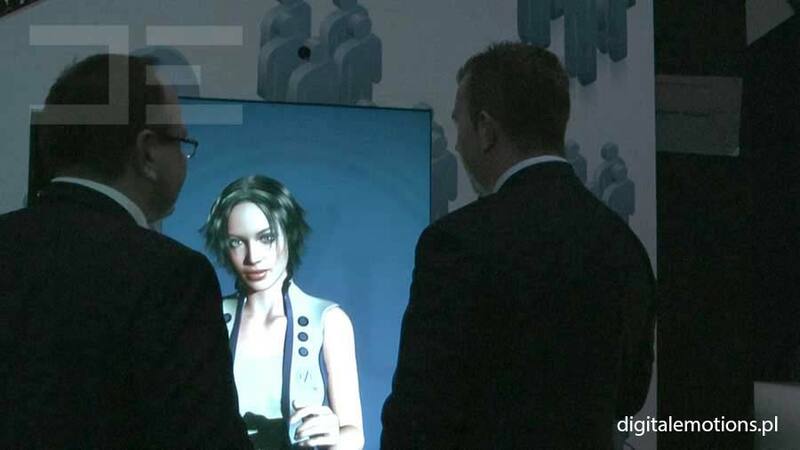 We can create an virtual character conneted with the client’s company. 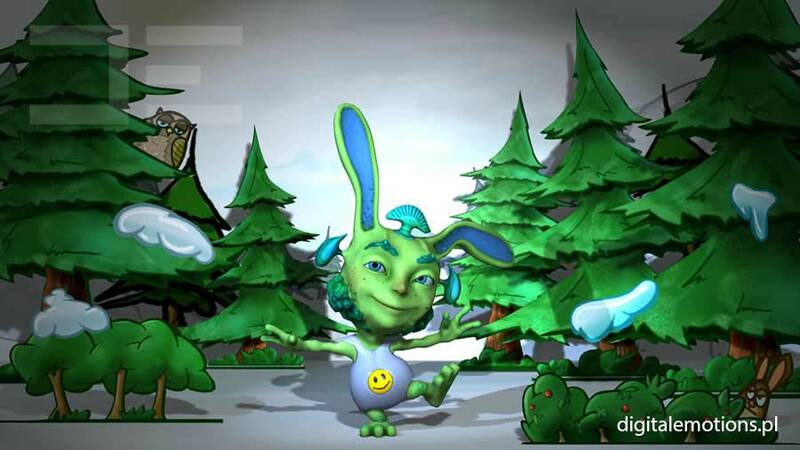 We also invite you to use our base with ready-made characters. 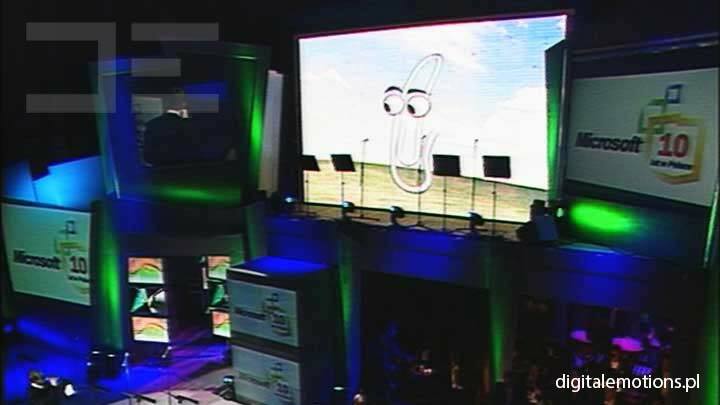 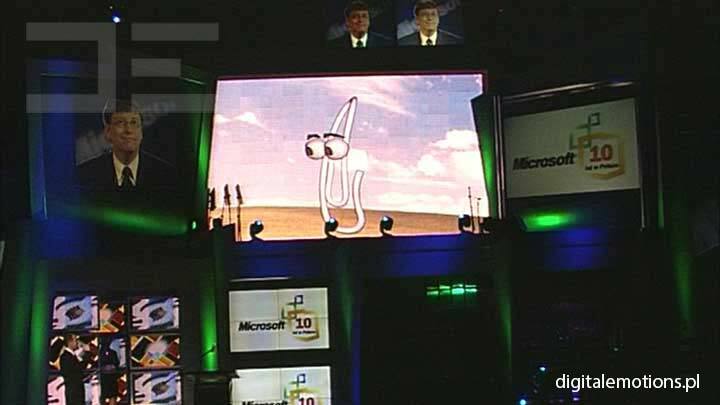 For the tenth anniversary of Microsoft’s presence in Poland a video conference with Bill Gates himself took place, during which he spoke with our brought-to-life Paperclip, the indispensable element of the Office suit back then. 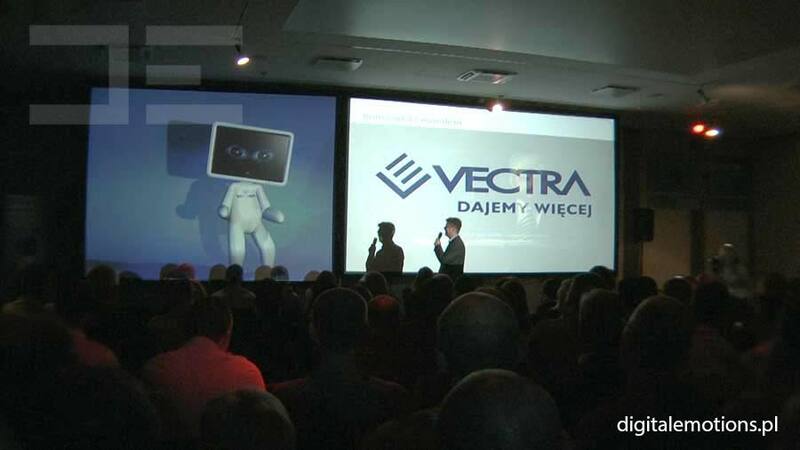 On one hand, we brought to live a company’s symbol, on the other hand, the meeting was a classical example of using our virtual character as a host for an event. 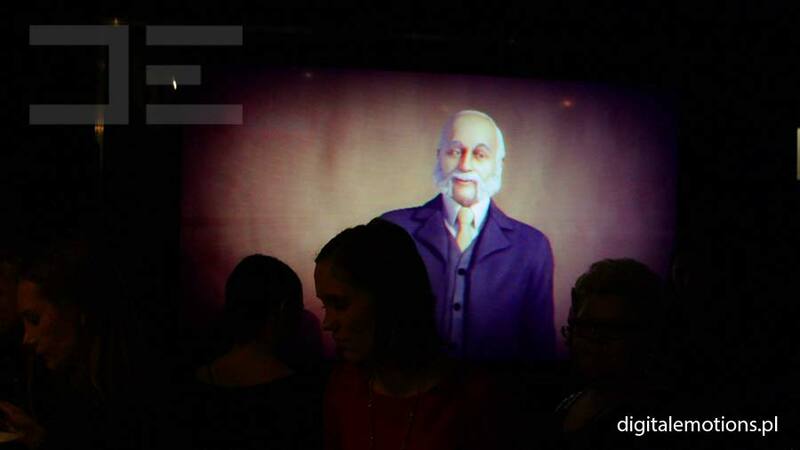 Our virtual character was speaking with Microsoft’s founder. 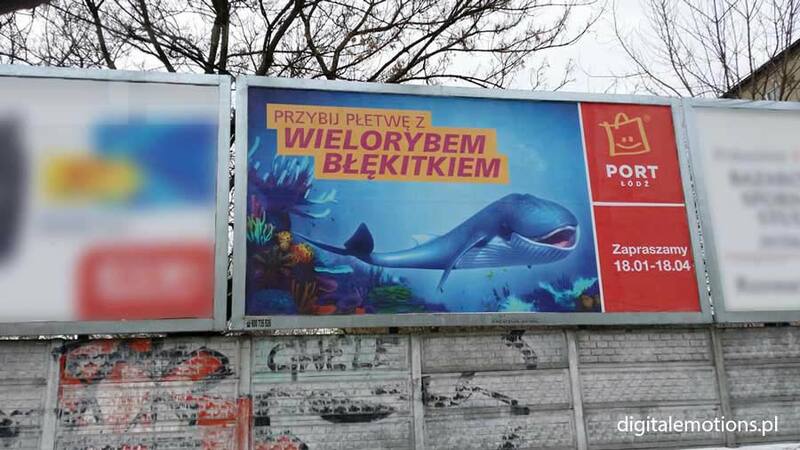 The right person in the right place! 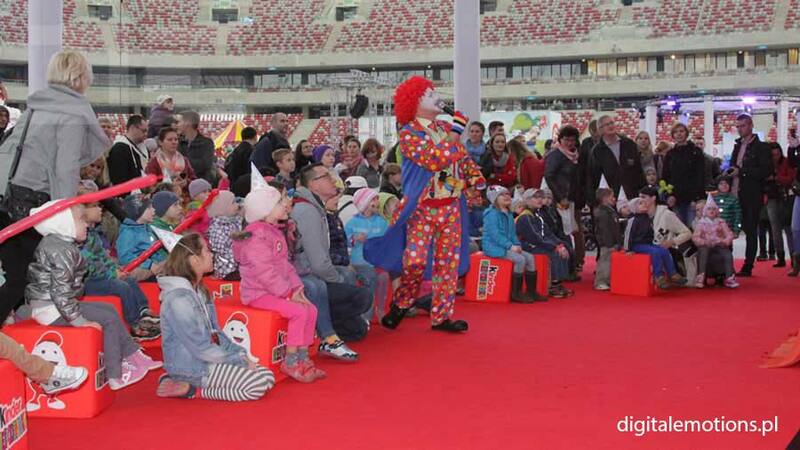 During the fortieth anniversary of Kinder Surprise, hundred thousands of young viewers walked through the National Stadium in Warsaw, along with their parents. 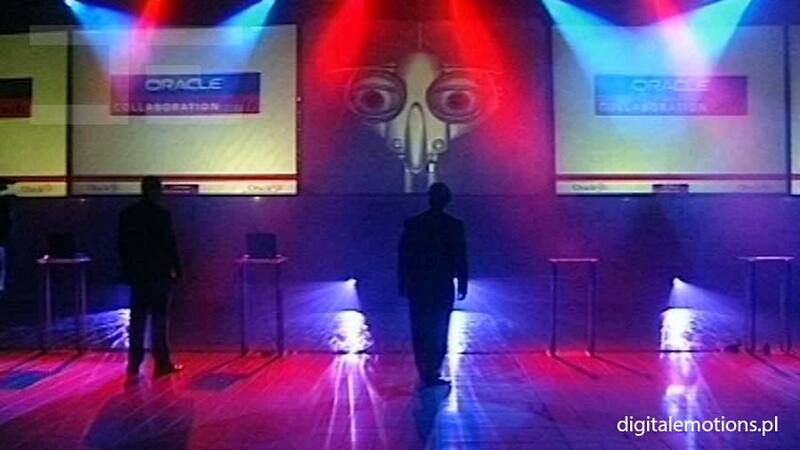 Our installation was an icing on the cake among standard, usual attractions. 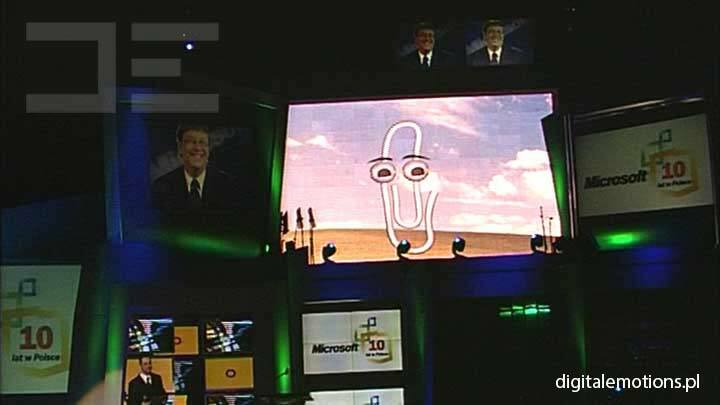 We surprised all with modern technology. 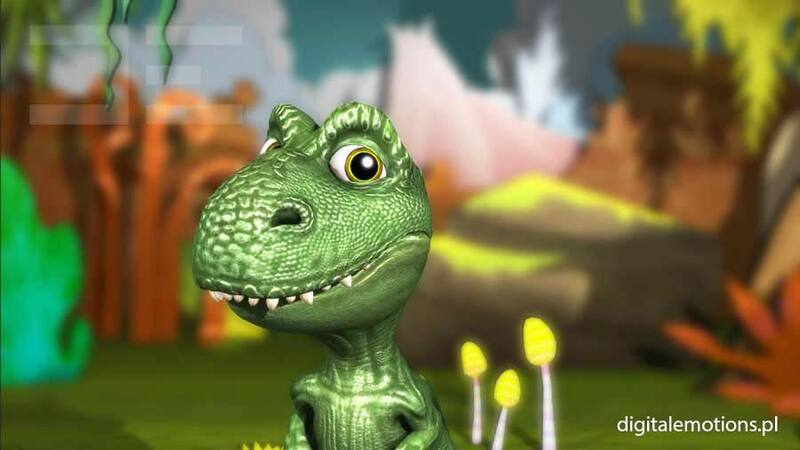 We have also got a lot of wonderful reviews. 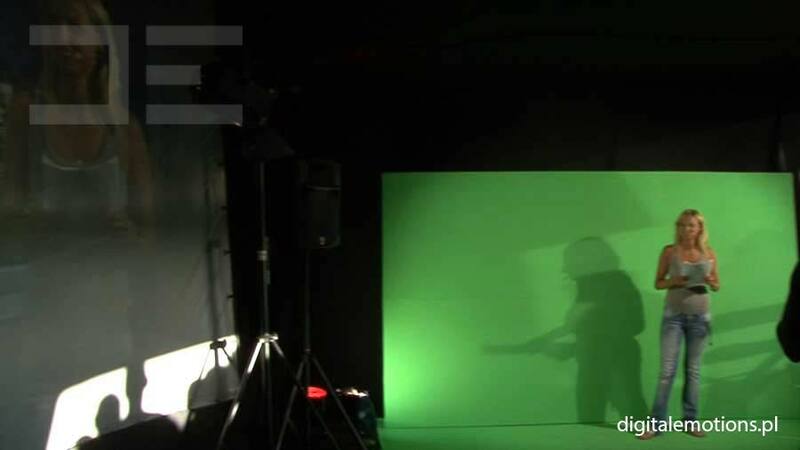 We have created a unique show with a virtual ghost as the main hero. 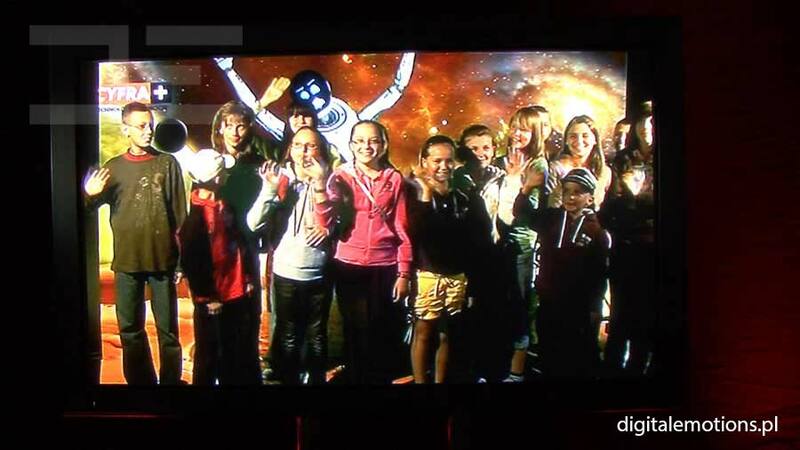 We were the best birthday present one can get. 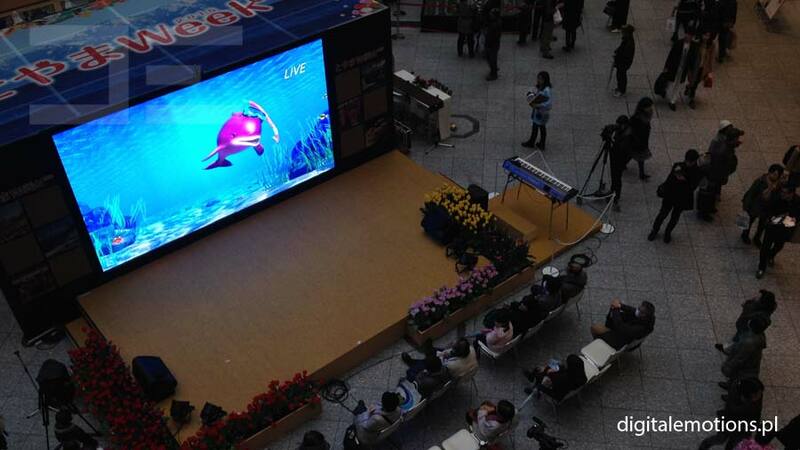 It’s flagship application of our technology for a promotional purposes. 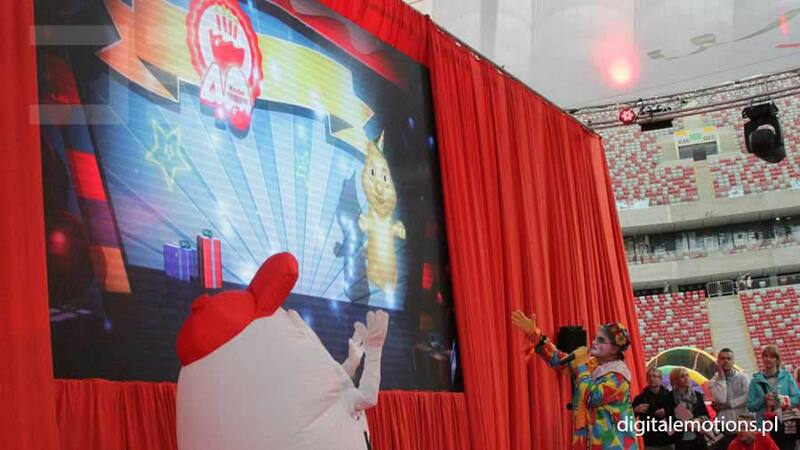 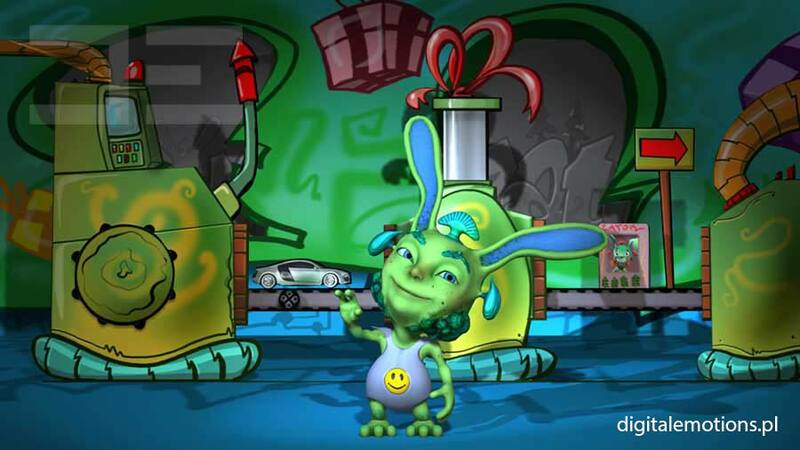 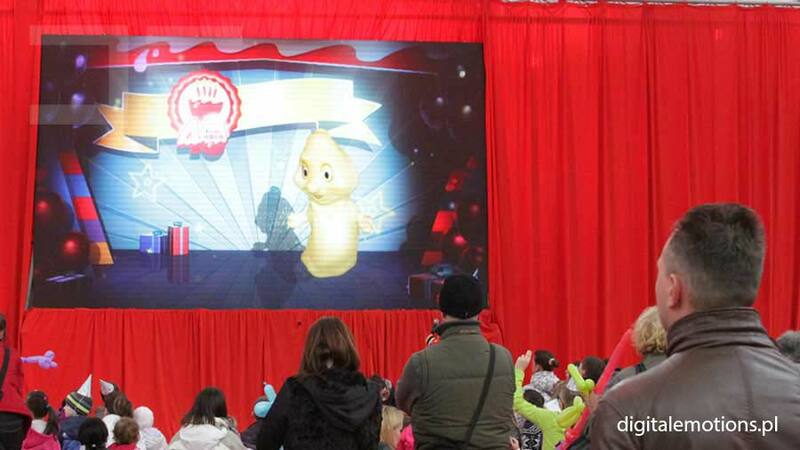 The character was created on the basis of an existing Kinderino product, and the story was written specially for the event. 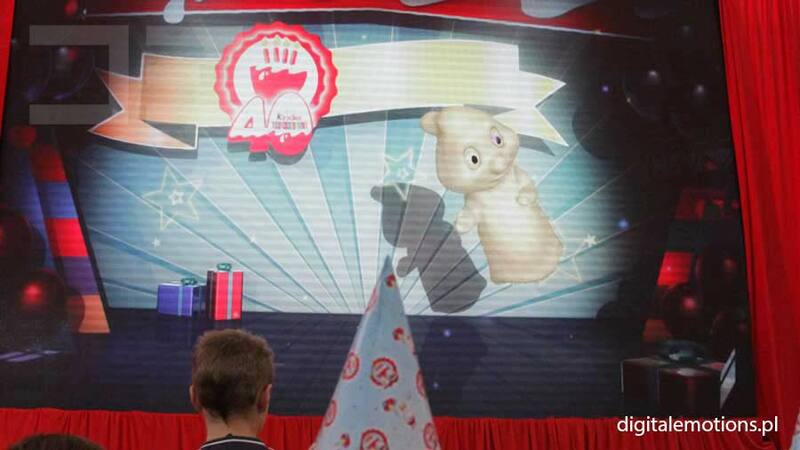 It was very rewarding to fulfill our client’s all birthday wishes. 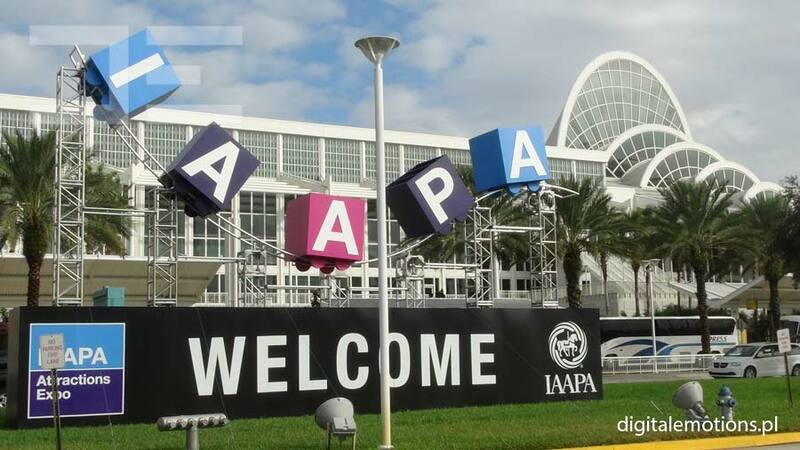 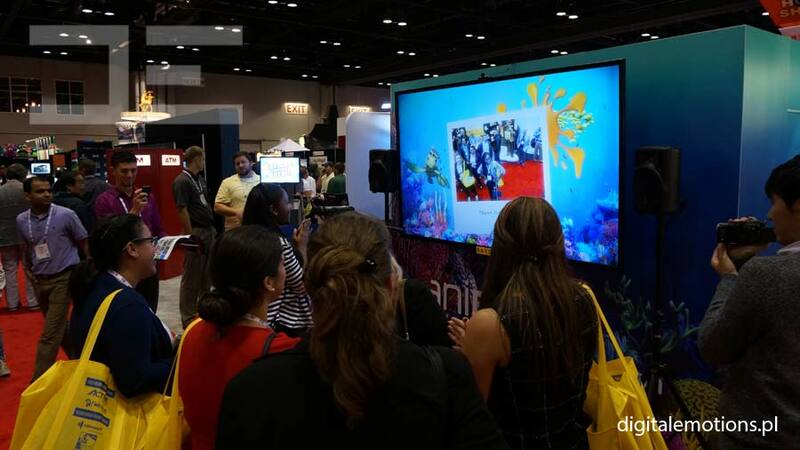 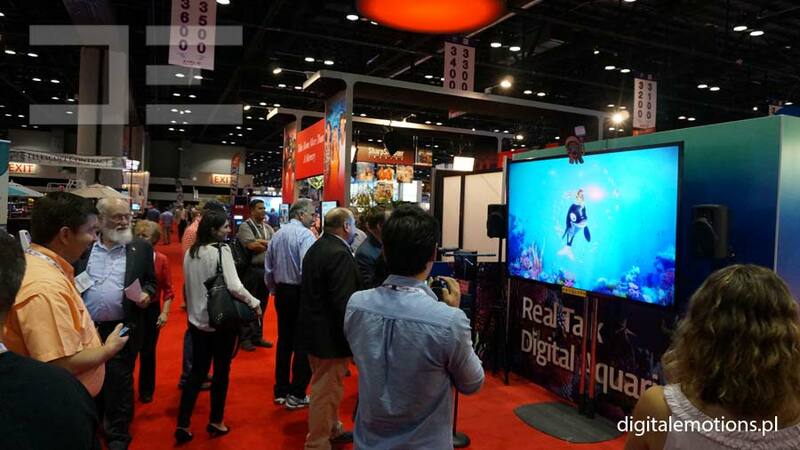 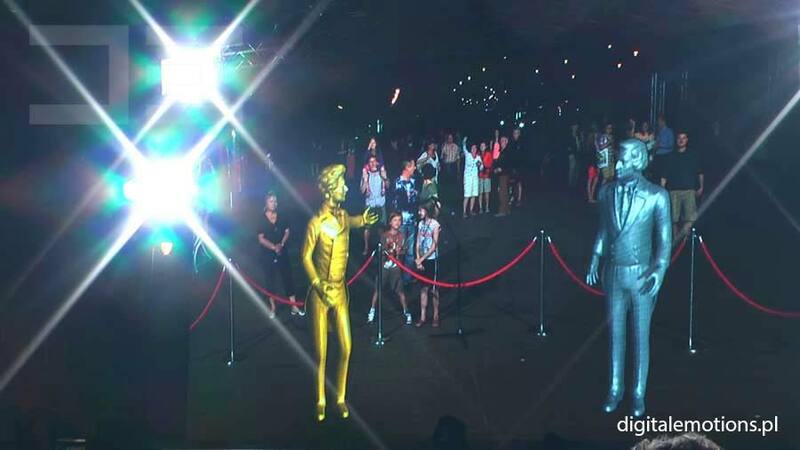 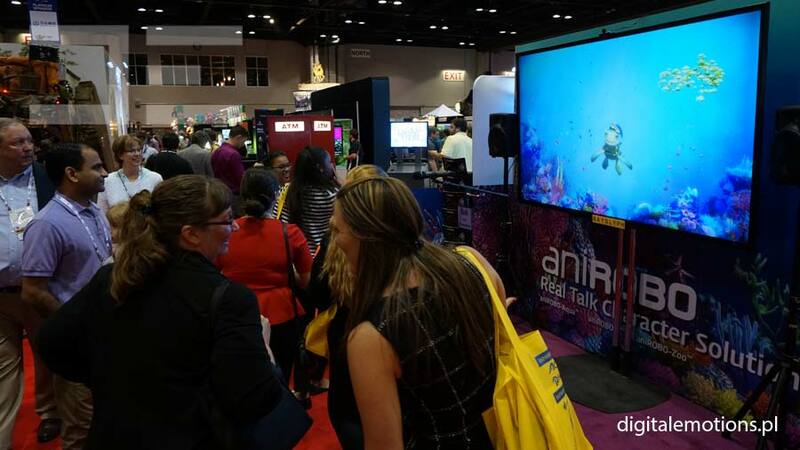 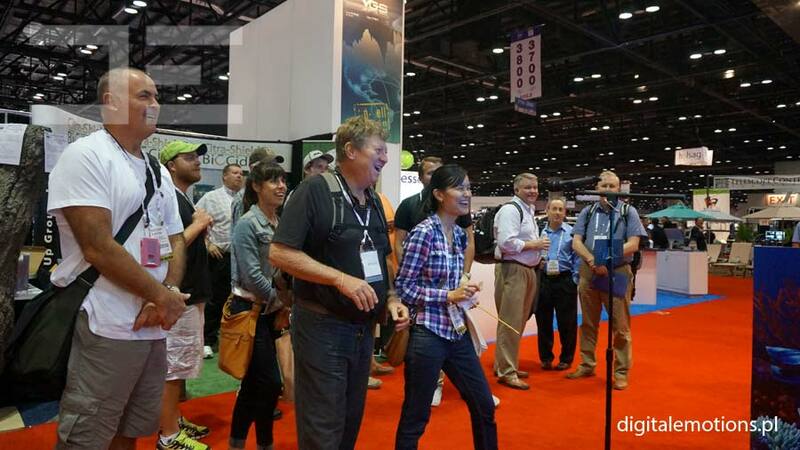 Our VIRTUAL PUPPET technology visited at international fairs called IAAPA 2014 and presented the latest technological developments used by amusement parks. 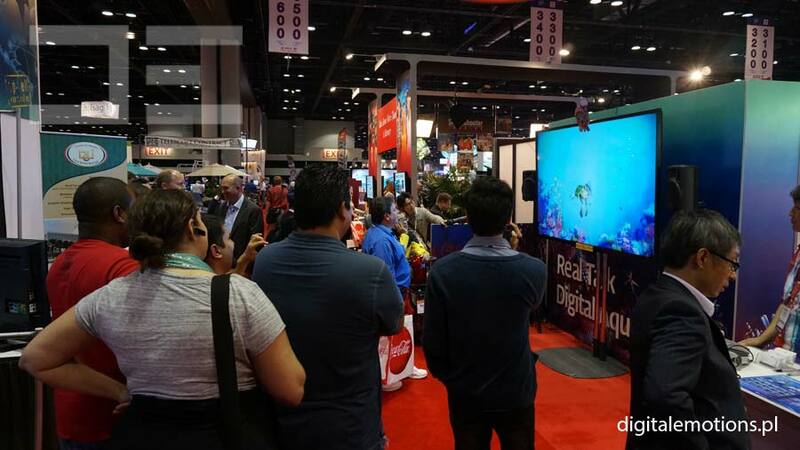 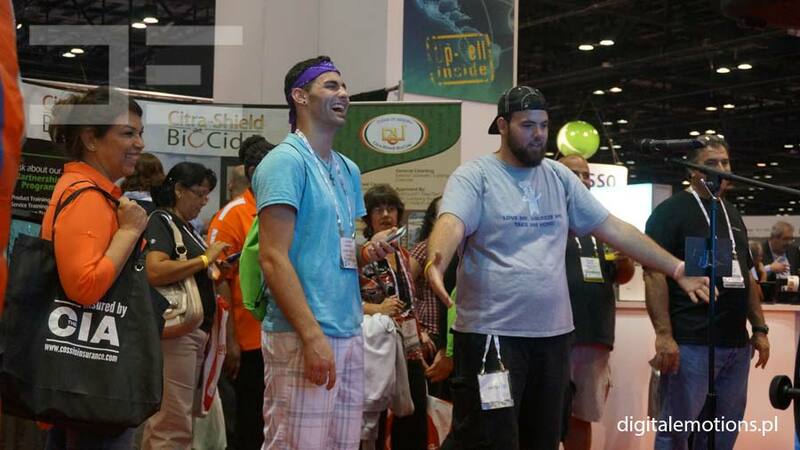 Our presence at fairs in Orlando, Florida, caused quite large agitation. 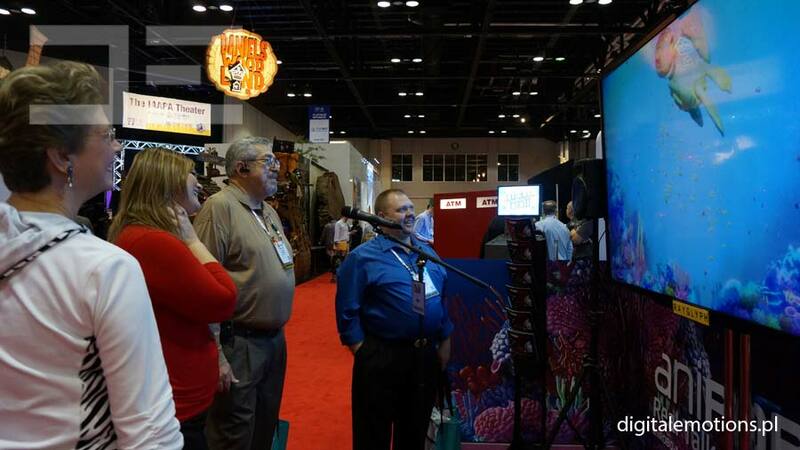 Our digital characters talking with guests live built great interest. 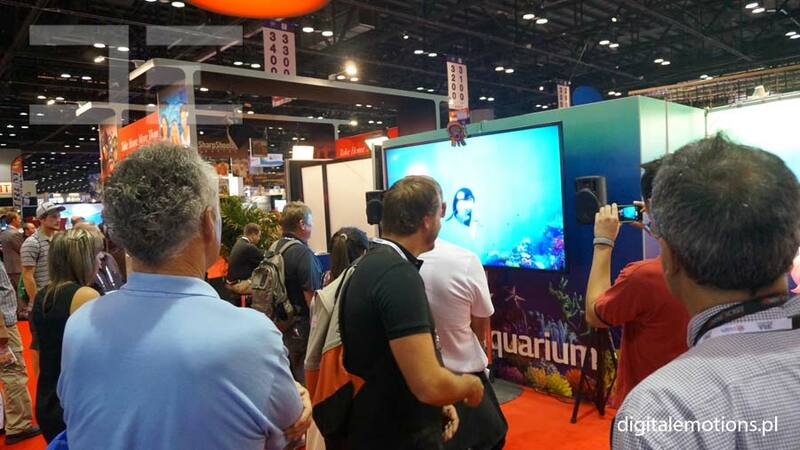 Don’t forget VIRTUAL PUPPET is now being used in ocean and water parks, shopping centers, or science centers for children all around the world. 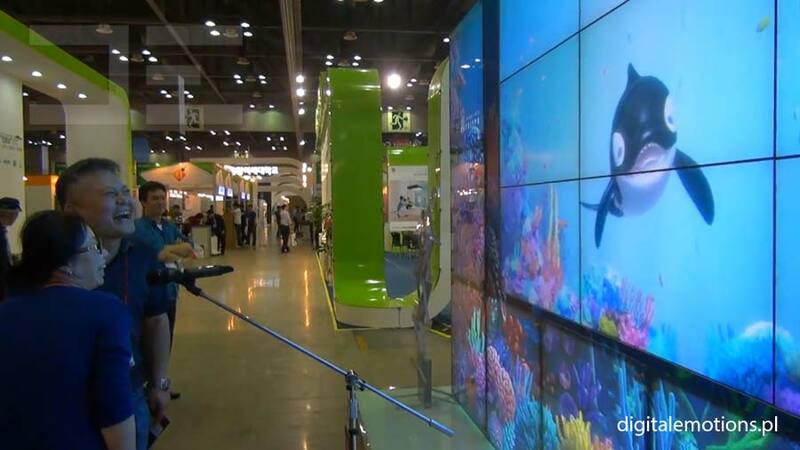 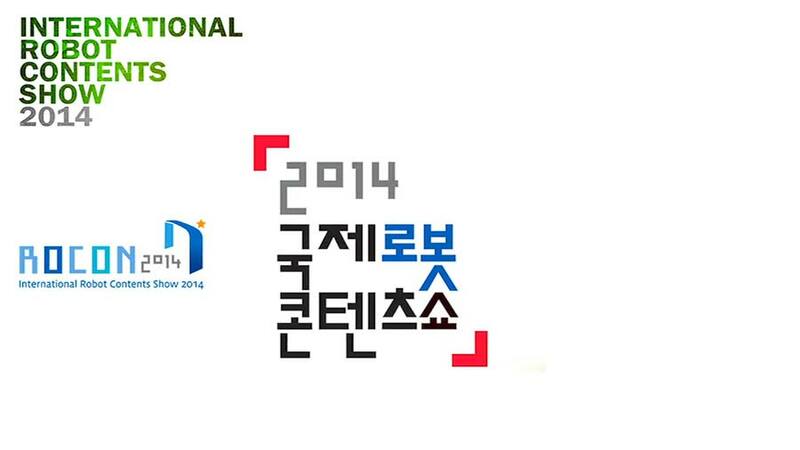 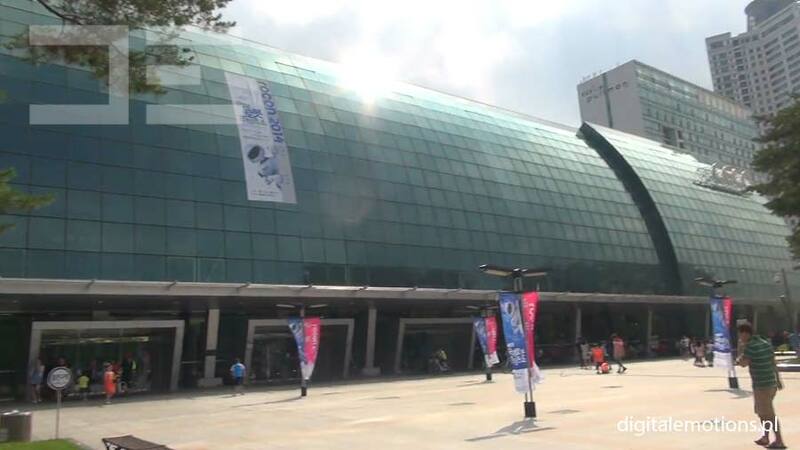 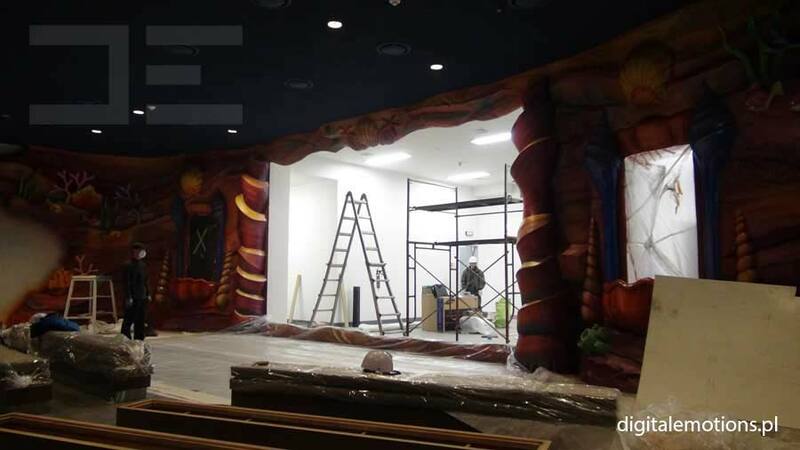 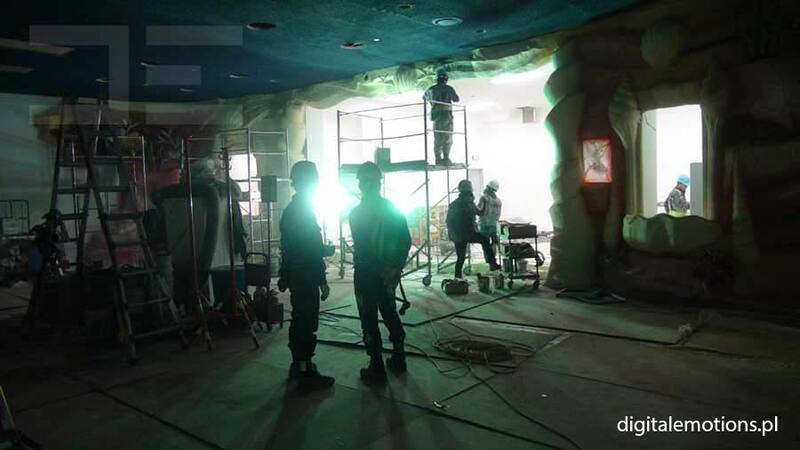 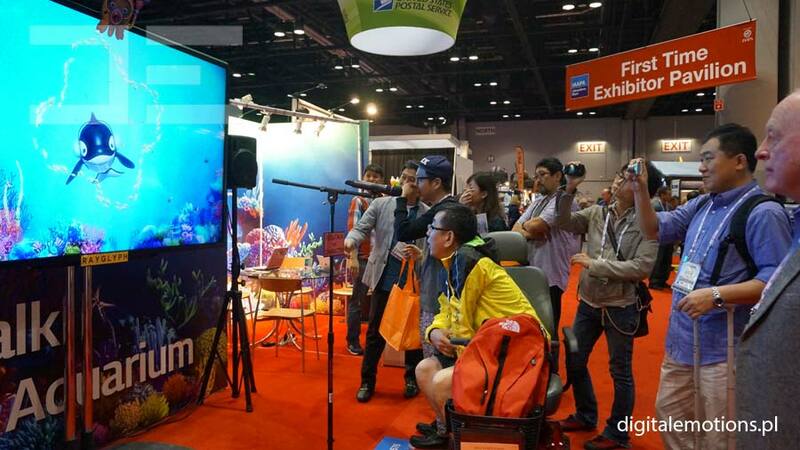 Our participation in IAAPA 2014 fairs was possible thanks to our partner – Rayglyph company from South Korea. 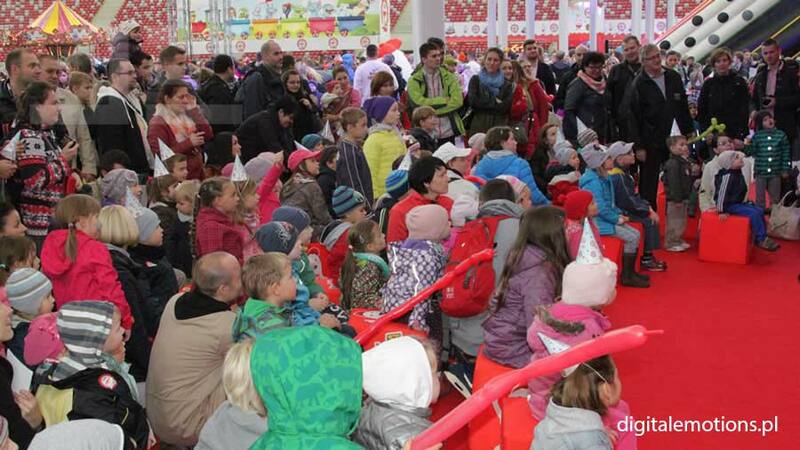 The meeting of Pfizer employees in Poland was dignified by a guest from the 19th century. 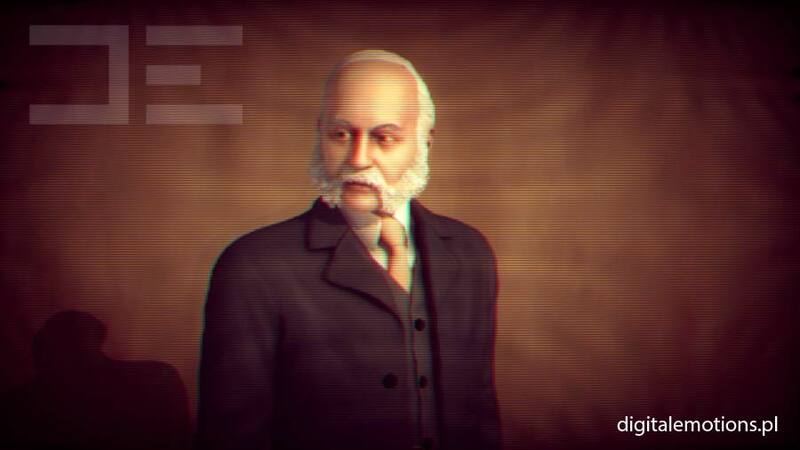 Exclusively for the event, Digital Emotions has made a virtual version of Charles Pfizer – the founder of one of the biggest pharmaceutical brands. 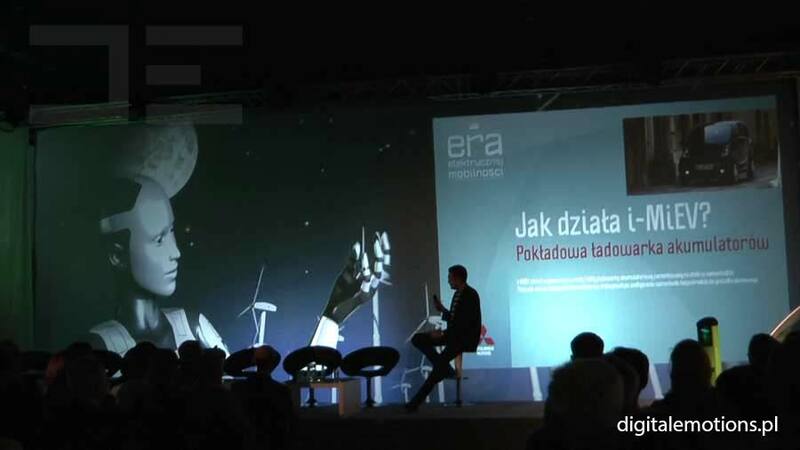 The presentation was delivered by Marcin Prokop. 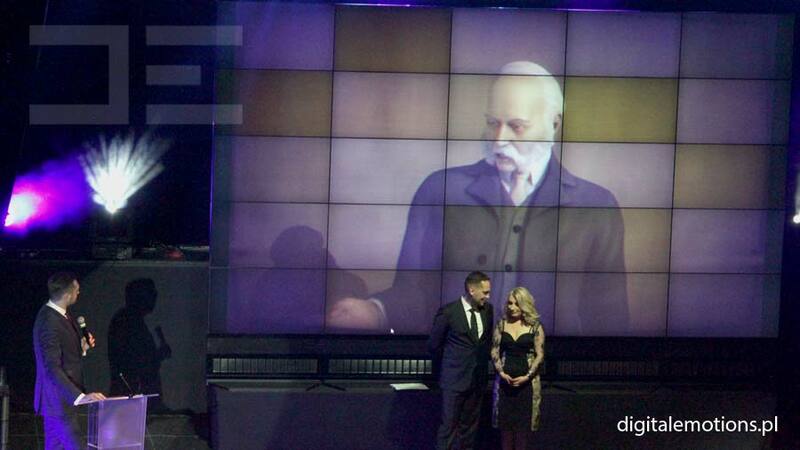 Charles Pfizer was telling stories about the company’s beginnings, its values and development, freely exchanging comments with the presenter. 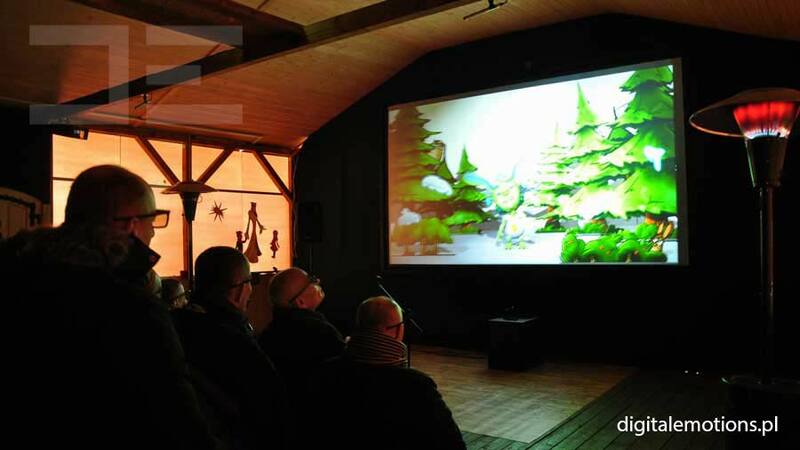 The discussion came off very smoothly and was convincing, because the actors steering with the virtual character reacted to the utterances and gestures of Marcin Prokop, just as theatrical actors react to other actors’ behaviors. 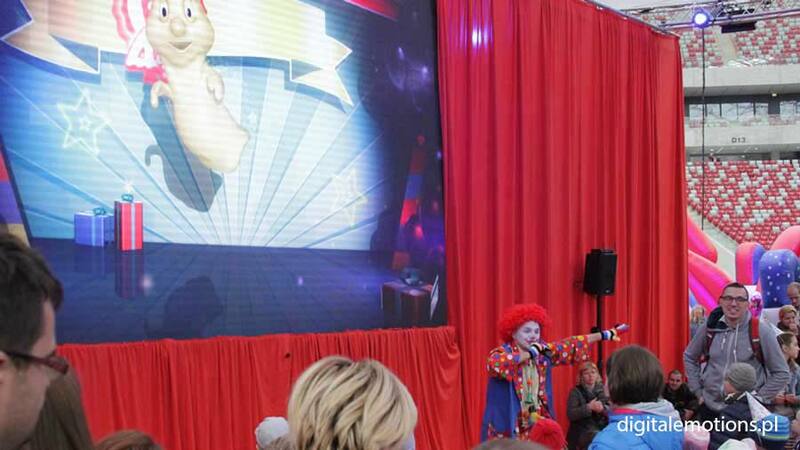 Together with Pfizer we have created an unusual show, which was greatly received by the audience. 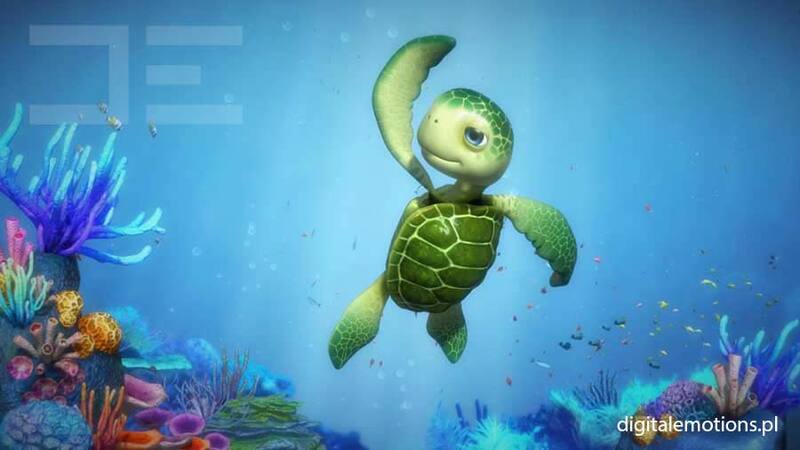 It’s an installation involving a kind little turtle with technological possibilities similar to those of Bluey the Whale. 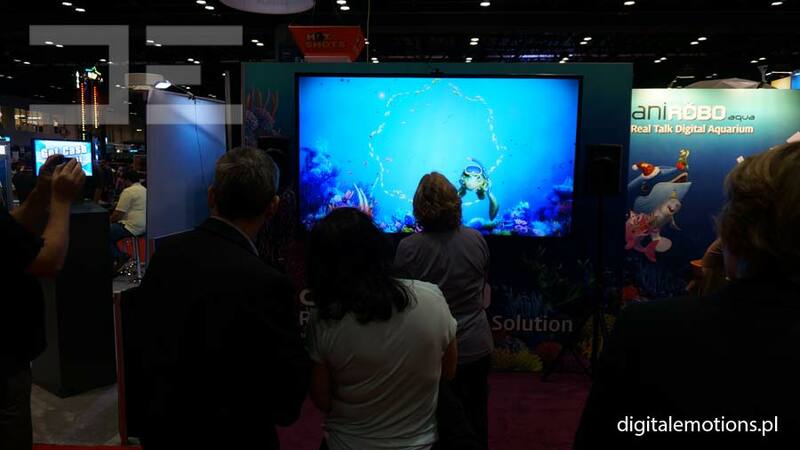 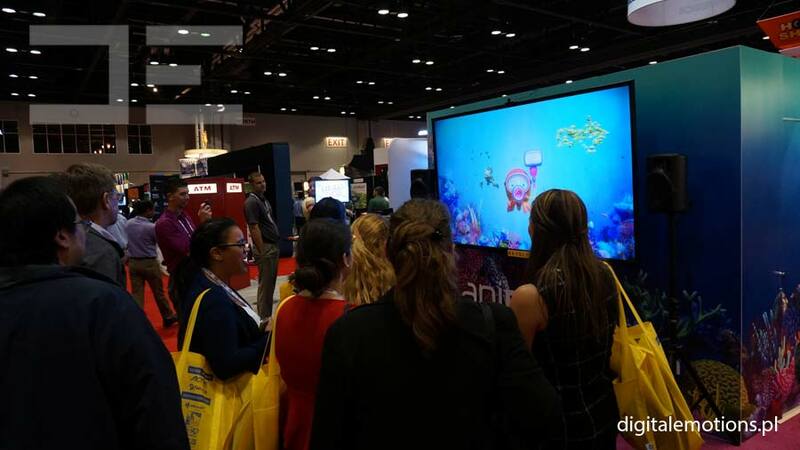 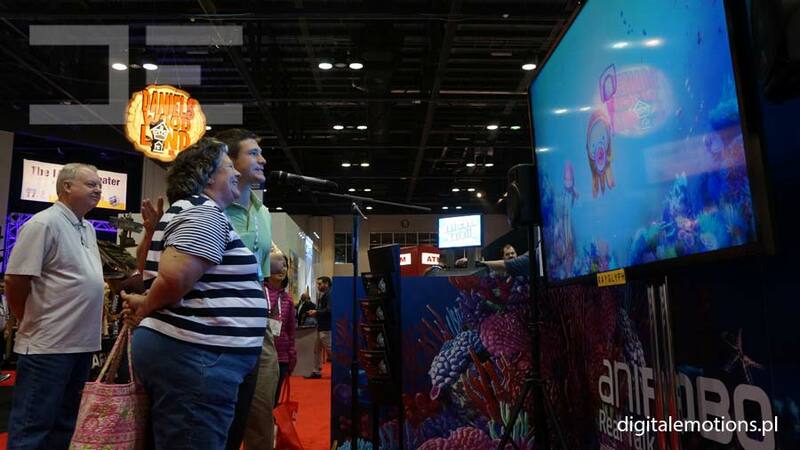 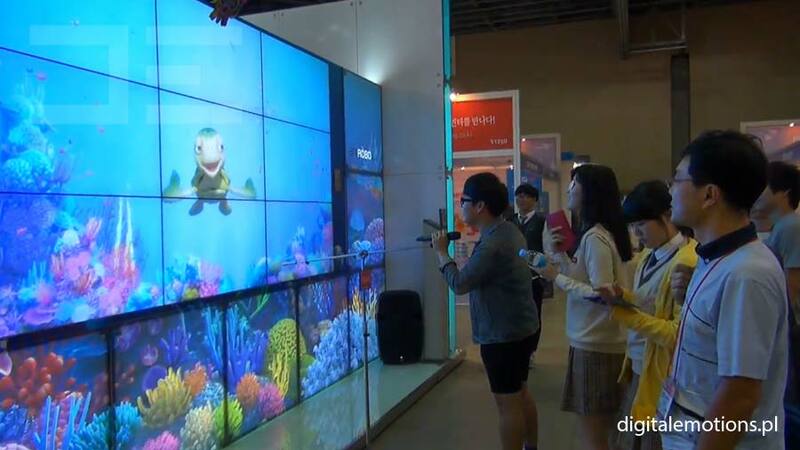 An interactive lively background, graphics show tricks, possibilities to dress the characters in different ways, SMS interaction, animated fish shoals, simple one-person handling with a touch panel. 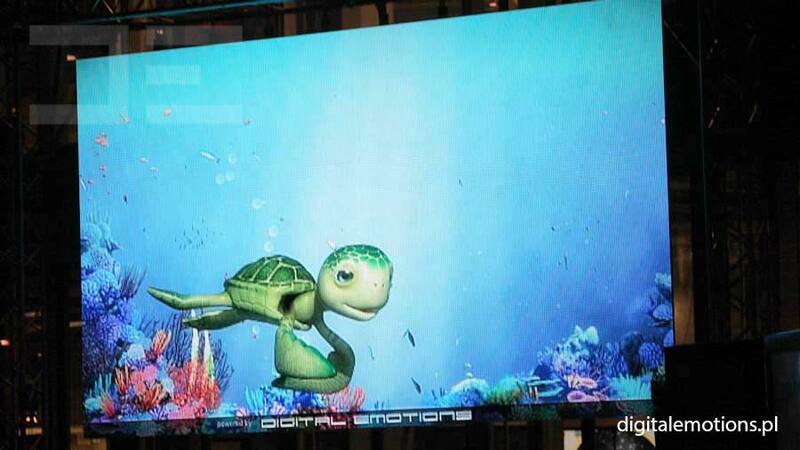 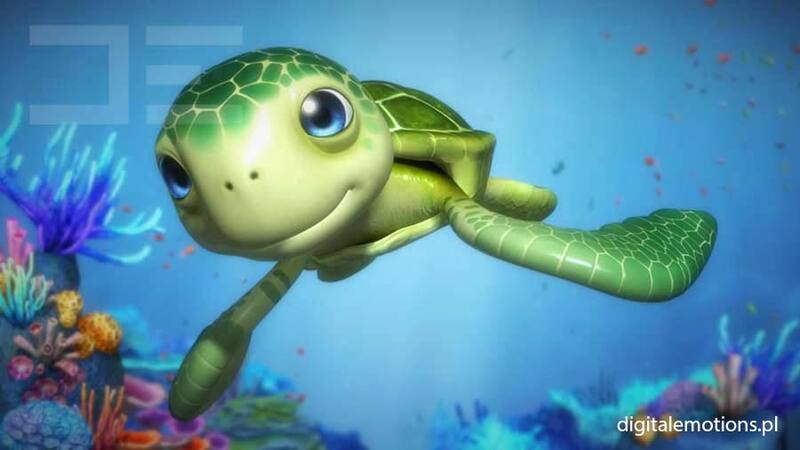 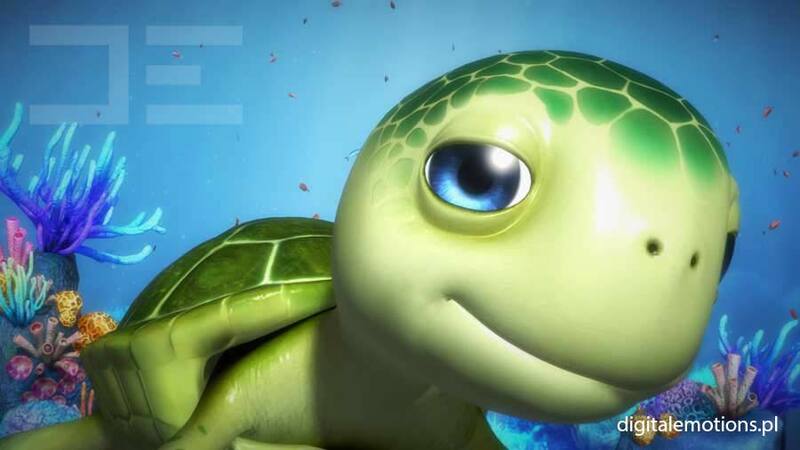 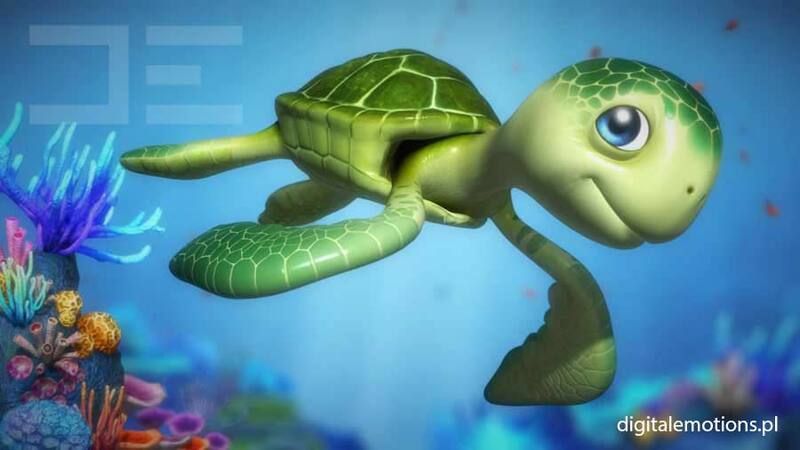 In May 2014 the “Turtle Tommy” had its premiere show. 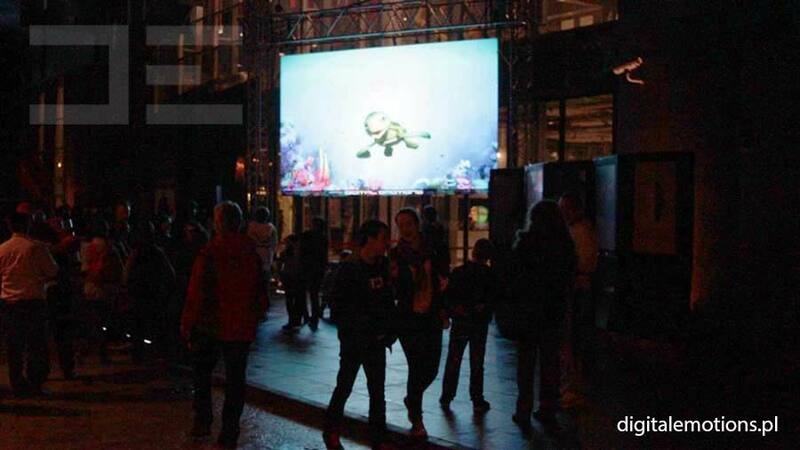 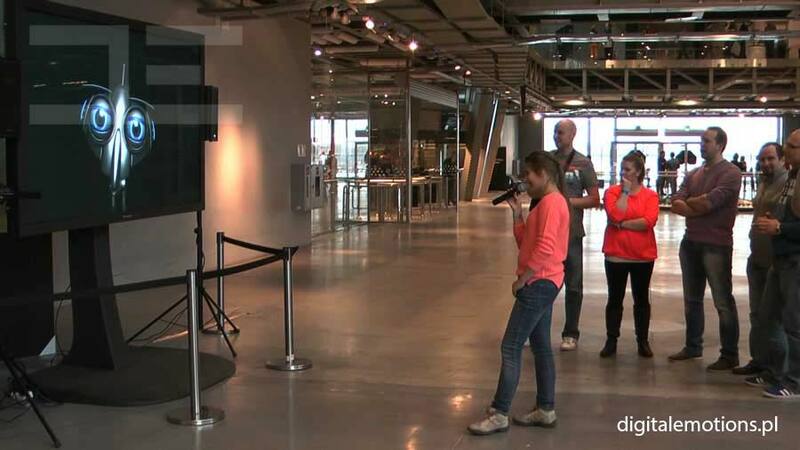 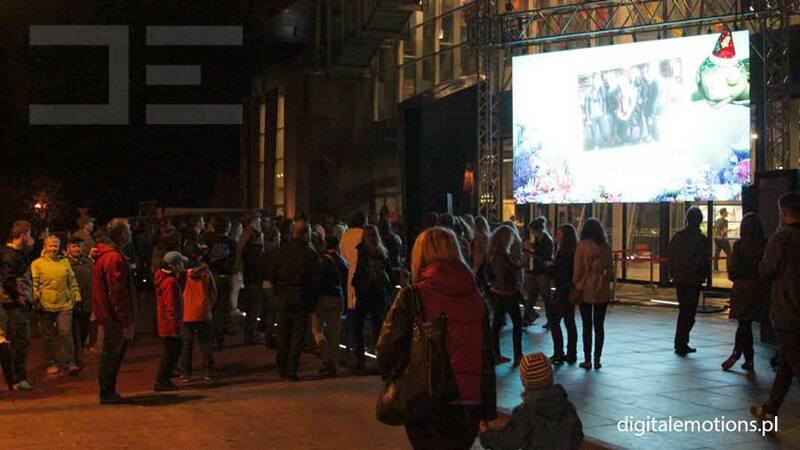 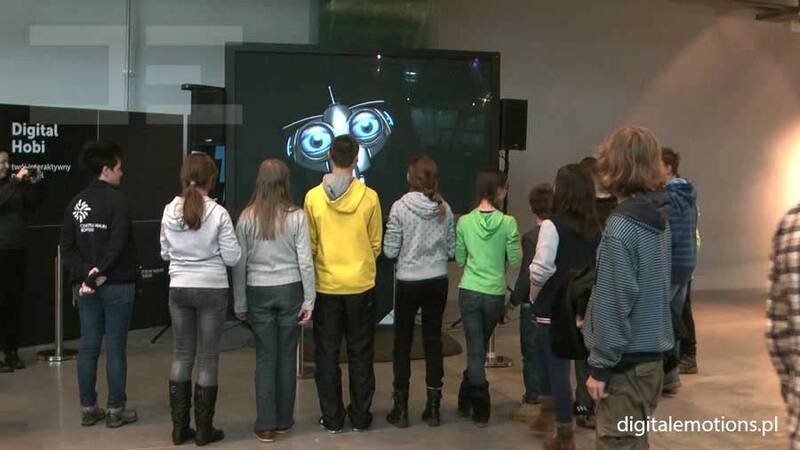 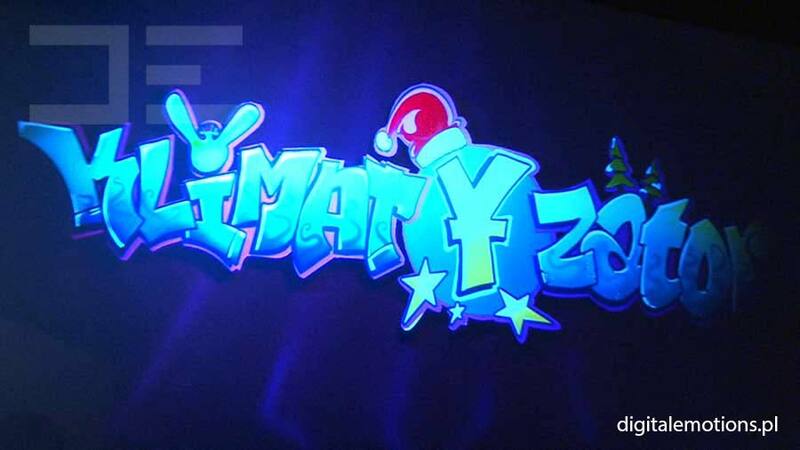 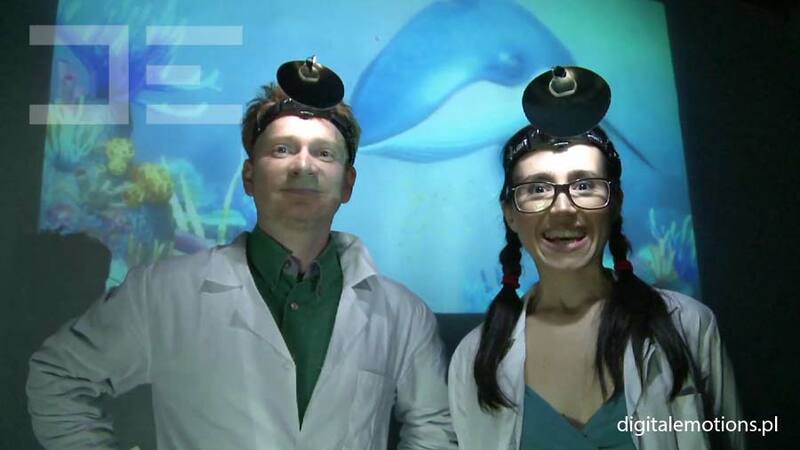 During 6 hours of exhibition it did well entertaining a few thousand viewers, who visited Copernicus Science Center in Warsaw during the Night of Museums. 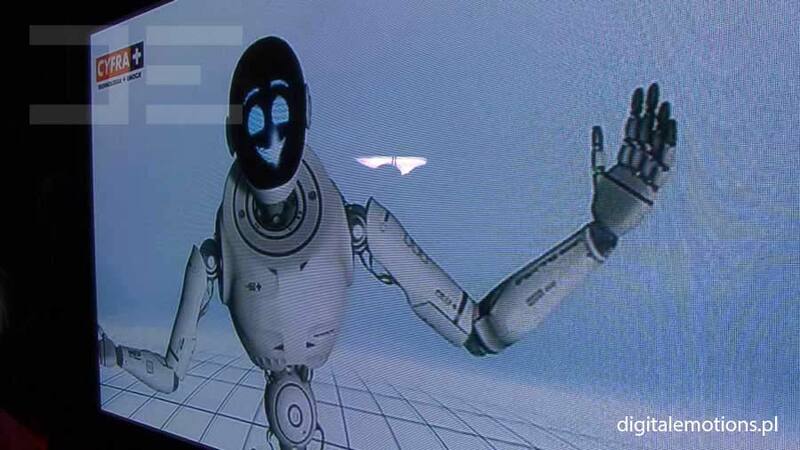 iRo is one of our best recognizable virtual actors. 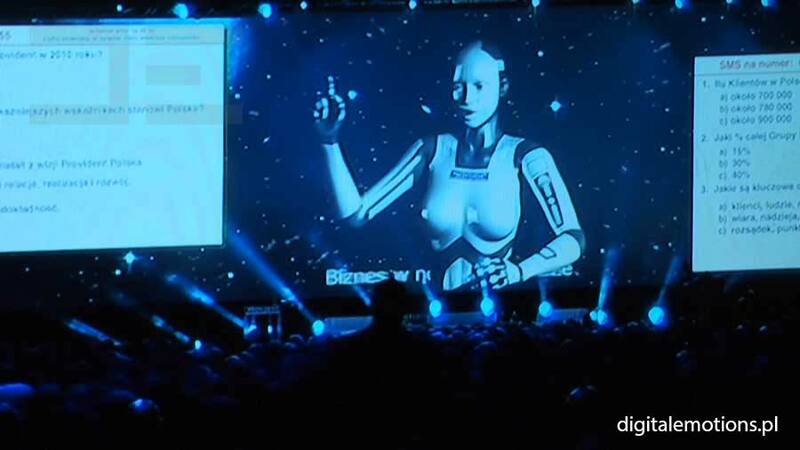 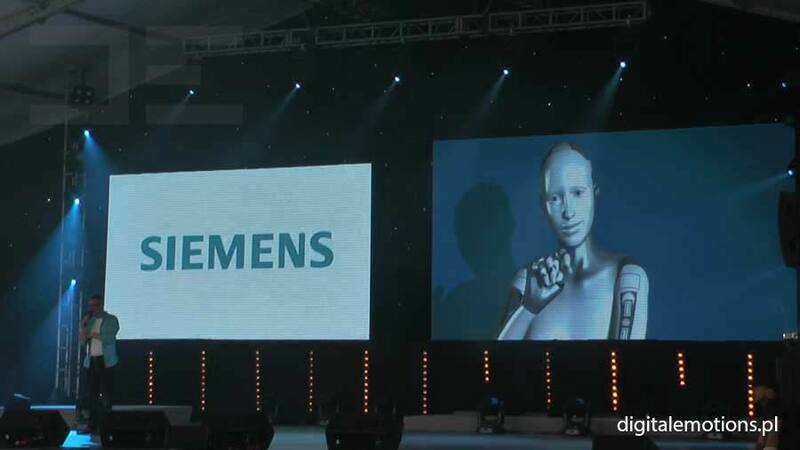 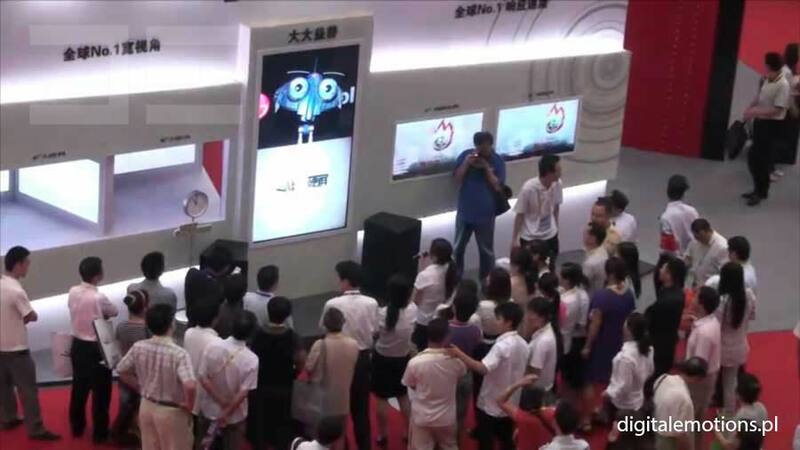 It is a robot performing most often during science and technology presentations or fairs. 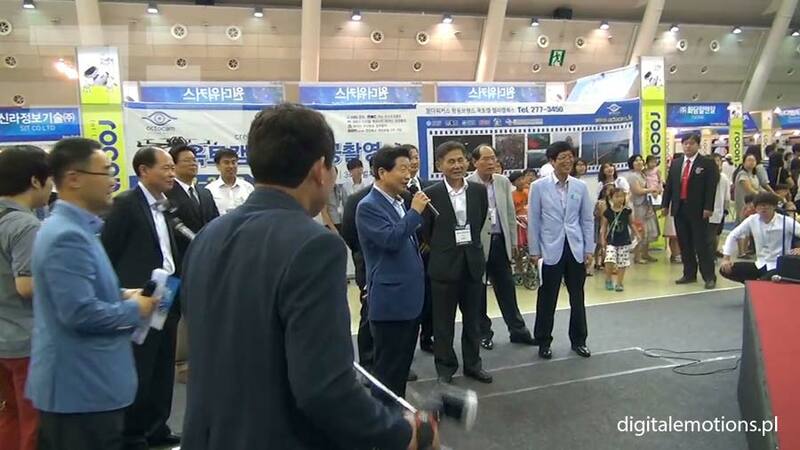 This time the robot visited Robocon fairs. 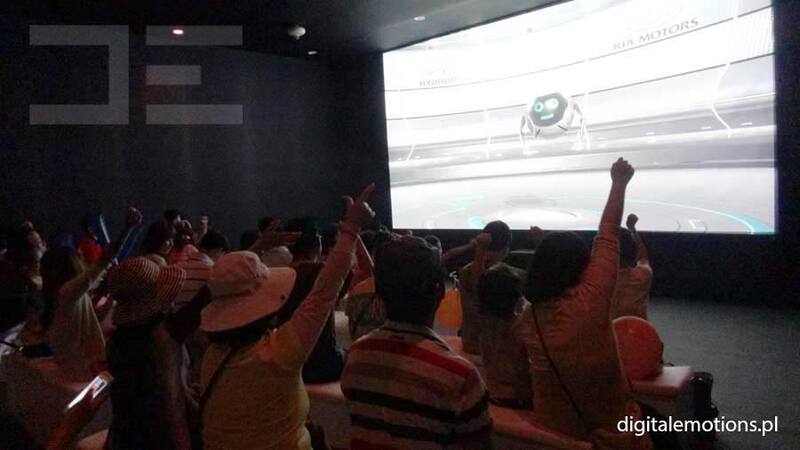 The flying, shape-changing, nice robot enchanted young and adult visitors. 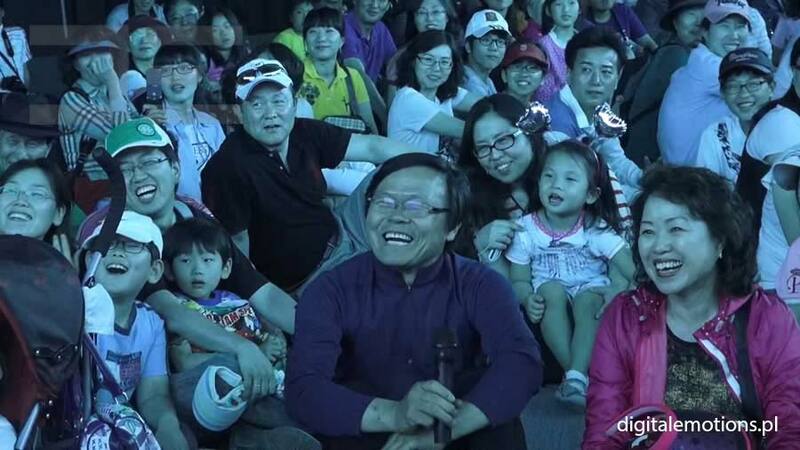 The character freely talked with people and took a few group photos. 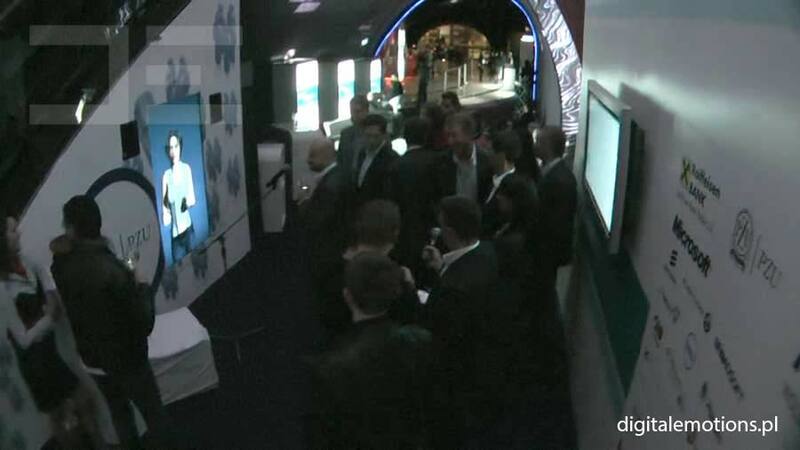 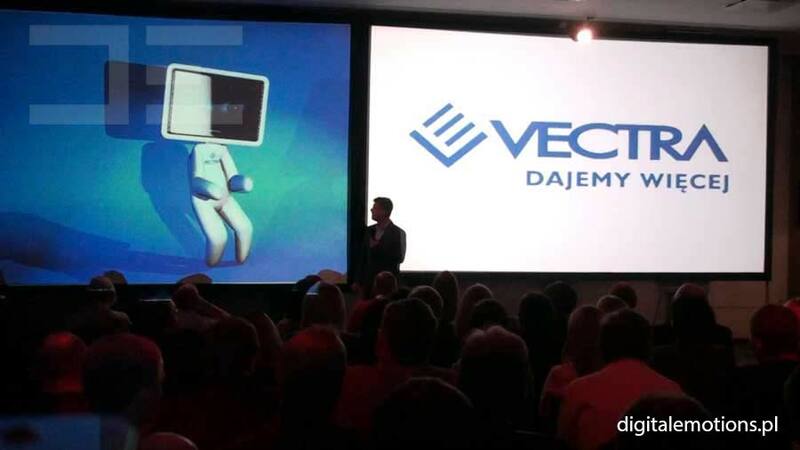 We are massively proud that the guests of such an important technological event warmly received our creation. 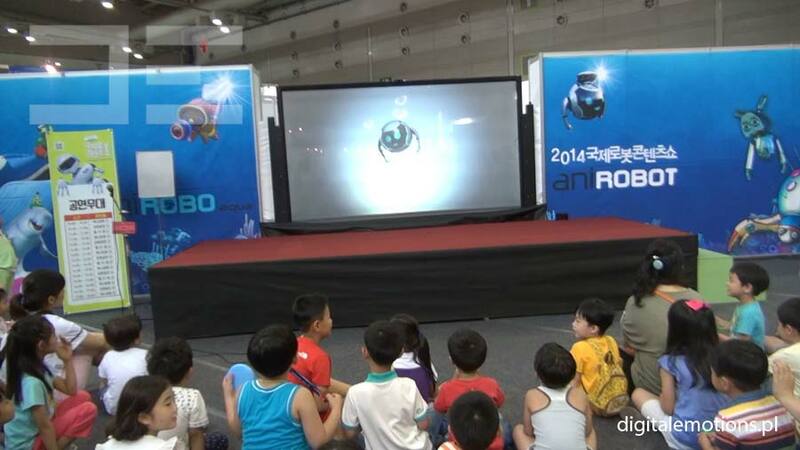 We hope that we will visit Robocon on several other occasions. 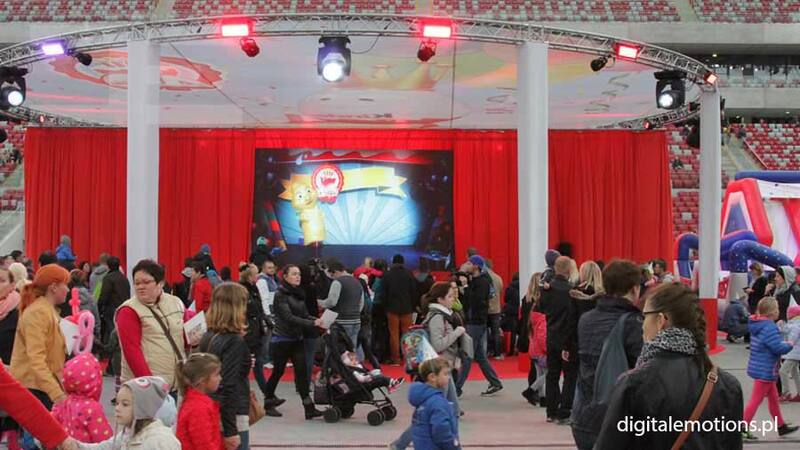 Our presence at the fairs was possible thanks to a partner company RayGlyph. 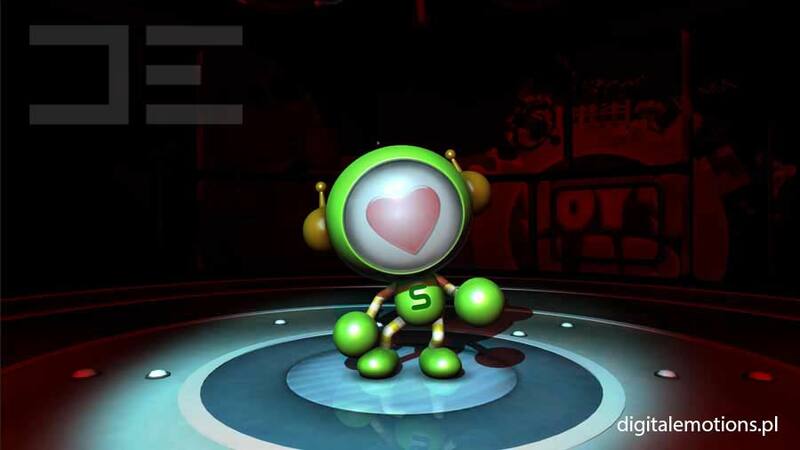 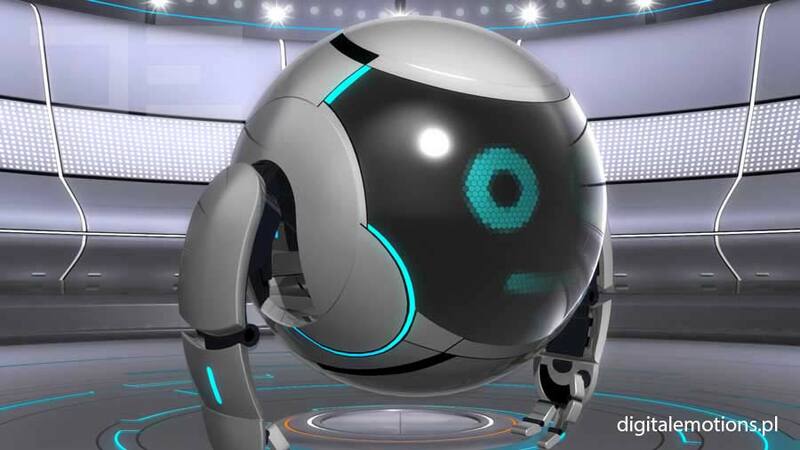 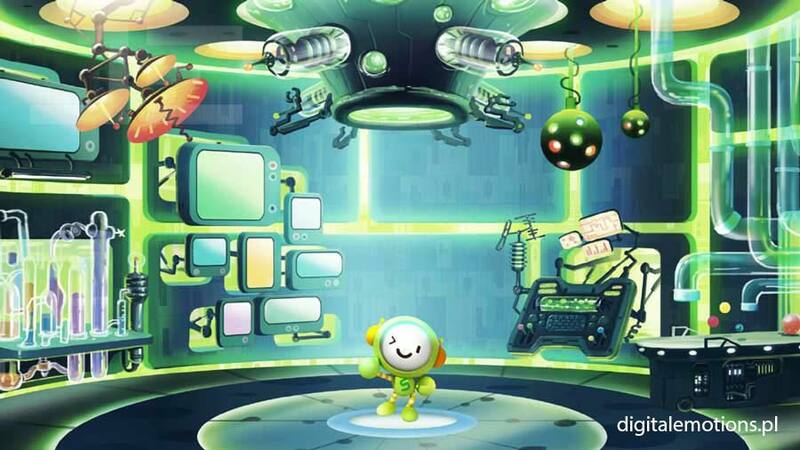 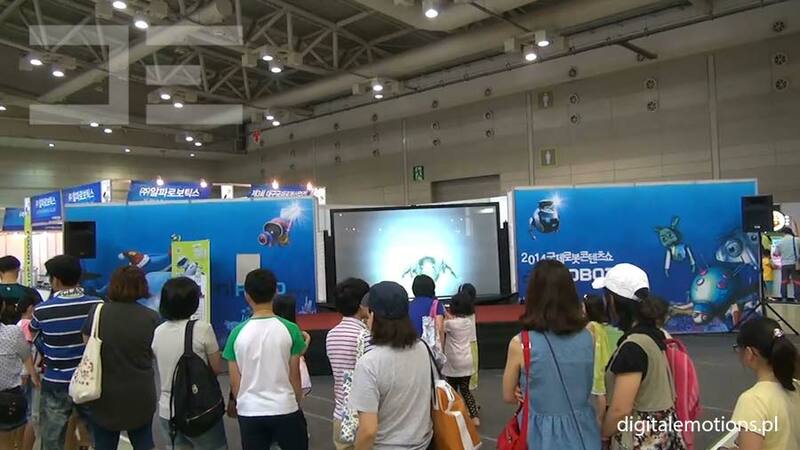 The interactive robot dubbed Hobi is a character that entertains, surprises and thrills. 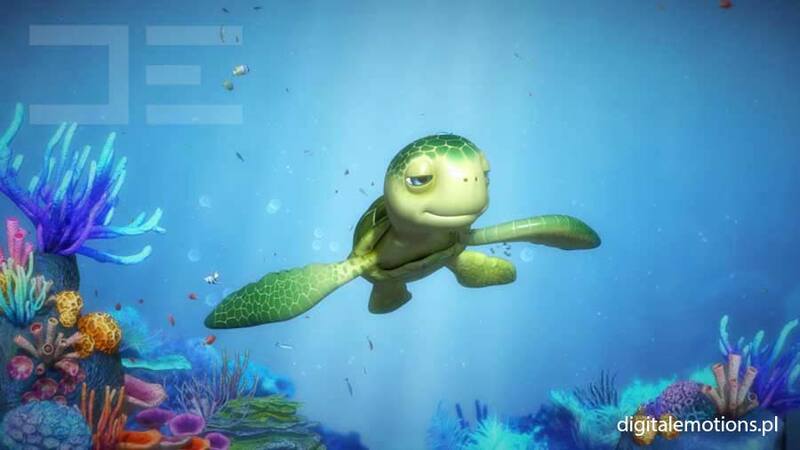 Its very developed facial expressions stand it out. 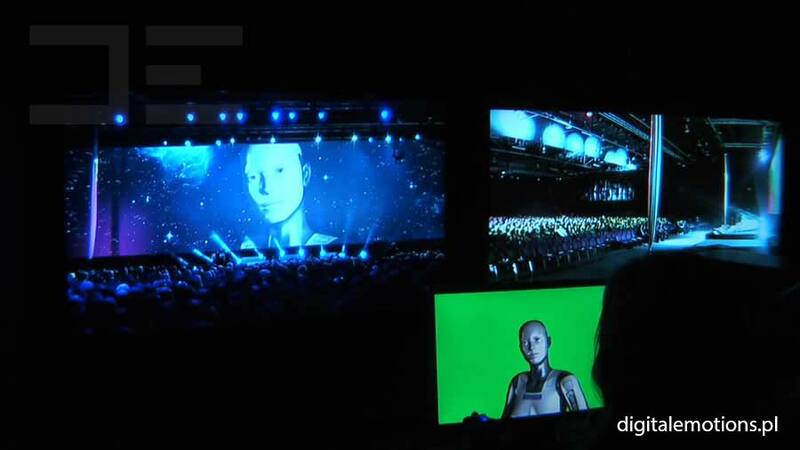 An actor controls the robot in real time and animates its body trunk, neck, each eyelid, eye ball, brows, lips, cheeks, ears, and even eye pupils. 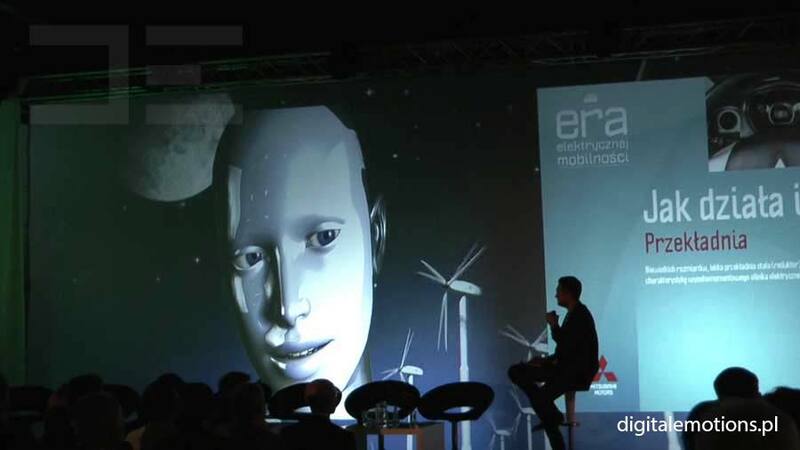 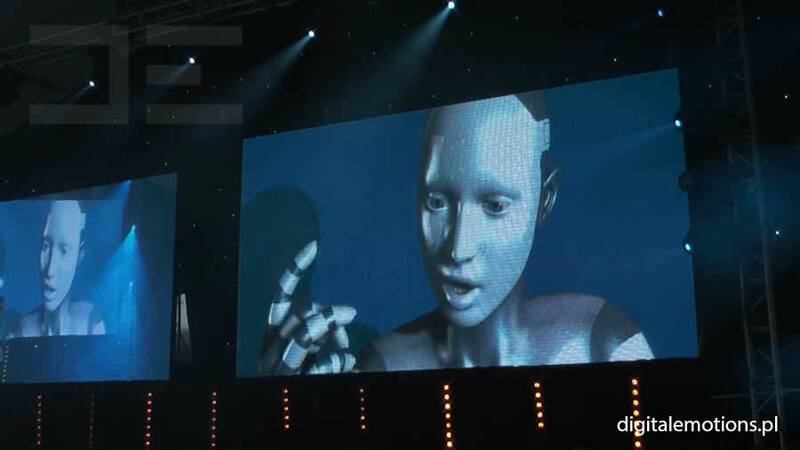 This enables the robot to gain almost human-like facial expressions and grasp the audience. 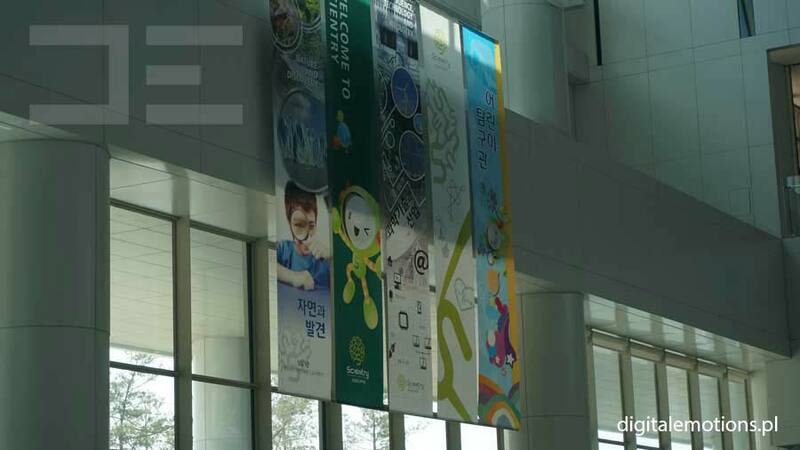 It represents the world of science-fiction, so it nicely suits all types of events related to technology, education, or science. 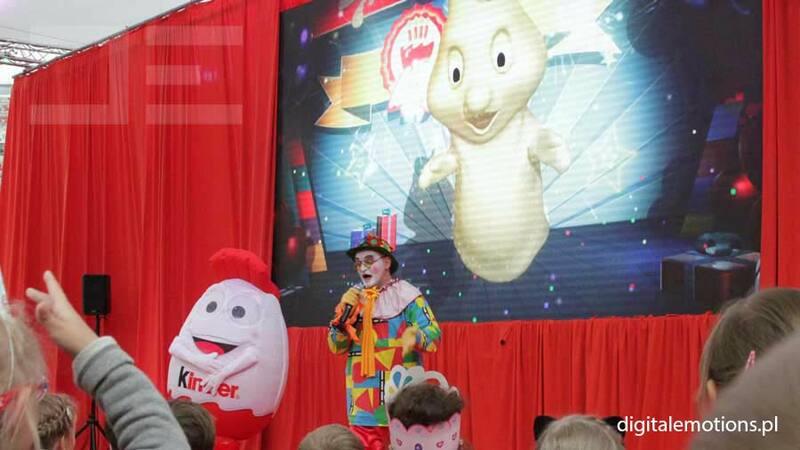 It is an expert, a mine of knowledge, and a comedian. 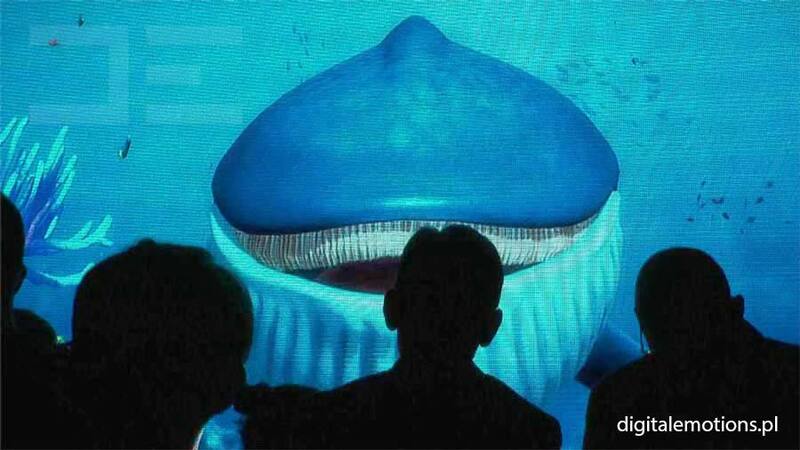 No one can remain indifferent when meeting it. 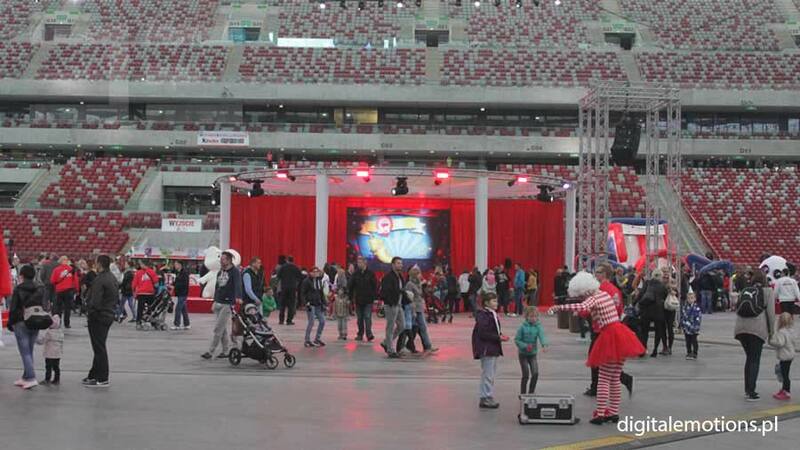 It makes an unforgettable fun moments! 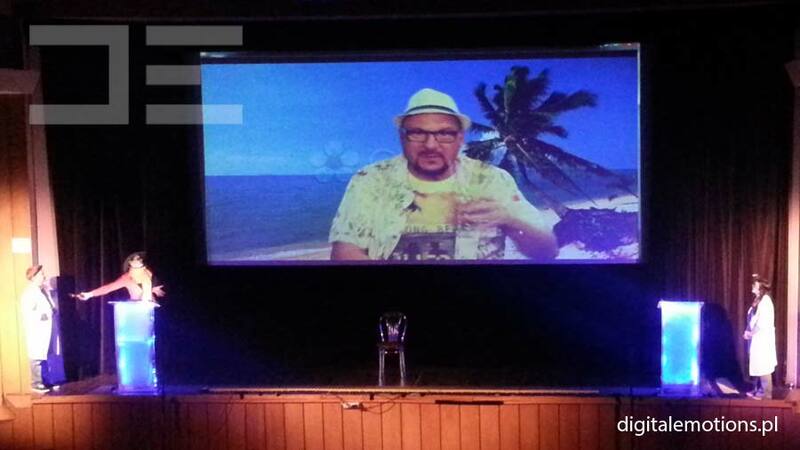 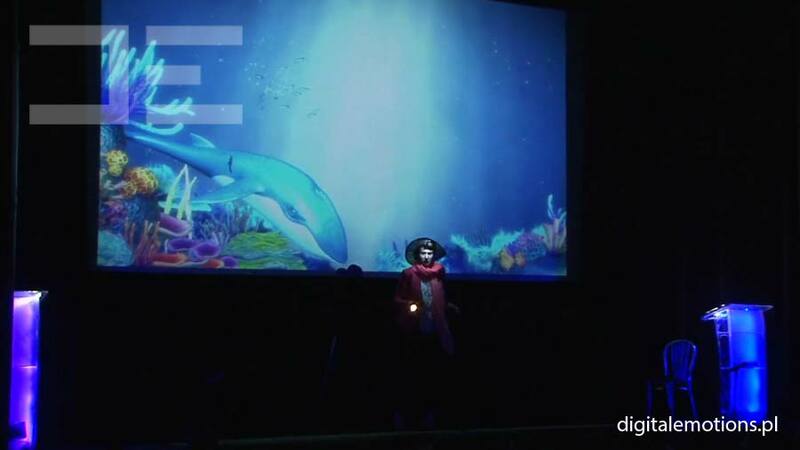 Our virtual actor performs on a theater stage! 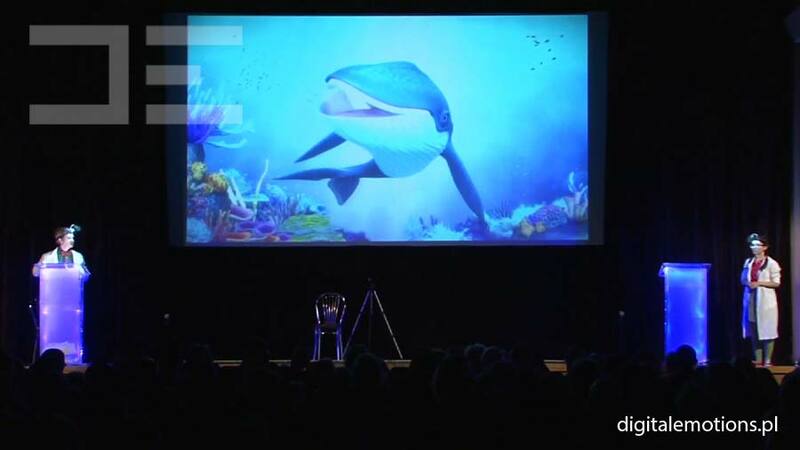 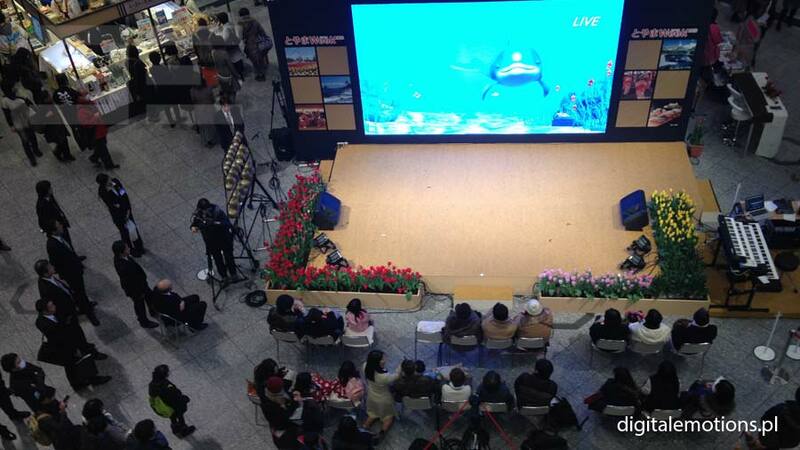 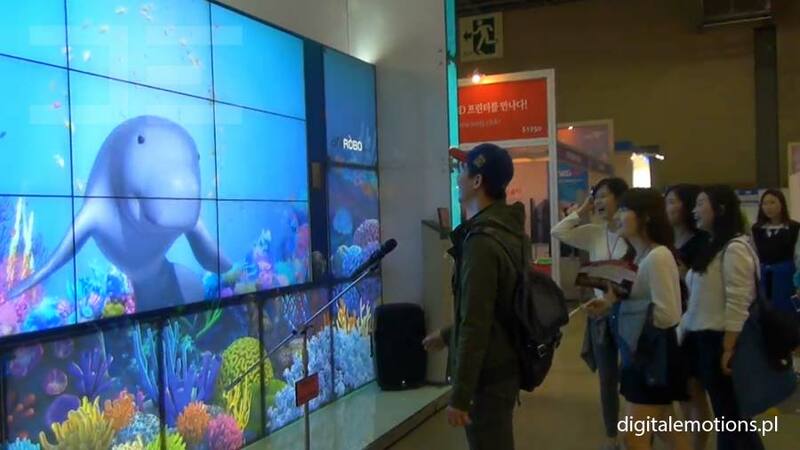 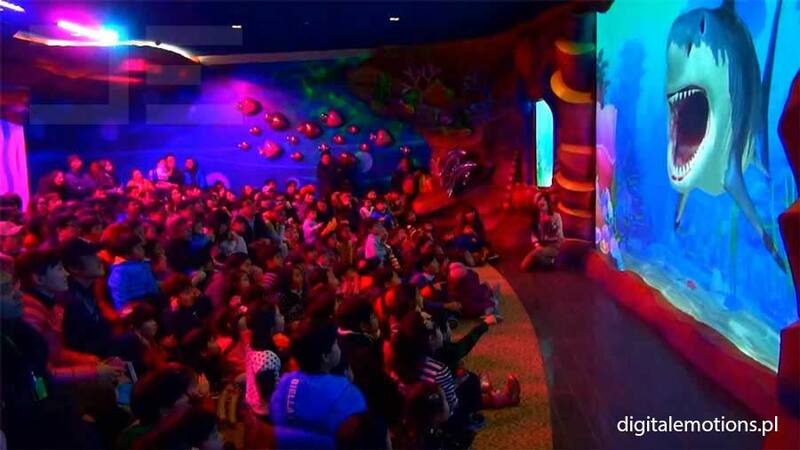 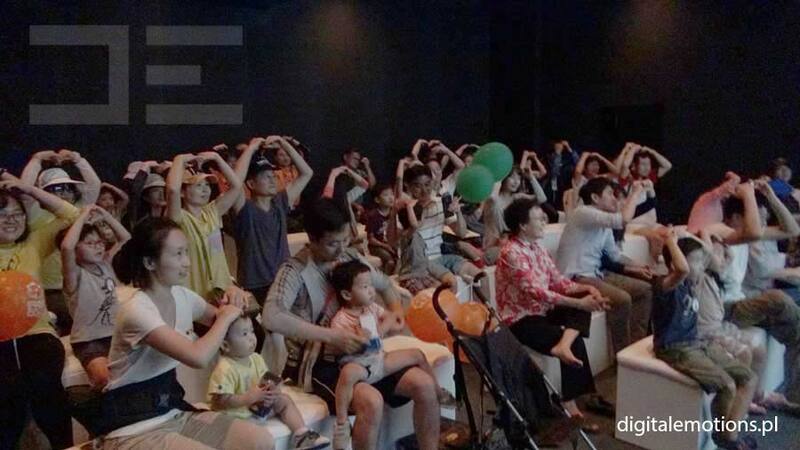 An interactive performance called “Bluey the Talking Whale” wins the hearts of young audiences. 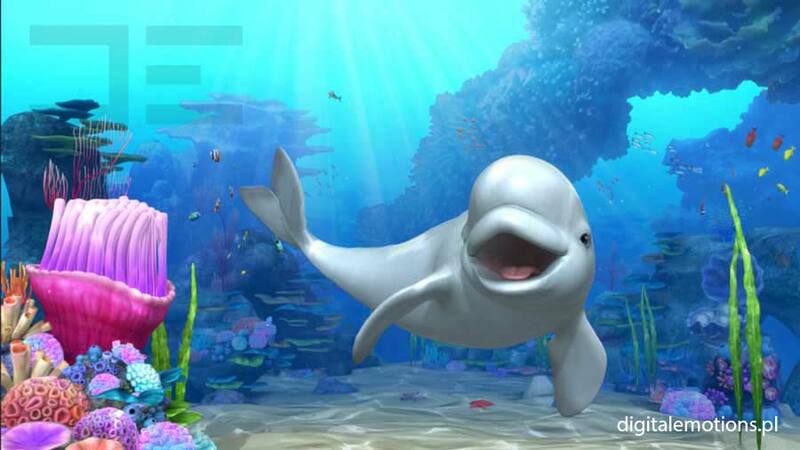 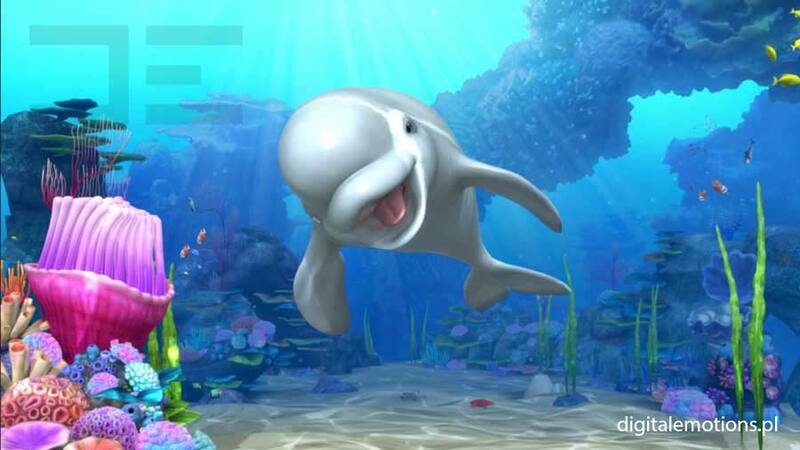 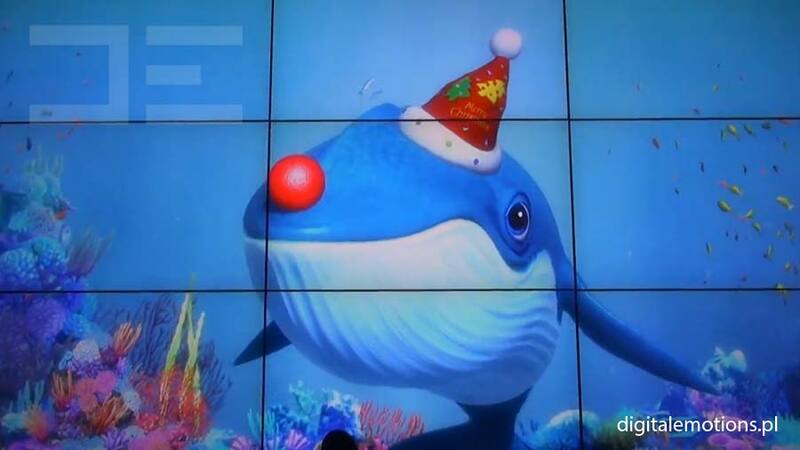 And it’s no wonder – who wouldn’t like to meet a happy animated whale as a kid? 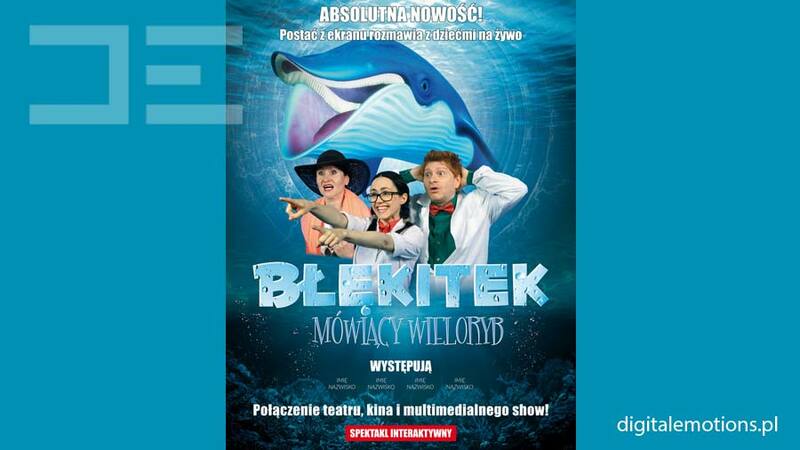 We’ve managed to combine the theater, the cinema, and a multimedia show enabling actors, such as Piotr Gąsowski, Tomasz Knapik, and, last but not least – Bluey, not only to talk together, but with the audience as well. 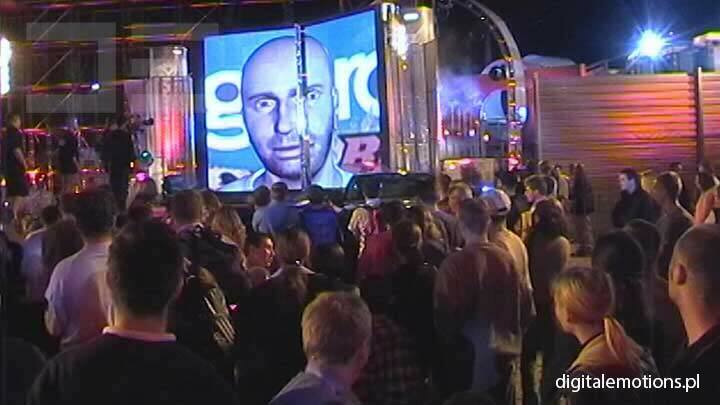 We create the new genre of entertainment! 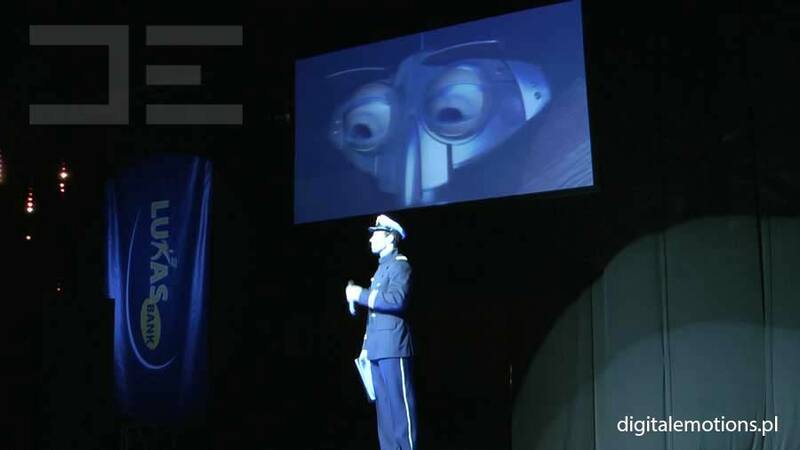 The show proves that the settings and possibilities for using the VIRTUAL PUPPET technology in the theater are almost unlimited. 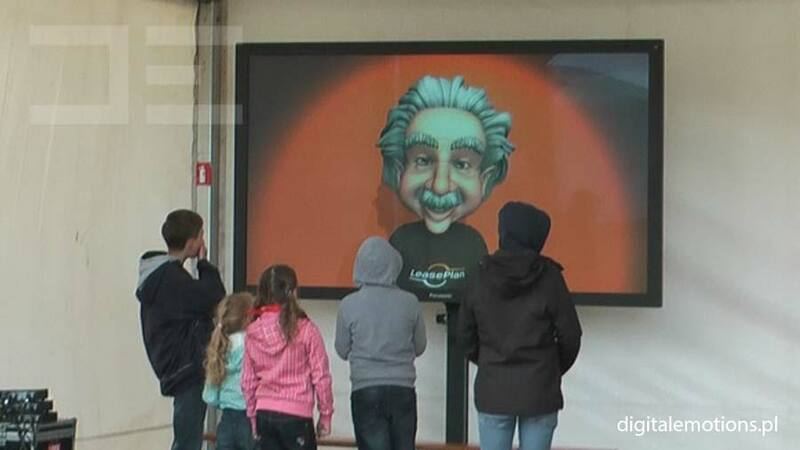 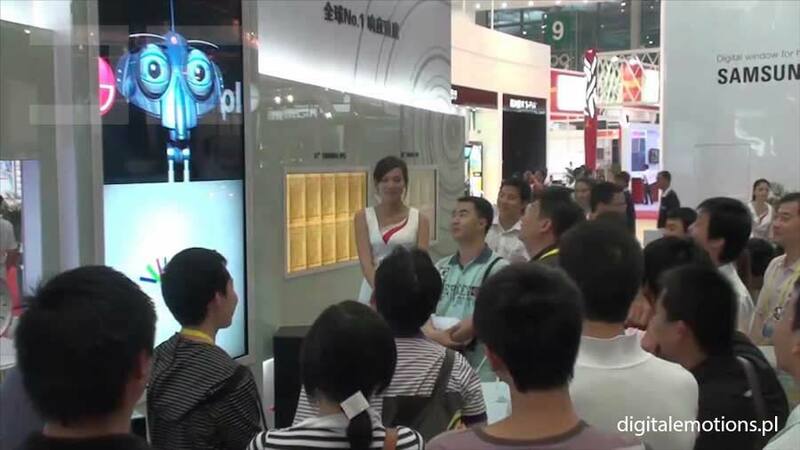 Our installations perfectly match Roadshow-type promotional campaigns. 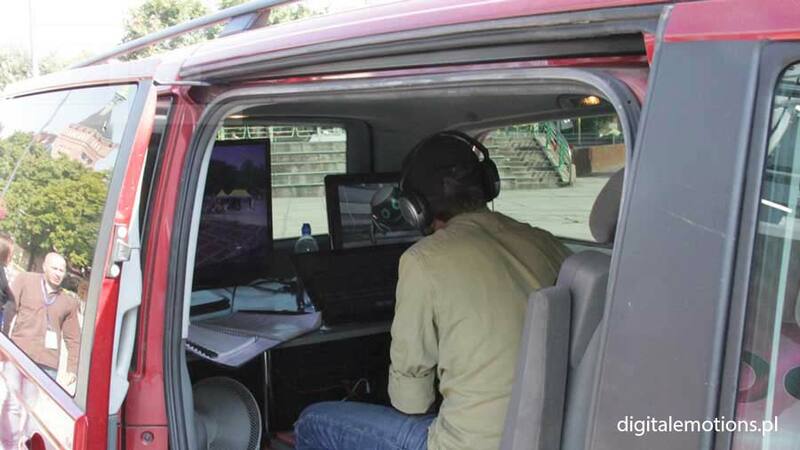 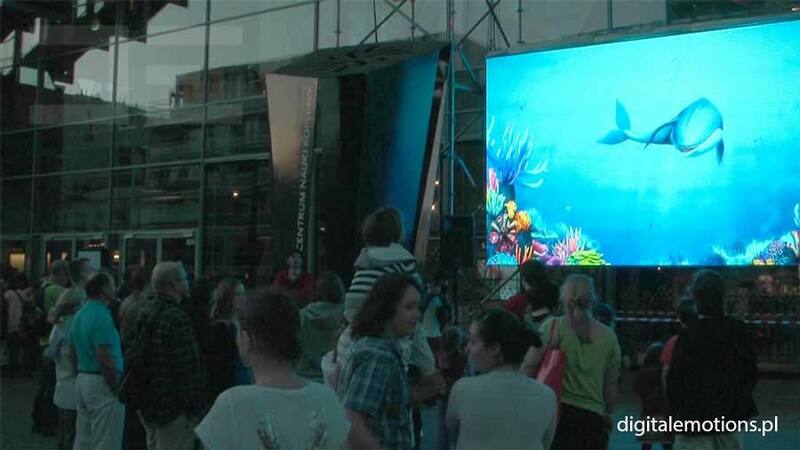 The whole system is very easy to install and use, and so it can be successfully transported and utilized to entertain audiences in different cities and during long campaigns. The attached film depicts an example of how an interactive character combines with advanced action in real world. 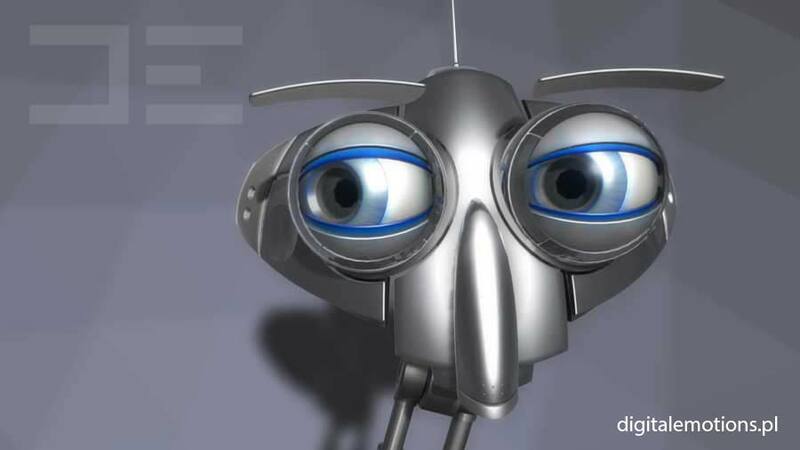 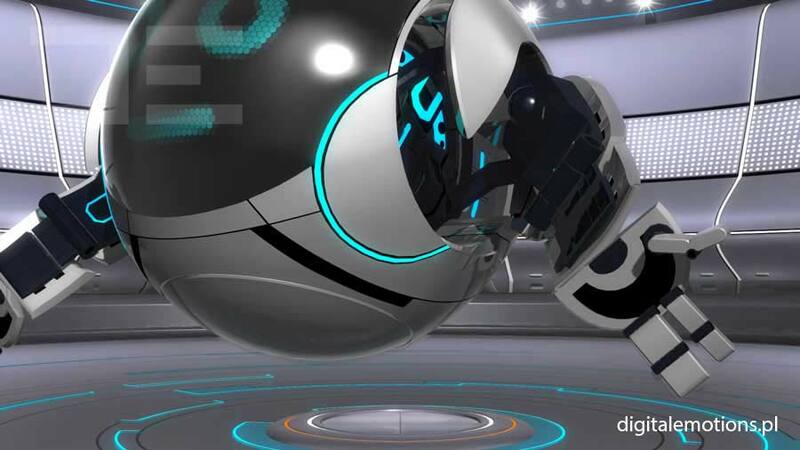 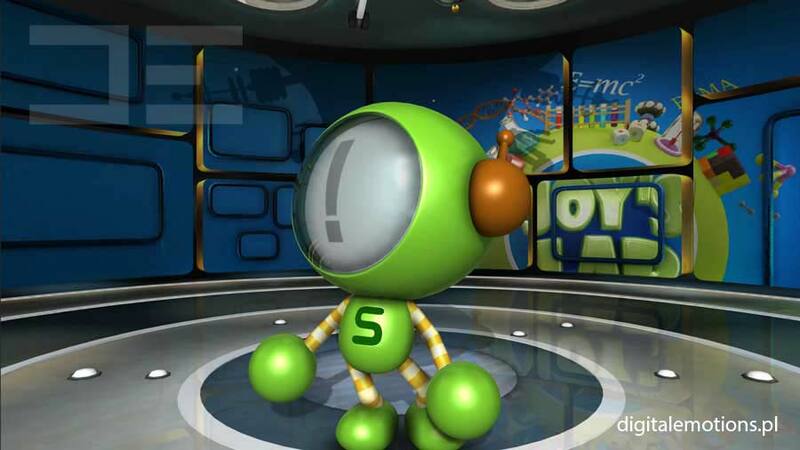 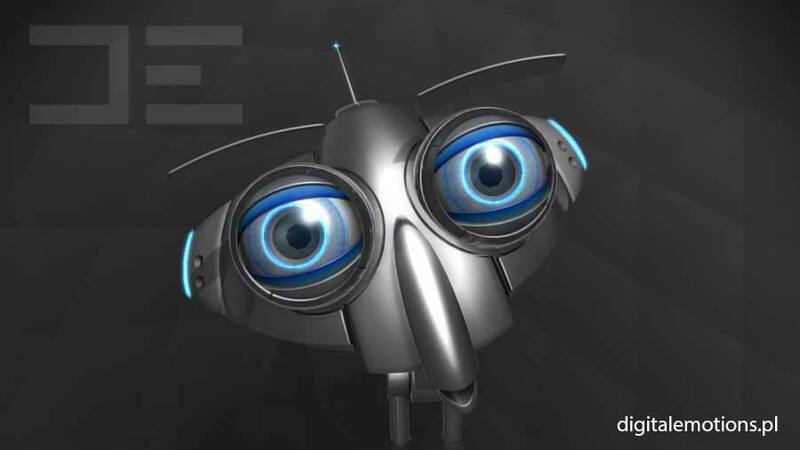 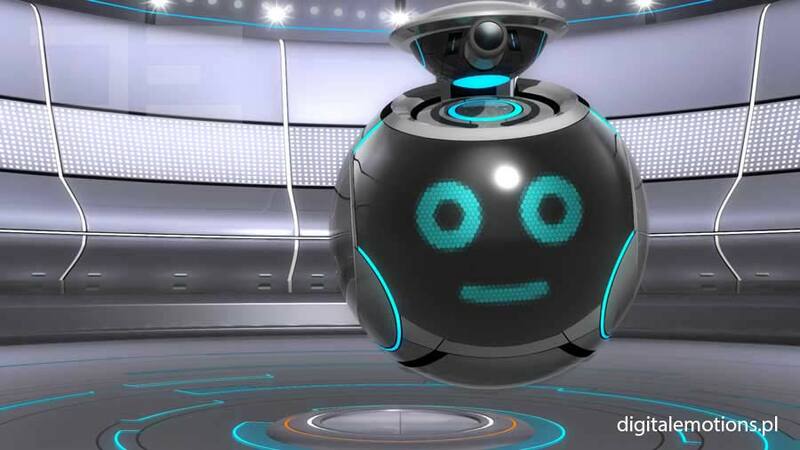 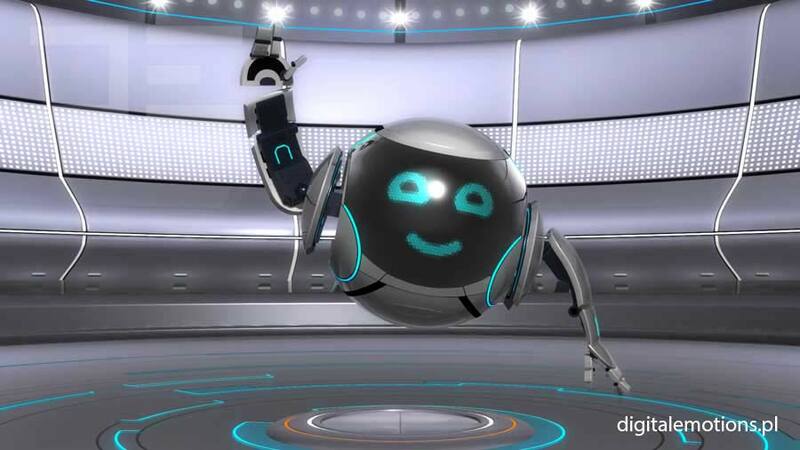 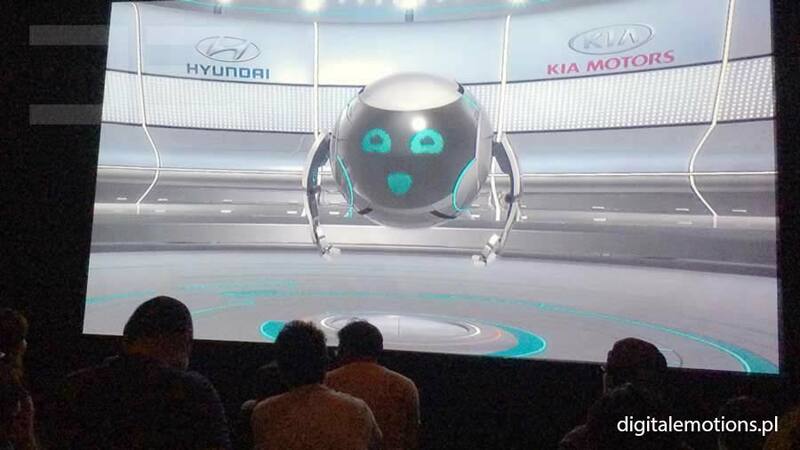 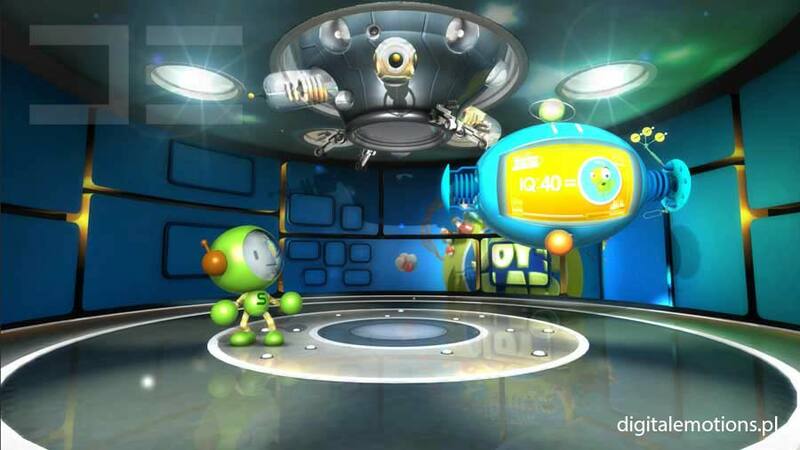 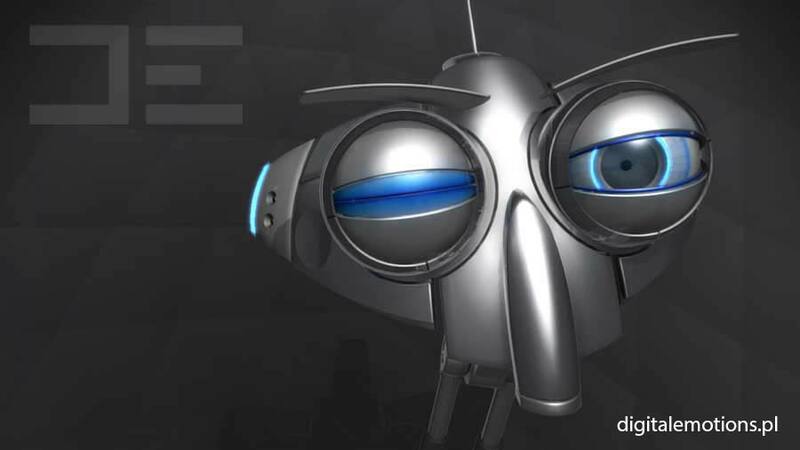 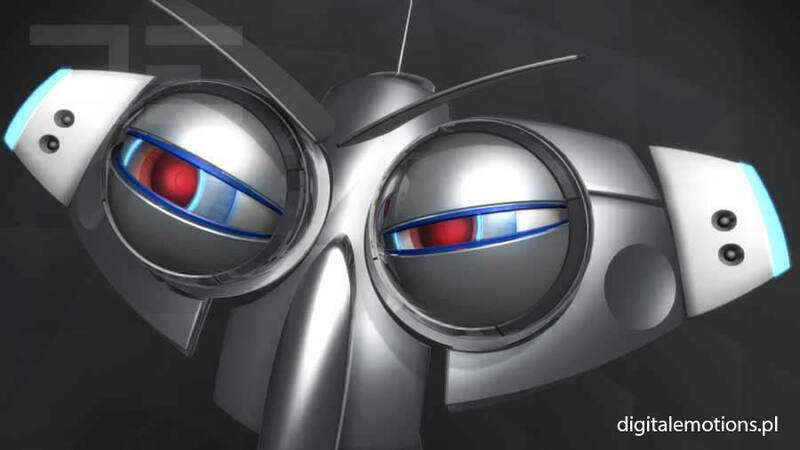 The entirety of the show is led by a virtual world character – the Cyfra robot, which also animates activities of dance teachers. 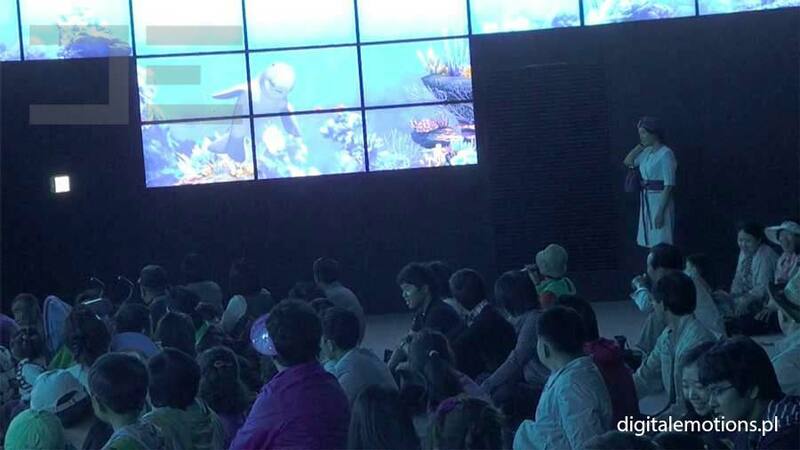 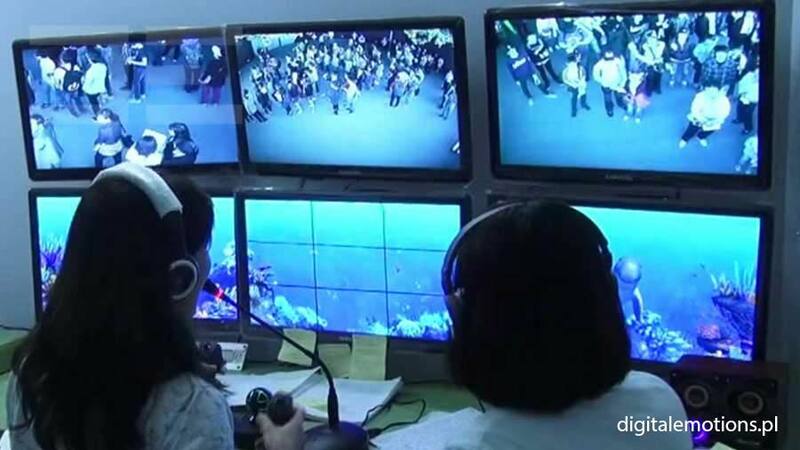 Moreover, Green Box was also used, which enabled the participants to see themselves on the screen and next to the virtual host. 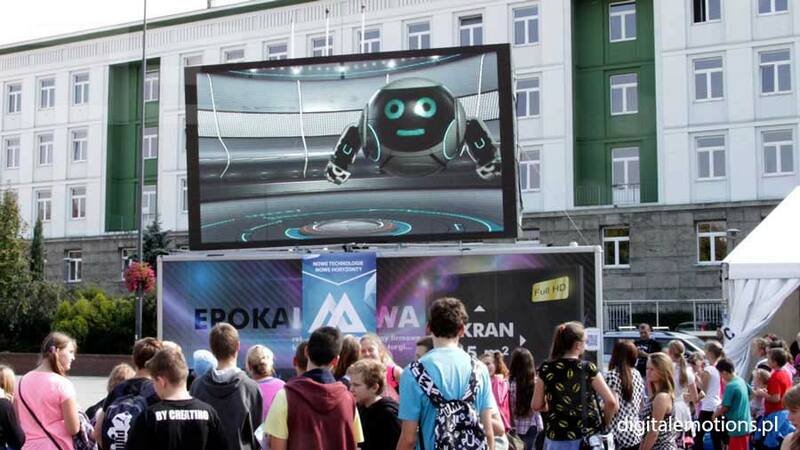 A very successful campaign that will be remembered by event participants for a long time! 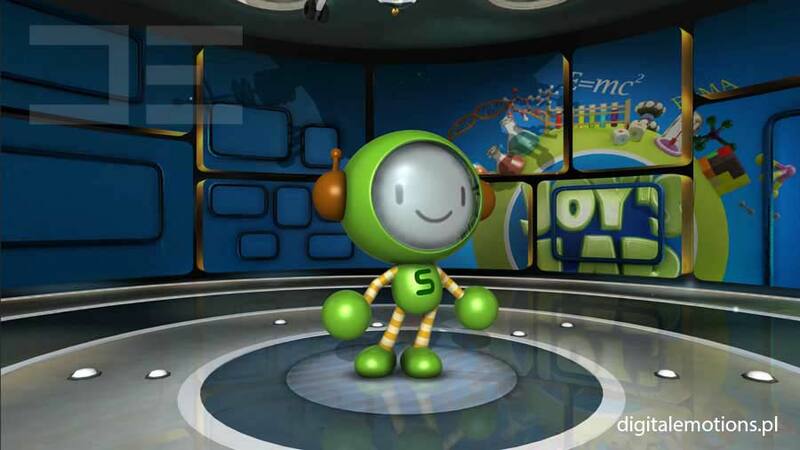 It is an virtual character created specially for the young ones. 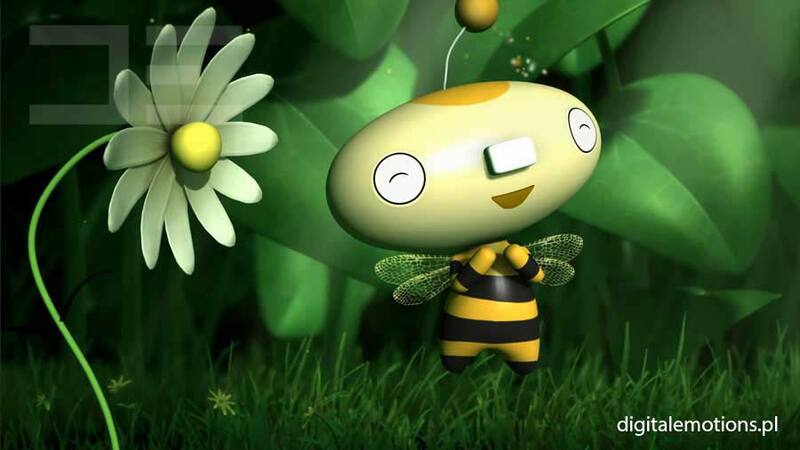 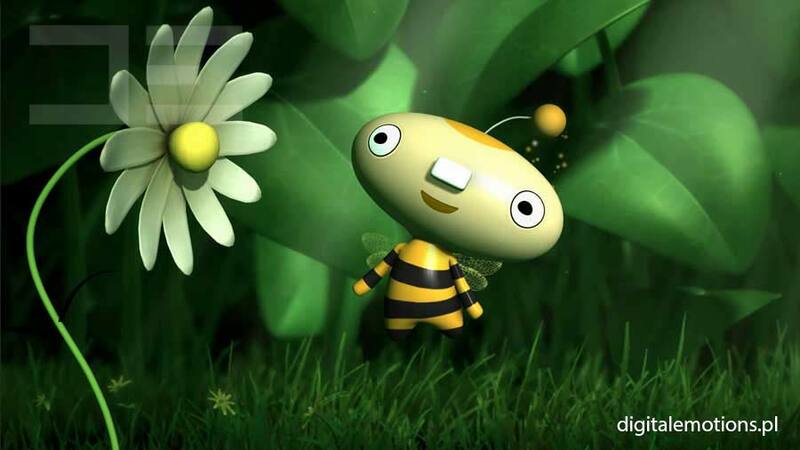 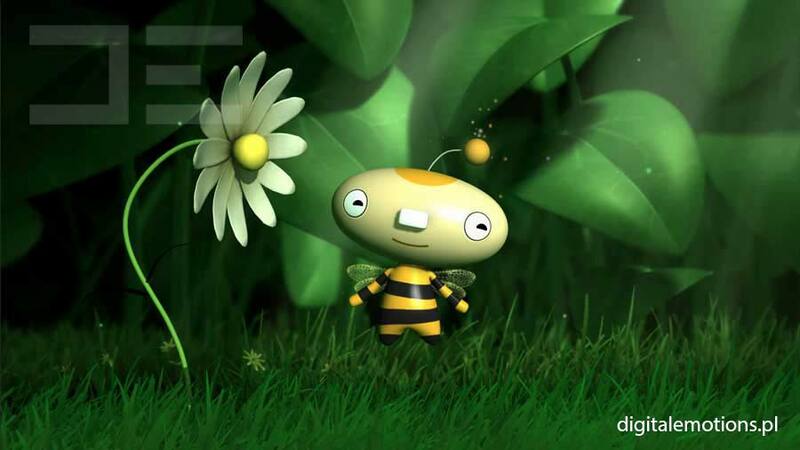 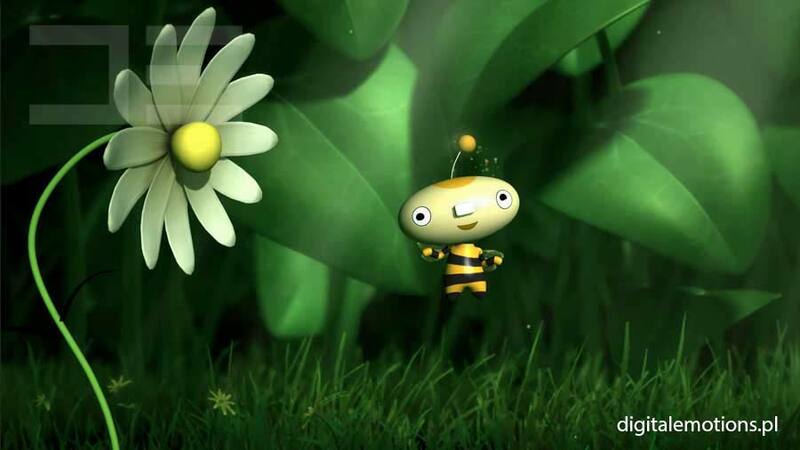 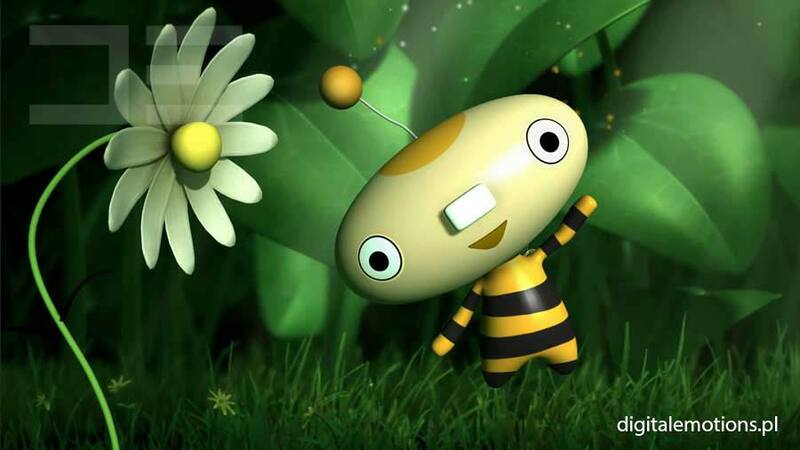 POLA the bee takes children to a microcosm world inside a meadow, tells the secrets and fun facts from the lives of little creatures. 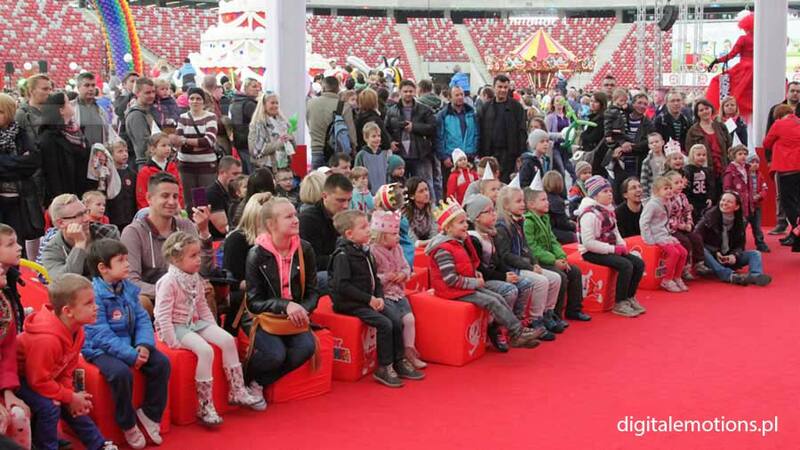 The show can take an adventurous or educational spin, and it can also be part of large events that need a separate attraction to cater for children. 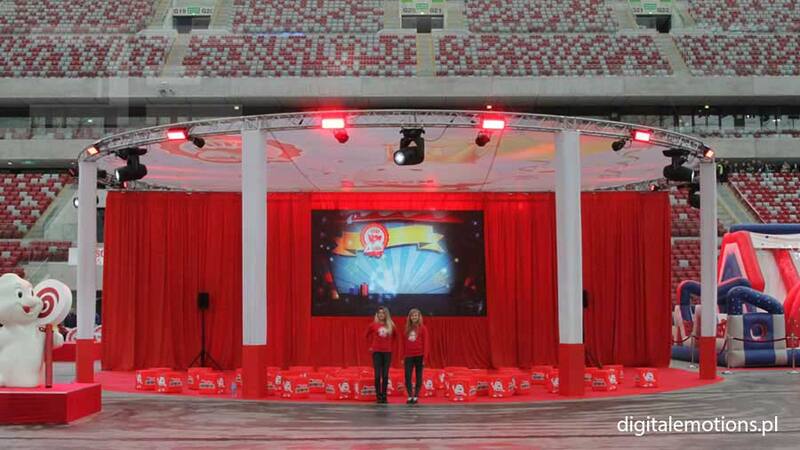 We have an innovative approach to events like presentations or conferences. 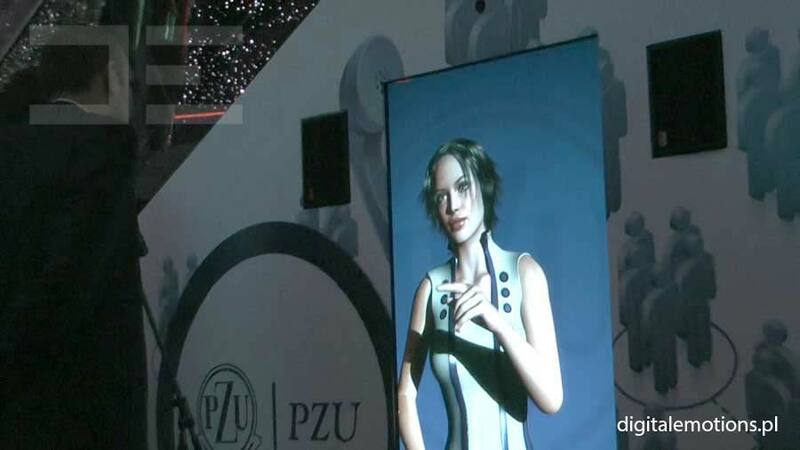 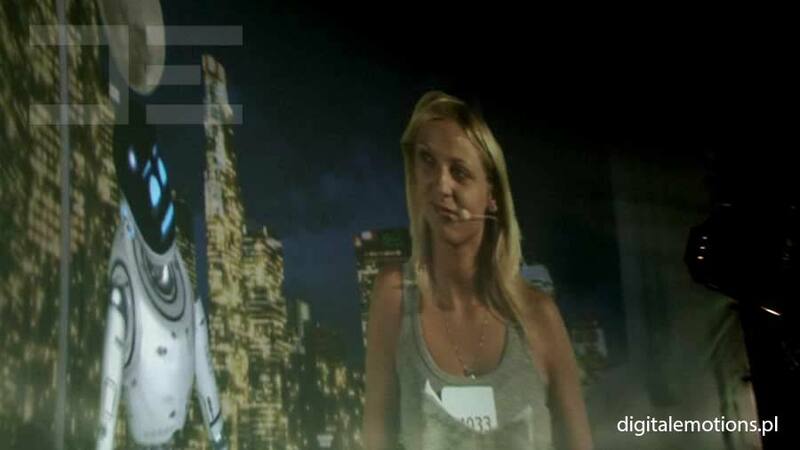 An virtual character appearing on a giant screen can be a host leading an entire lecture, but it is just as good for having a conversation with a real presenter. 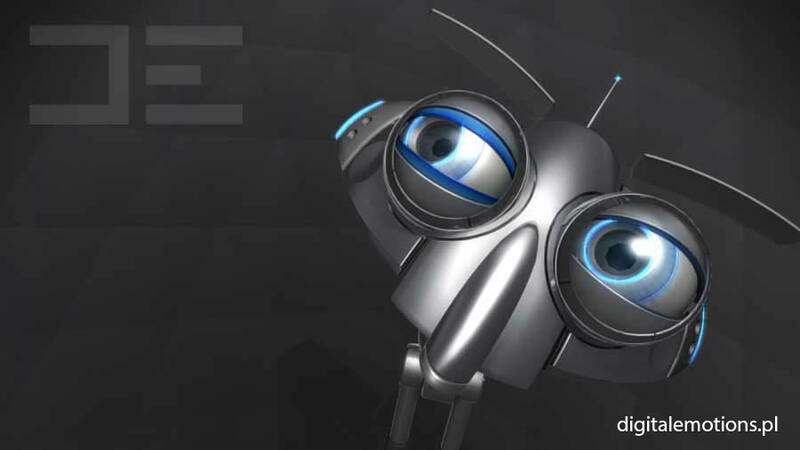 Using advanced modern technologies lifts the effectiveness of reaching out to clients. 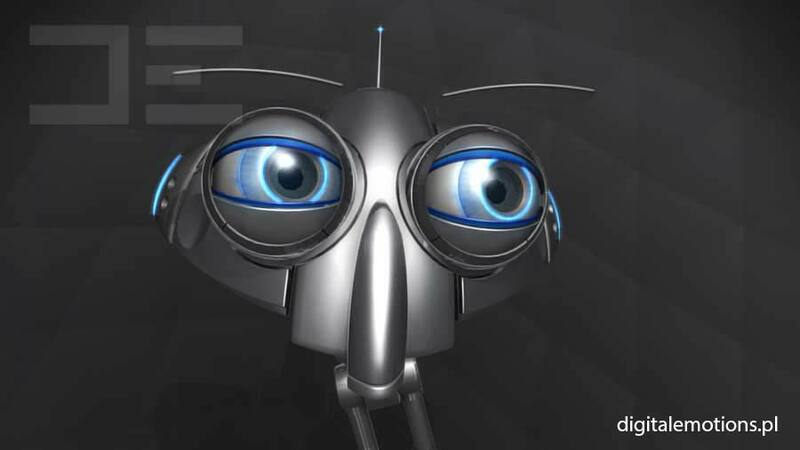 All charts, presentations, guidelines, and issues important to the client are no longer mere PowerPoint presentation. 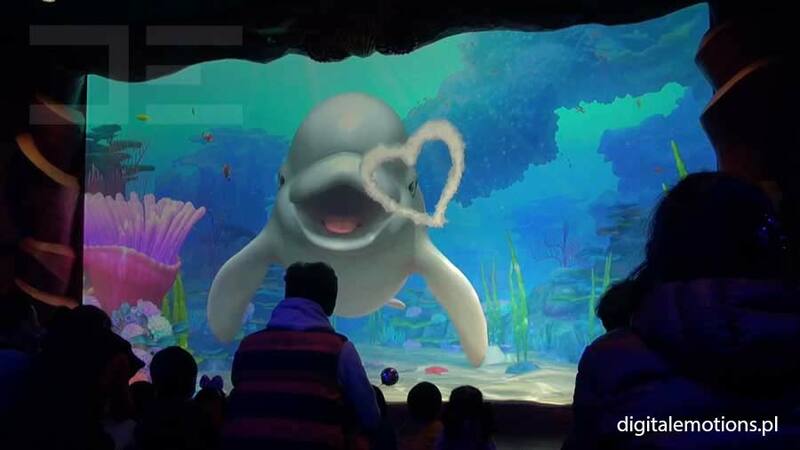 They become part of an interesting multimedia show. 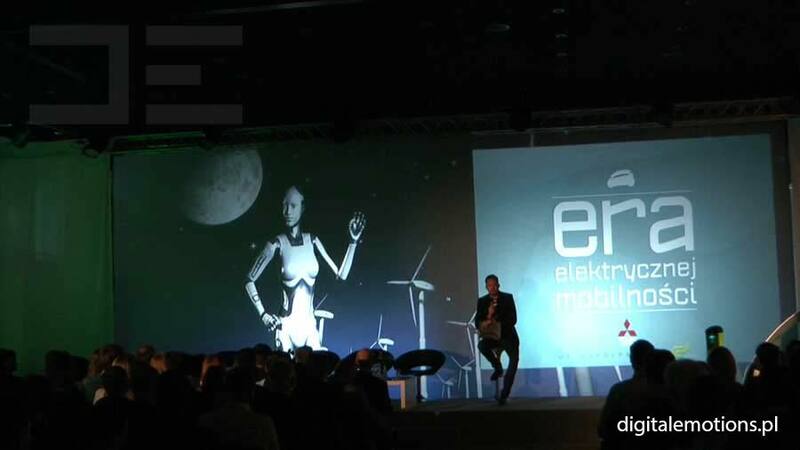 Using our technology is a breath of fresh, future air. 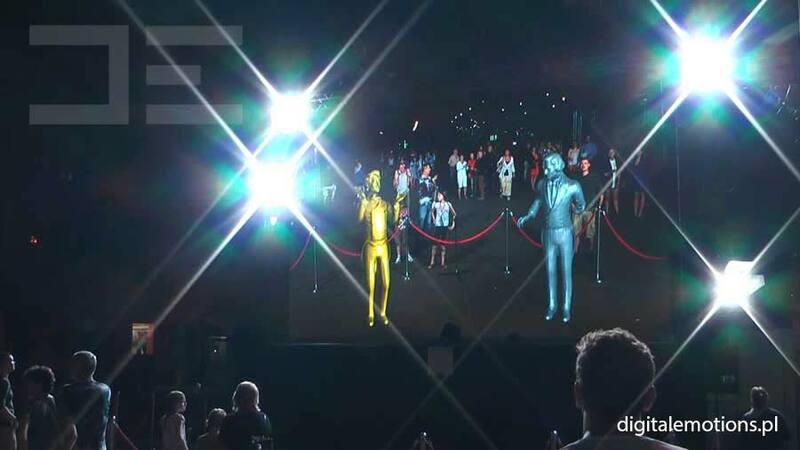 We are able to scan, develop, and put any historical or contemporary figure into our installation. 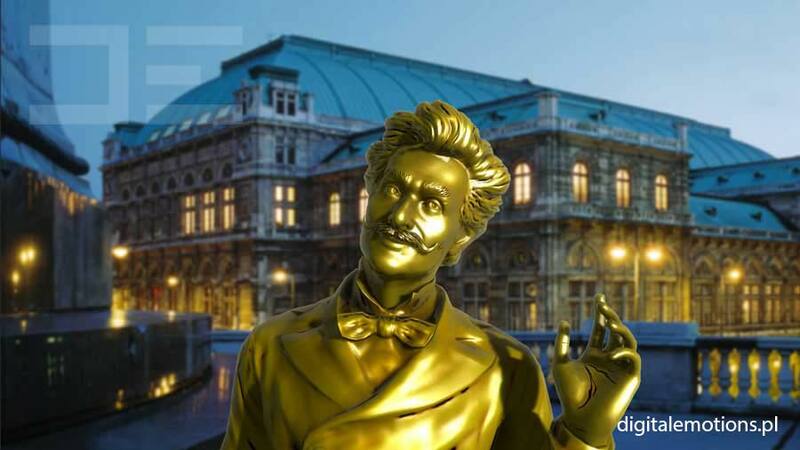 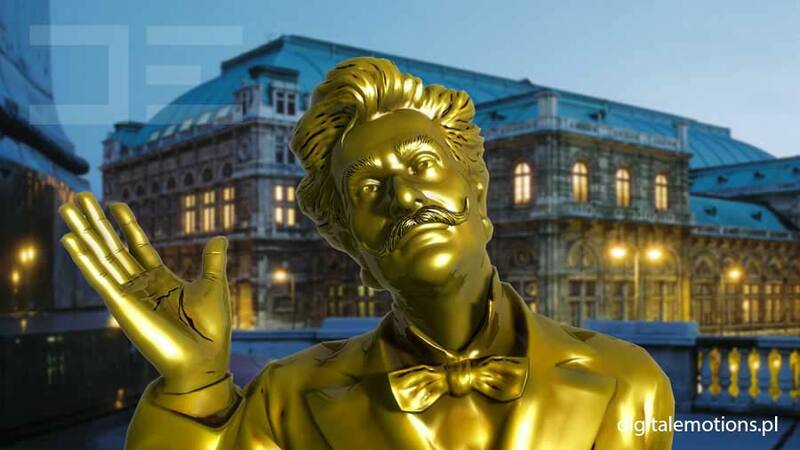 To promote the city of Vienna in Poland, we have created an interactive version of Johann Strauss’s monument, which attracted loads of intrigued people in Warsaw. 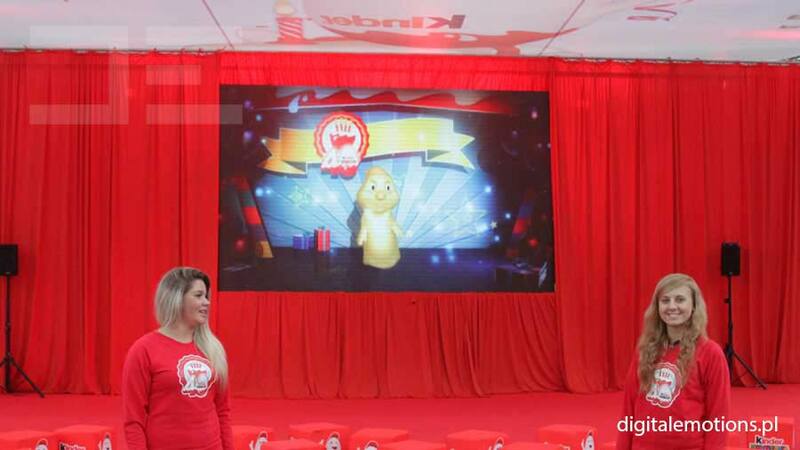 The character is a great example of a campaign custom-prepared for the client. 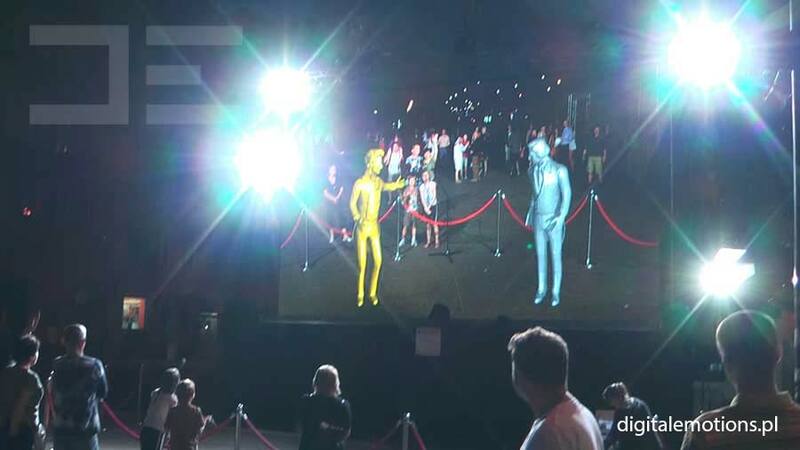 We can make an virtual character for literally any human being – a famous actor, sportsperson, scientist, politician, or the founder of a company ordering the event. 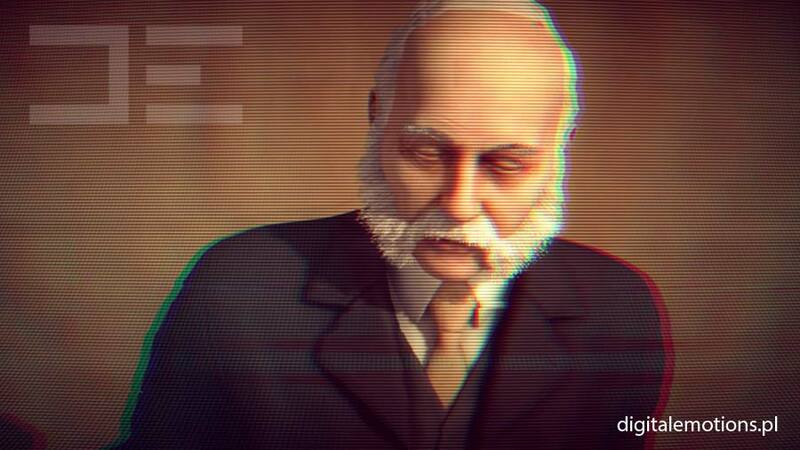 We will breathe life into any virtual character. 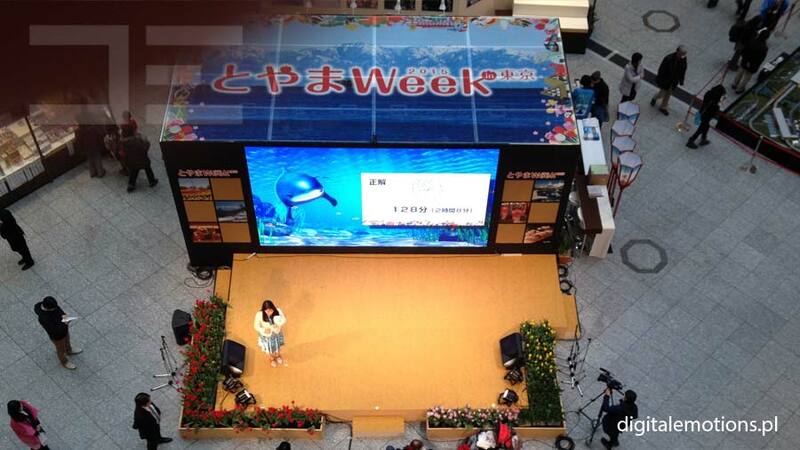 We are looking forward to challenges! 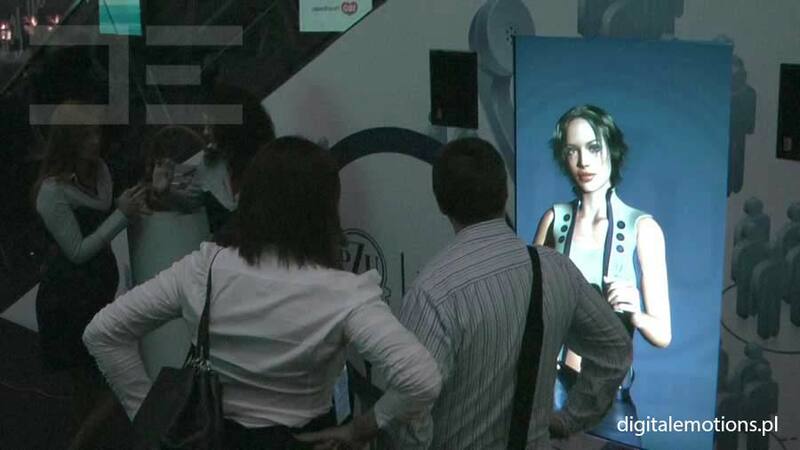 Our installations can work in 3D technology. 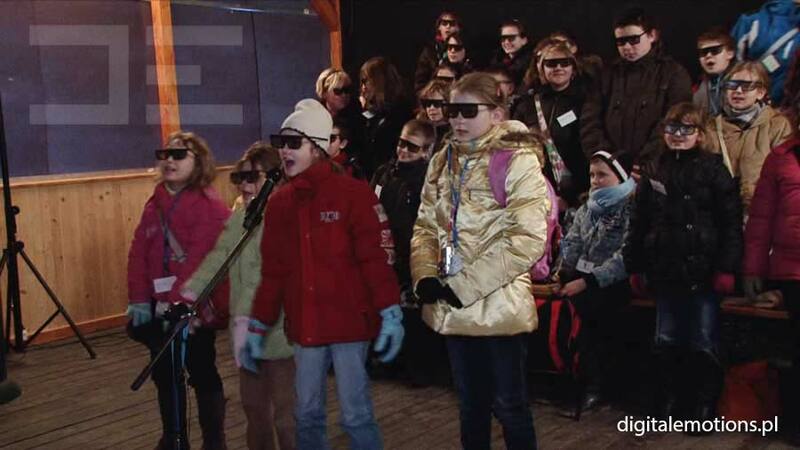 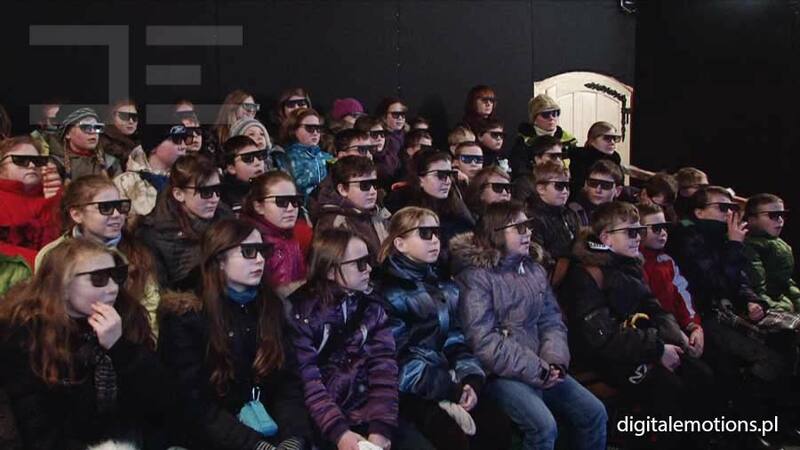 It is necessary for the audience to use 3D stereoscopic glasses enabling spatial viewing. 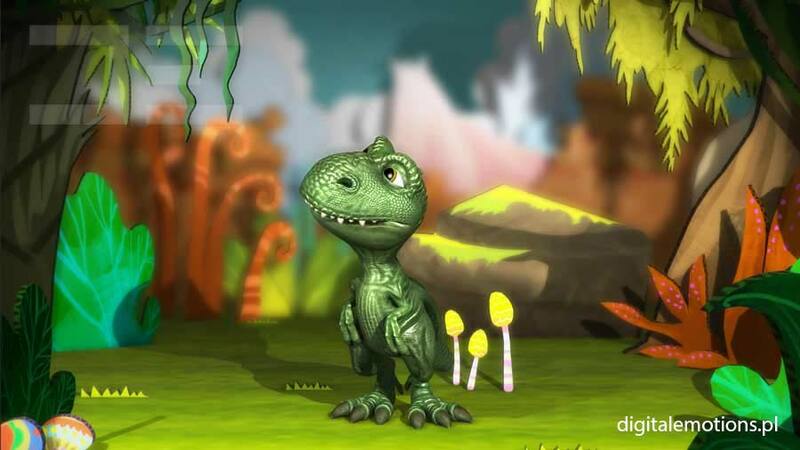 A show carried out in Dinozatorland is an educational show for children with various quizzes, competitions, and learning songs. 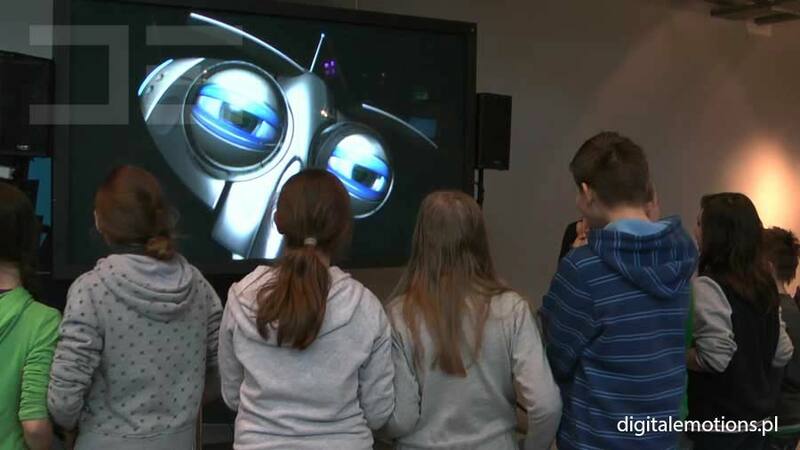 A combination of interactive characters with 3D picture leaves children agape and has attracted vast interest in our installation for years now. 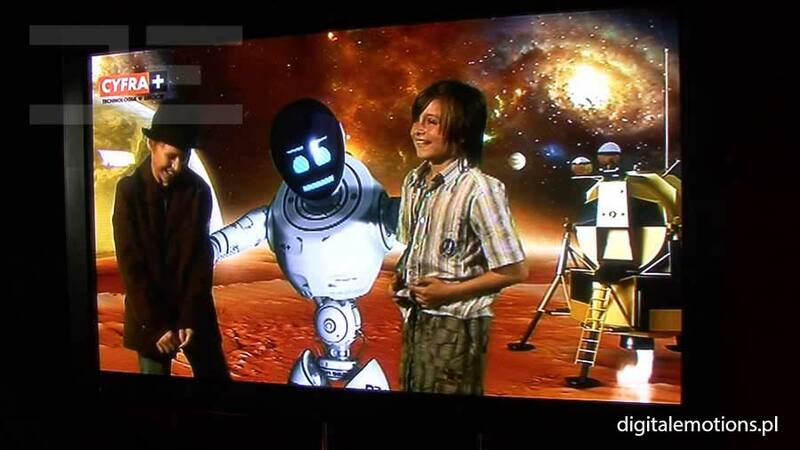 Our characters do great when communicating with children. 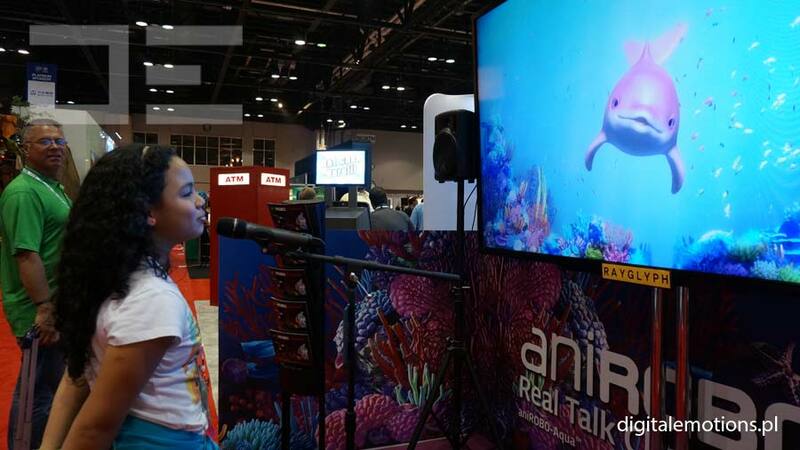 Passing educational content is no longer a lecture – it becomes an emotional experience with meeting an “artificial intelligence”. 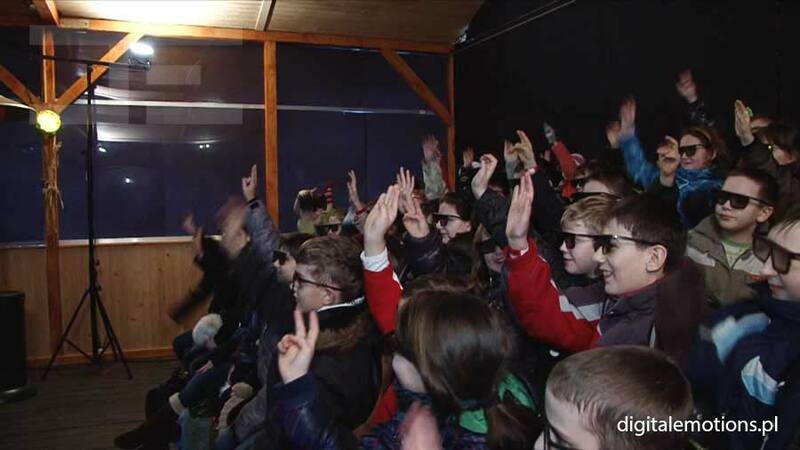 Our interactive Professor engages in lively discussions with children, telling wonderful stories about curiosities from the world of science. 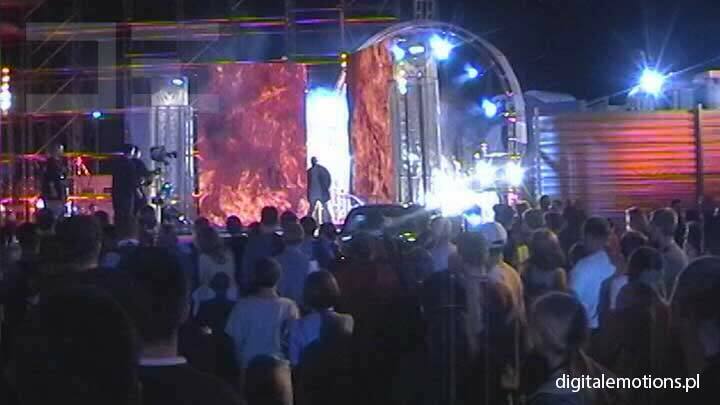 The show may regard any topic suggested by the client. 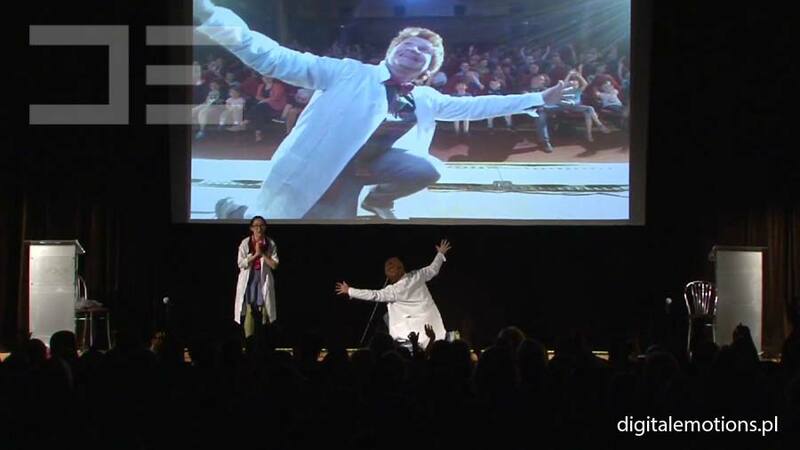 The professor teaches and entertains at the same time, but it is of course not infallible, which leads to comical situations. 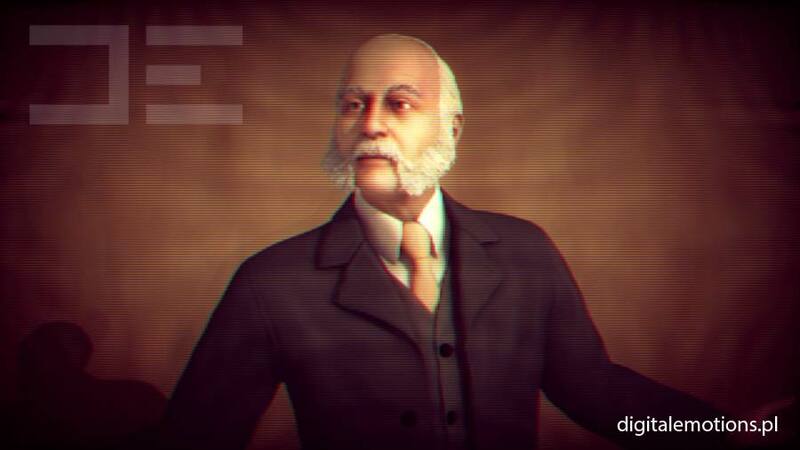 It holds great knowledge, but primarily it is the Einstein of interaction! 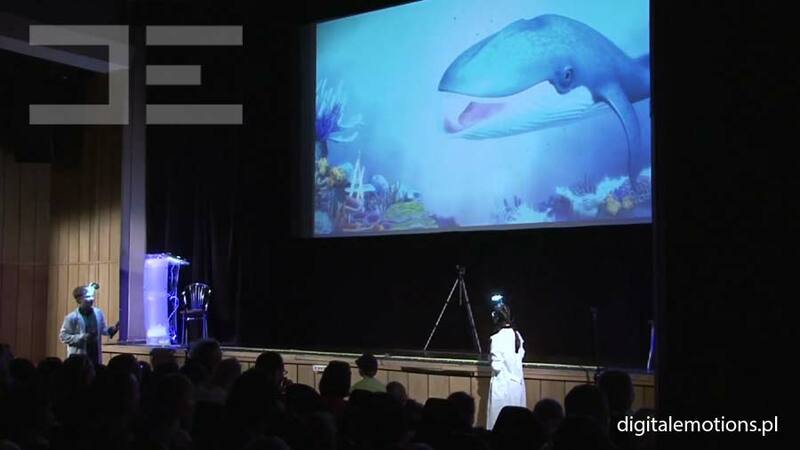 This kind creature perfectly suits theme amusement parks, museums, and science centers – places where the curiosity of a child meets prehistory and creatures living in distant past. 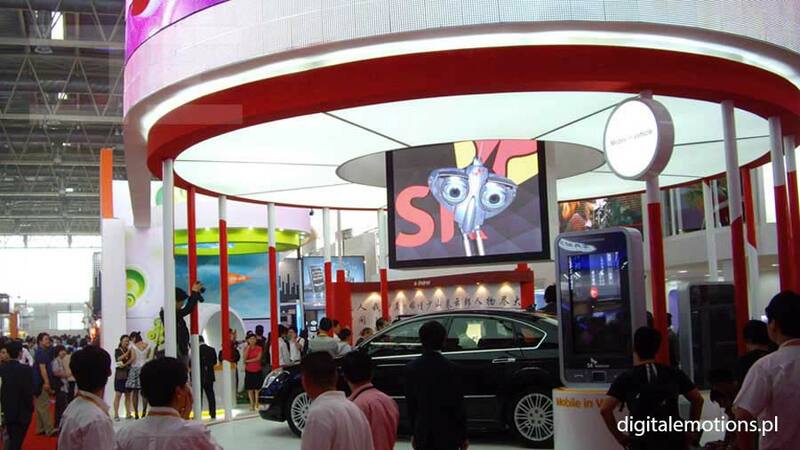 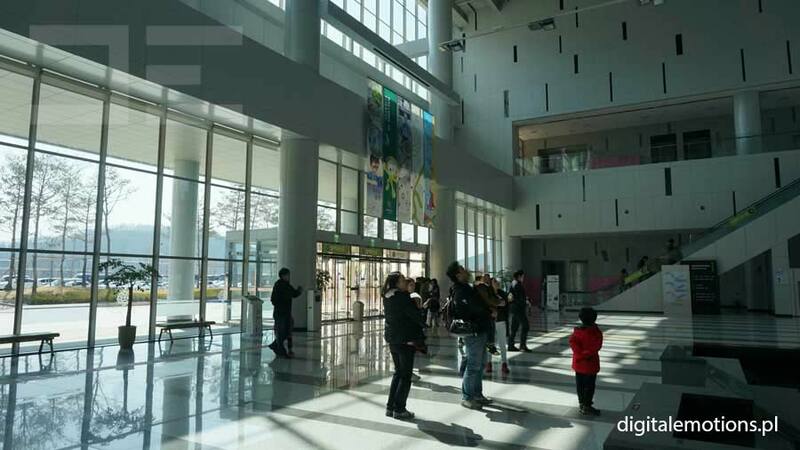 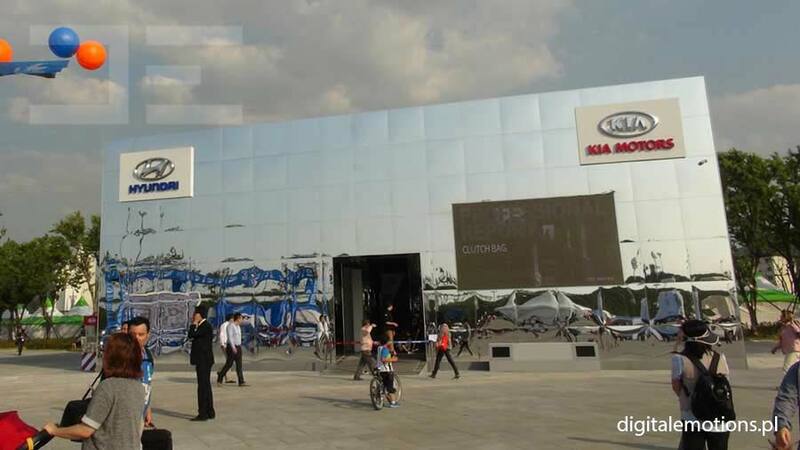 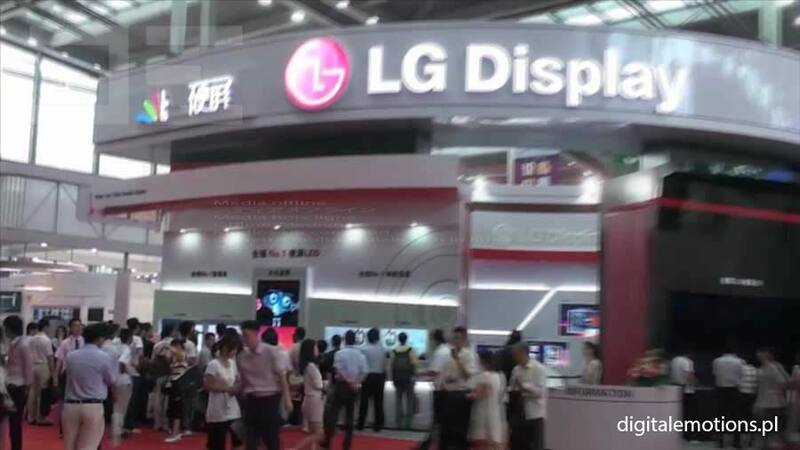 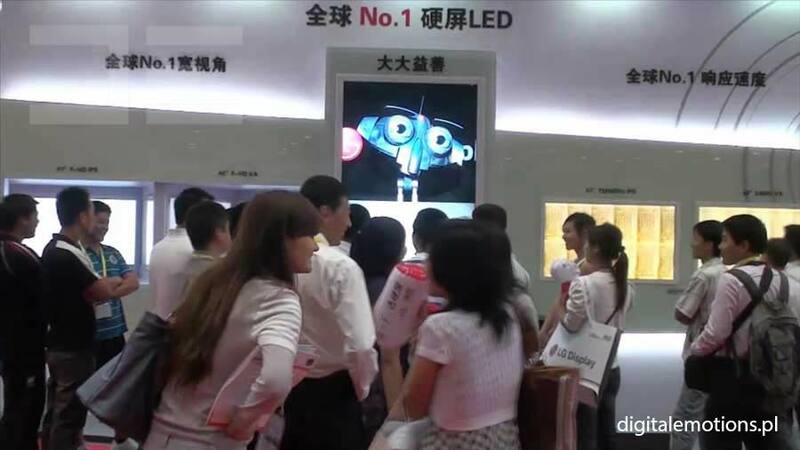 The show’s exact content will be customized according to client’s specifications. 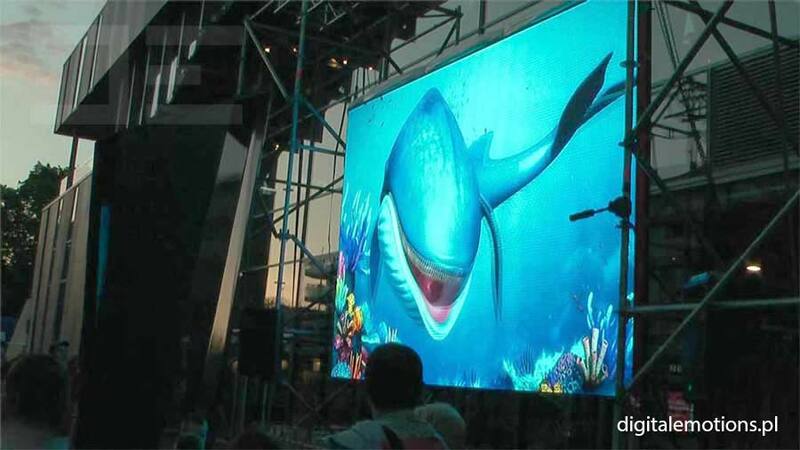 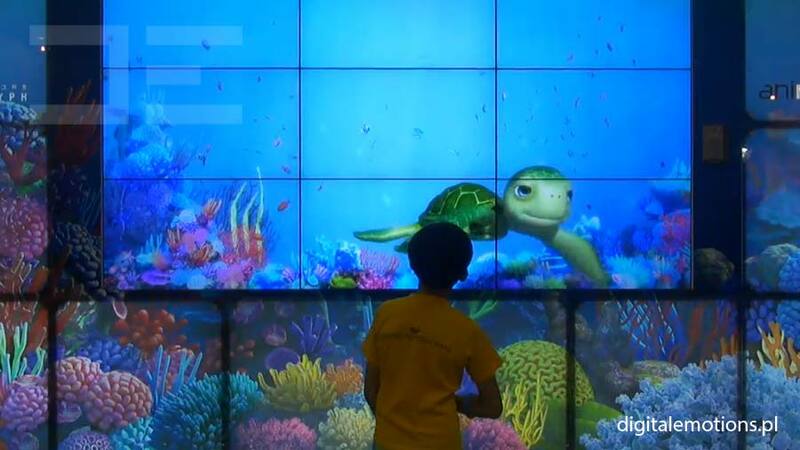 Of course we can also incorporate educational films or other materials into our installations. 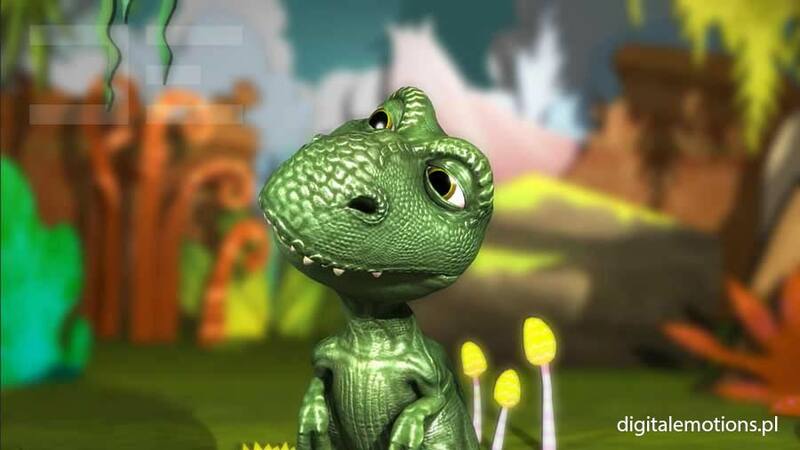 The show given by Dino is our new fresh product and it awaits its premiere. 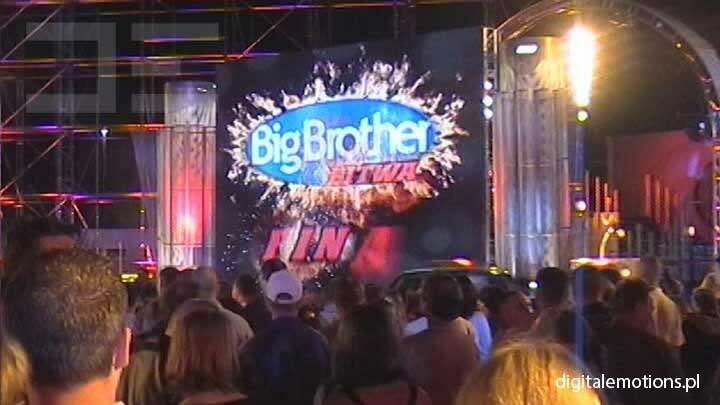 Has anyone seen the actual Big Brother? 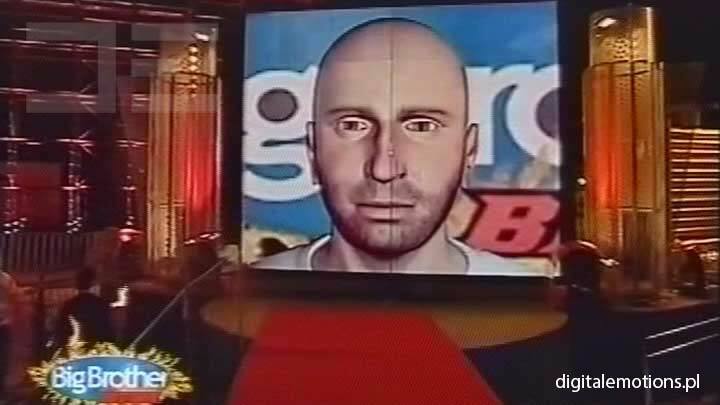 Has anyone from outside the house ever talked to him? 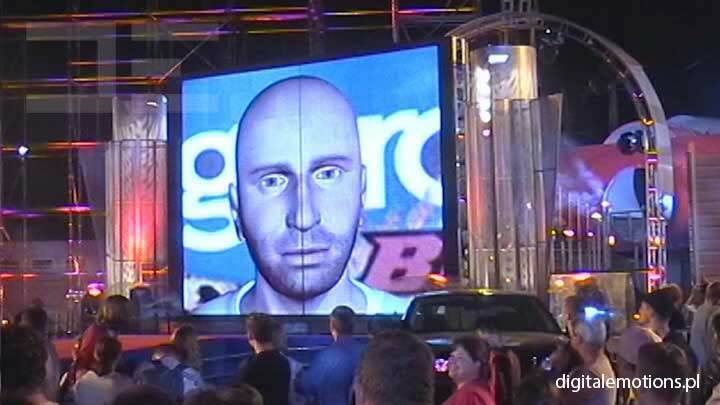 It wasn’t possible until we gave him his looks thanks to Digital Emotions. 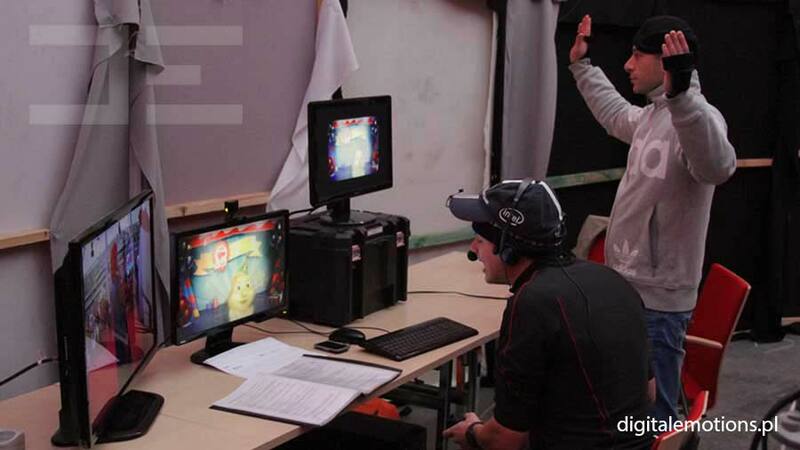 Our virtual counterpart of the person who has controlled the lives of program participants for a long time took part in the grand finale of the first edition of this famous reality show. 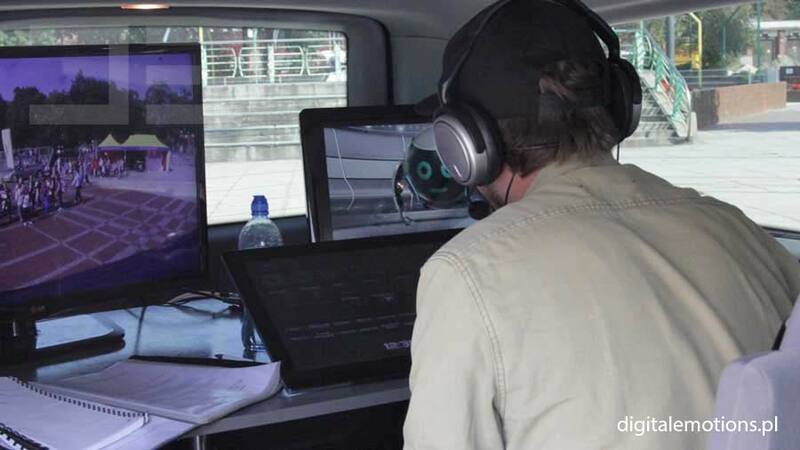 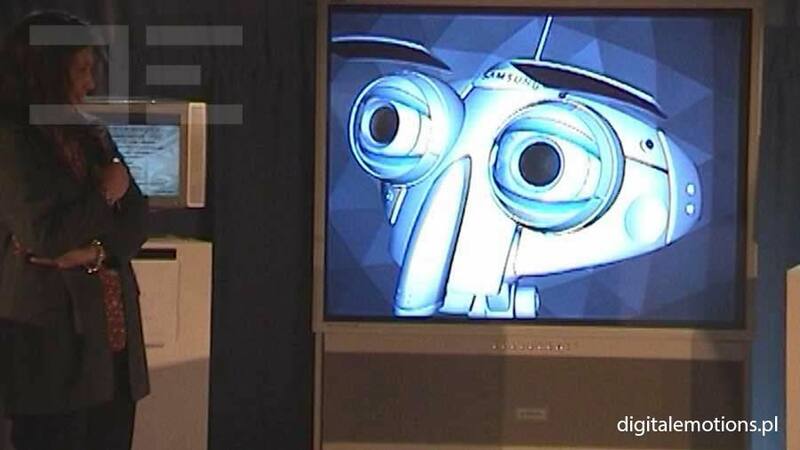 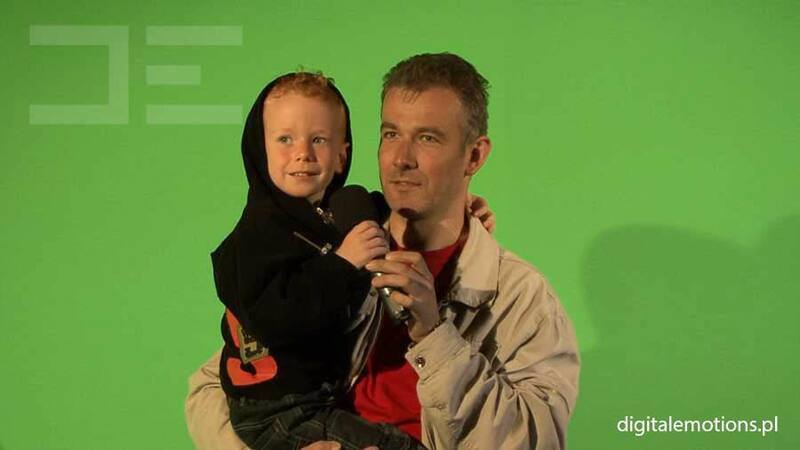 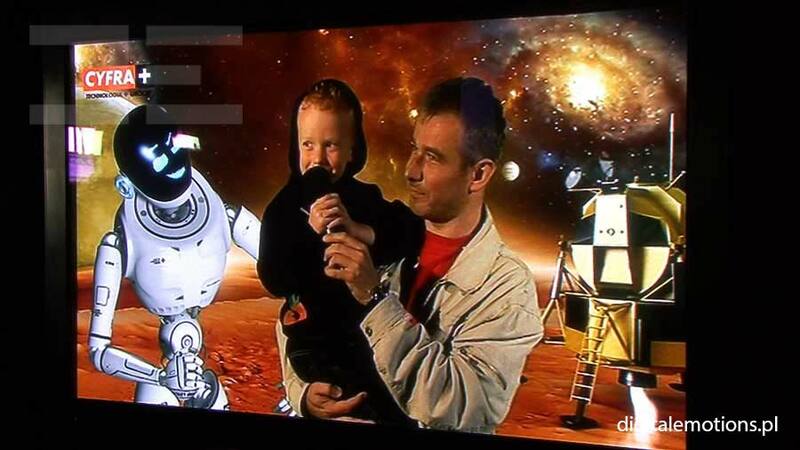 Although we took on the challenge many years ago, it is a great example of the capabilities of using our VIRTUAL PUPPET in TV medium environment. 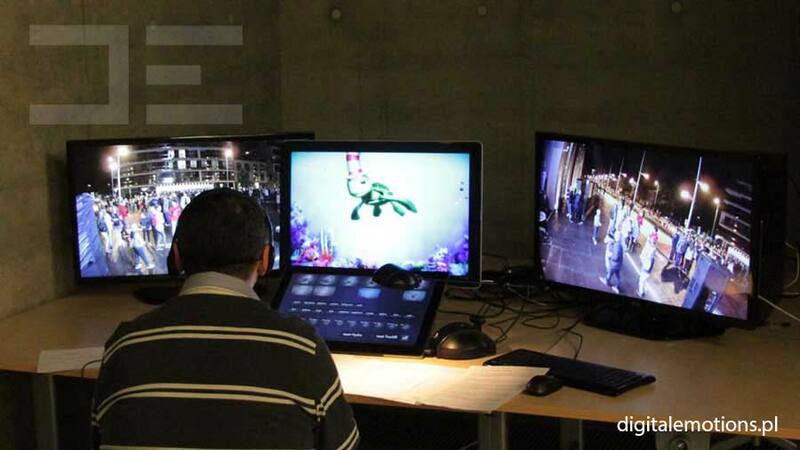 We deliver “live” animation, so we can perform our projects “live”.